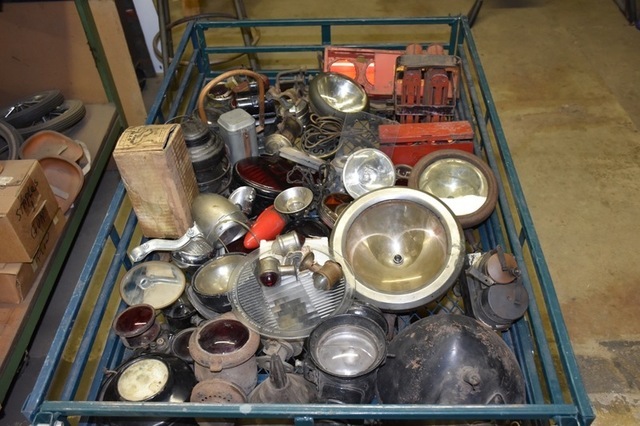 This sale has a huge amount of items and diversification. 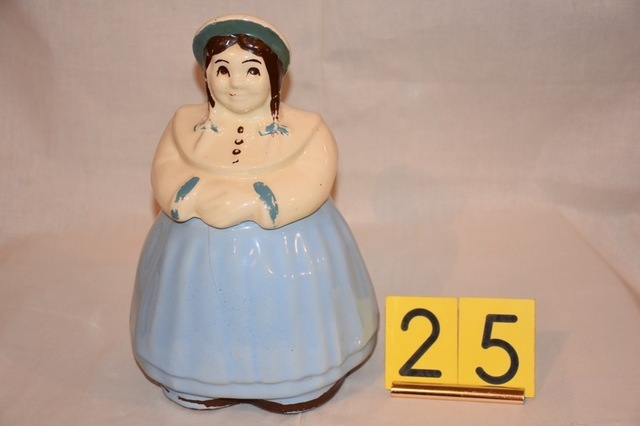 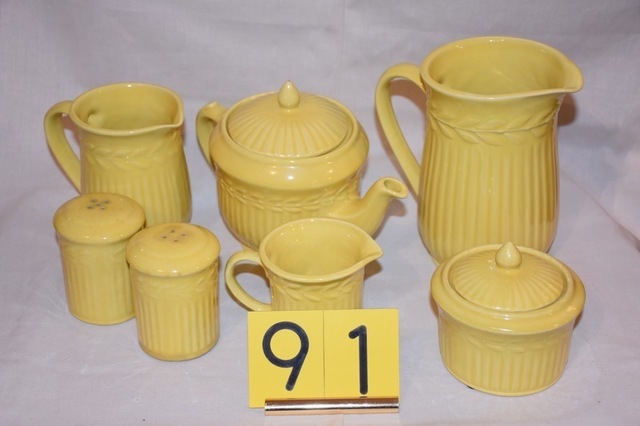 The first part of the Gibson Estate Pottery Collection will be offered including over 125 pieces of Shawnee and Hull pottery, cookie jars, interesting and scarce examples. 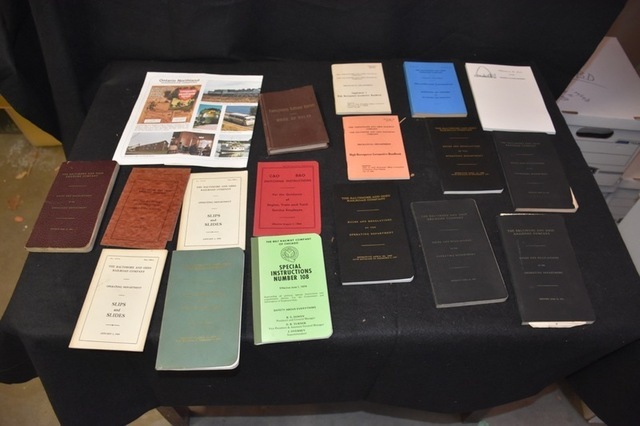 This huge and fantastic collection will be disbursed at our upcoming events. 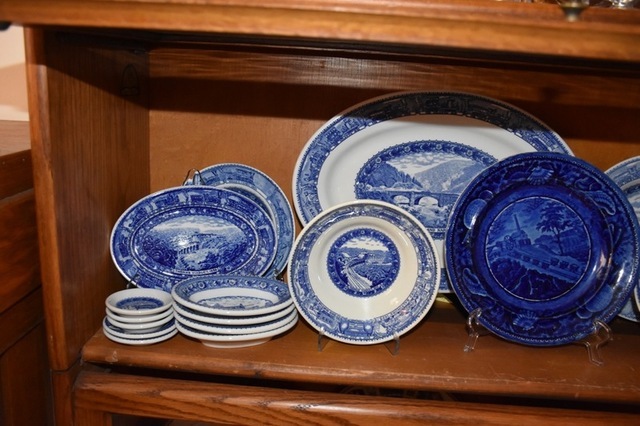 The Gibson’s collection was documented in many books on Shawnee pottery. 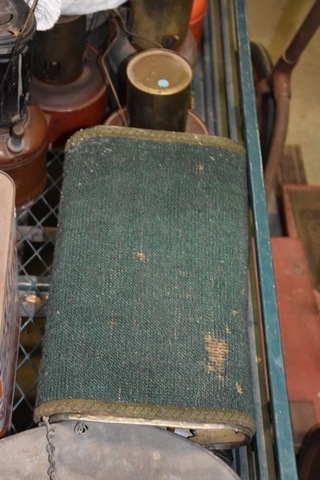 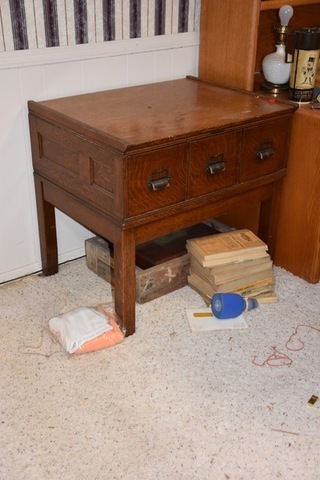 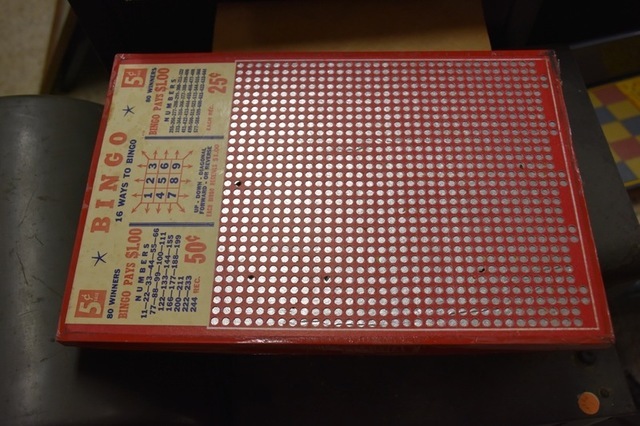 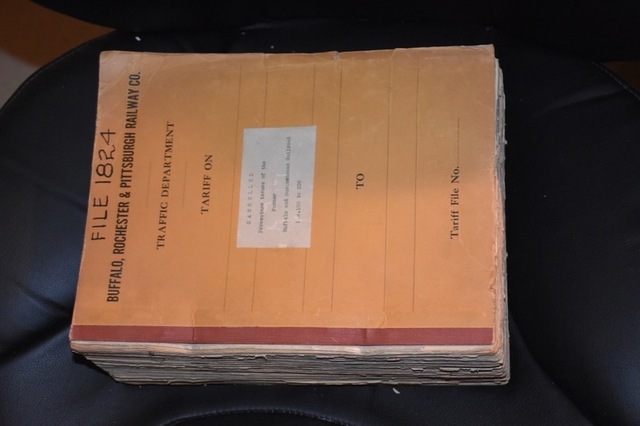 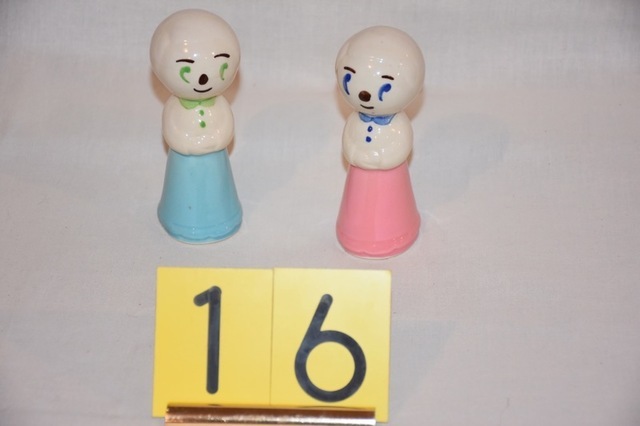 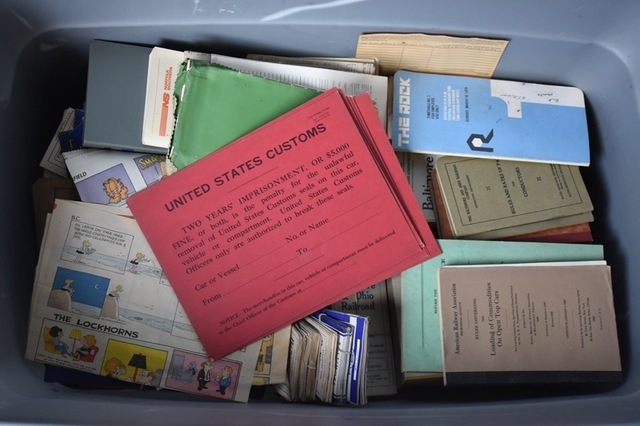 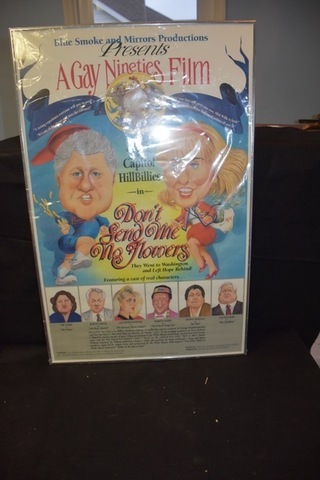 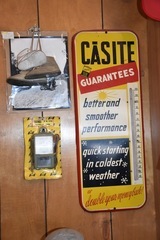 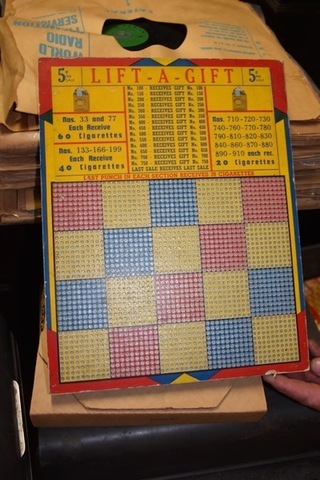 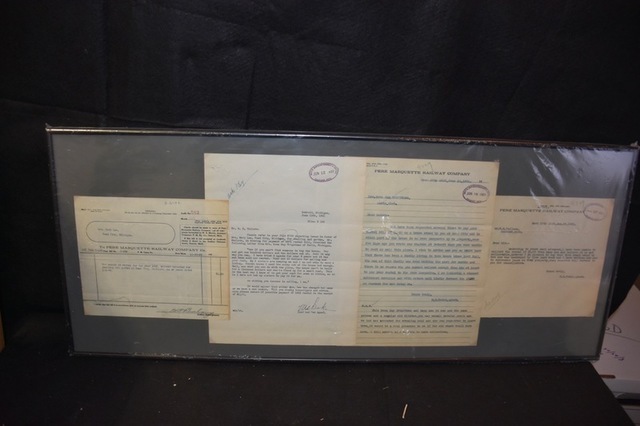 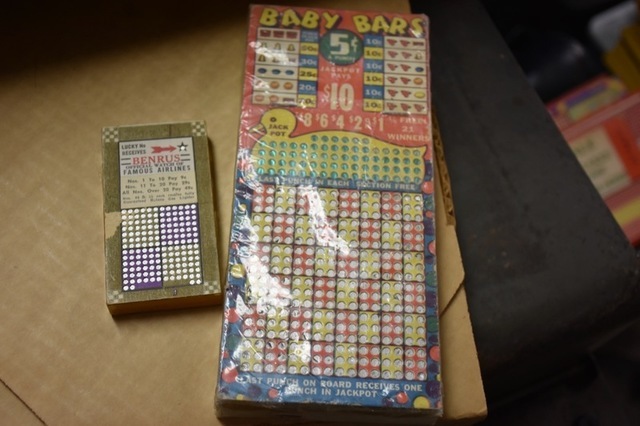 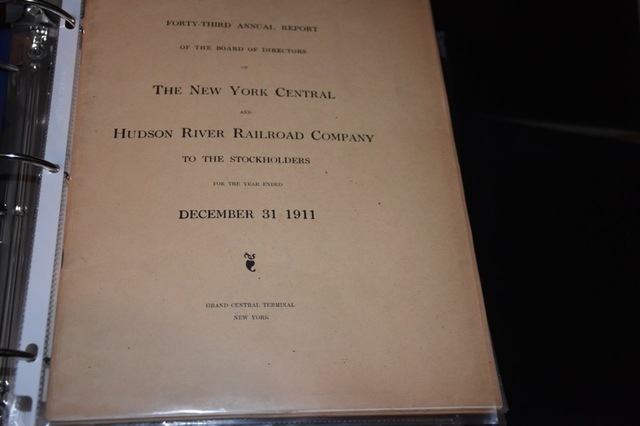 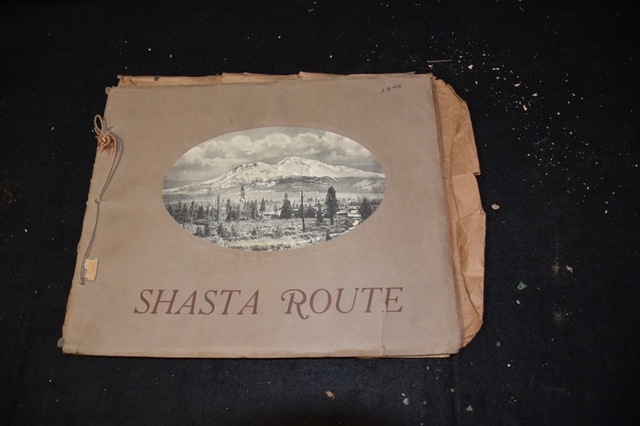 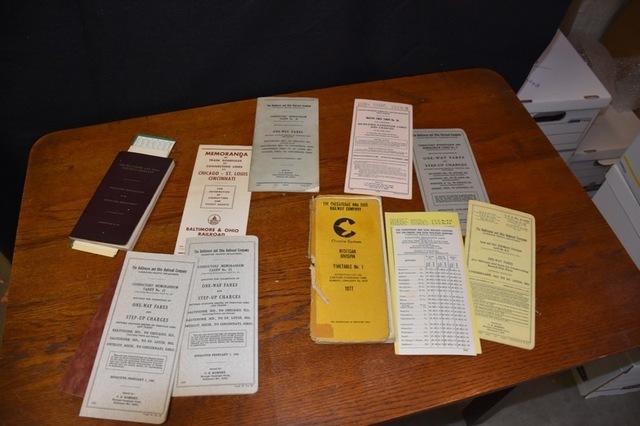 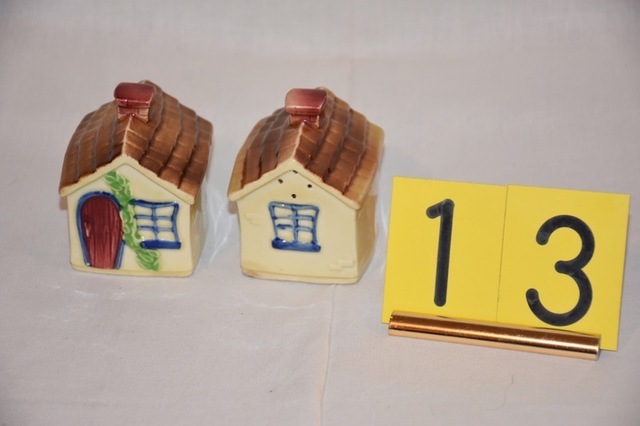 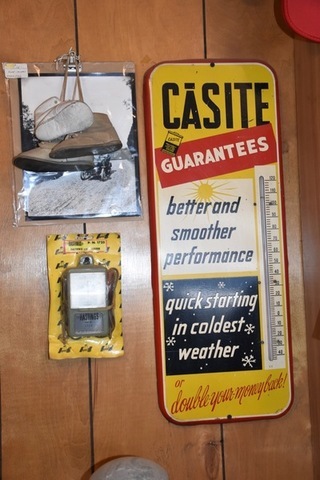 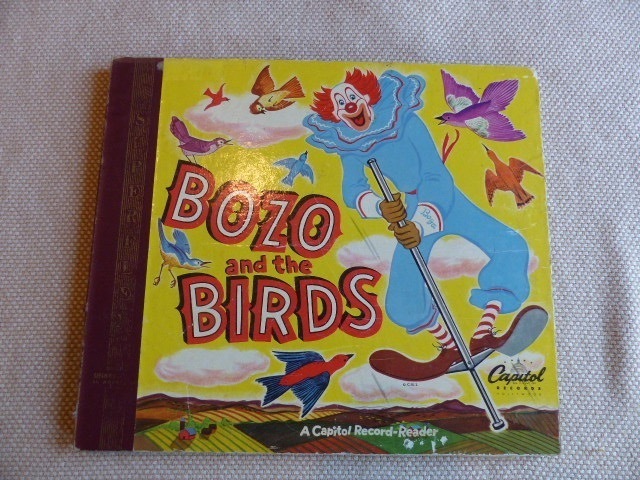 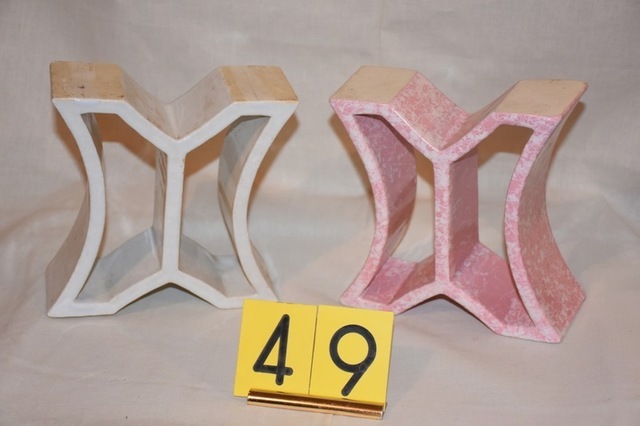 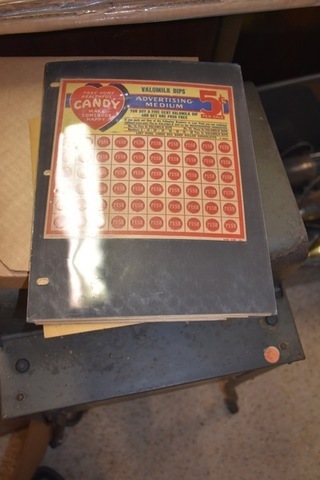 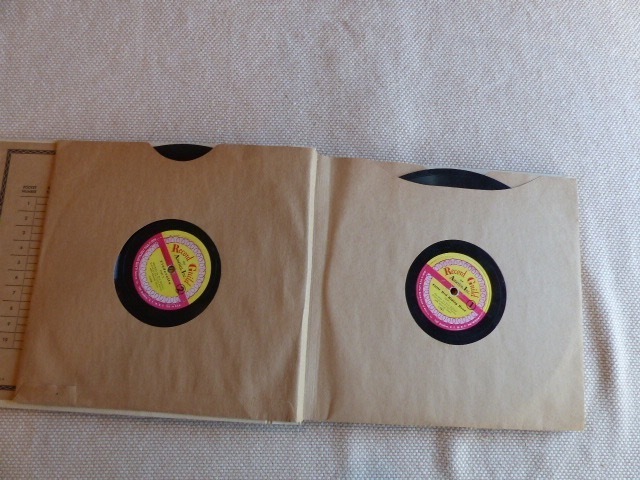 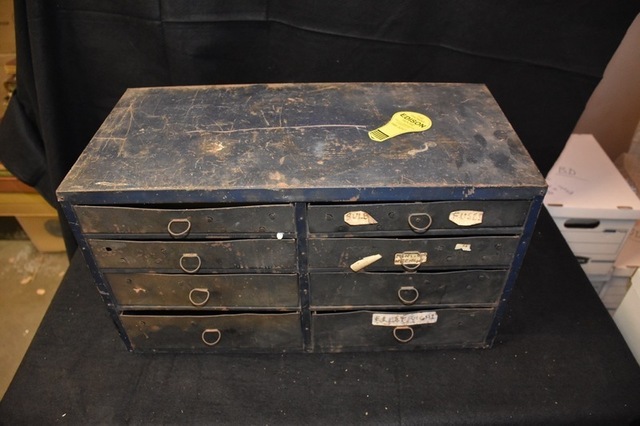 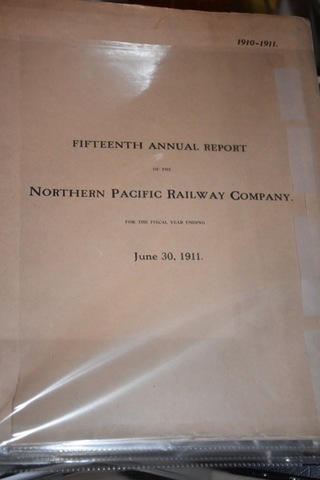 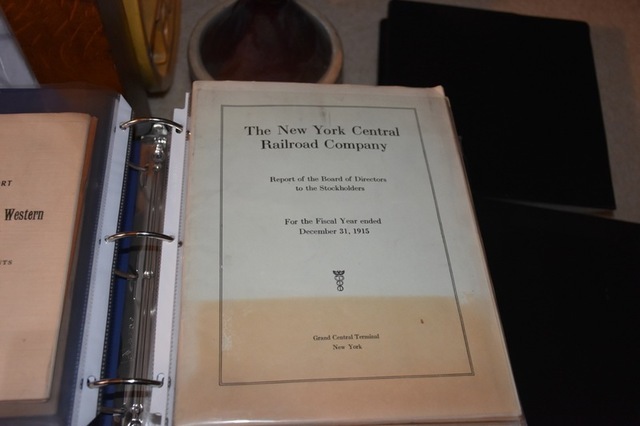 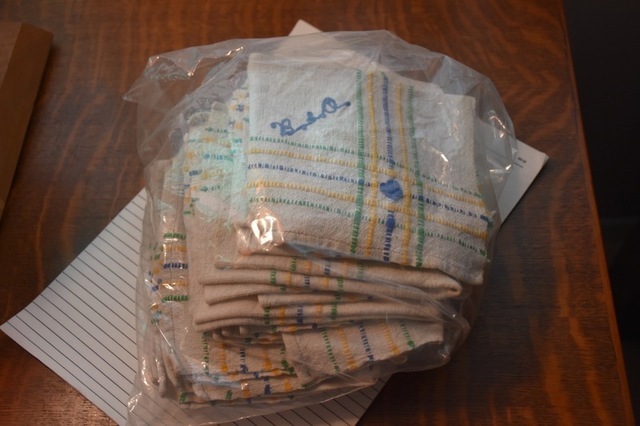 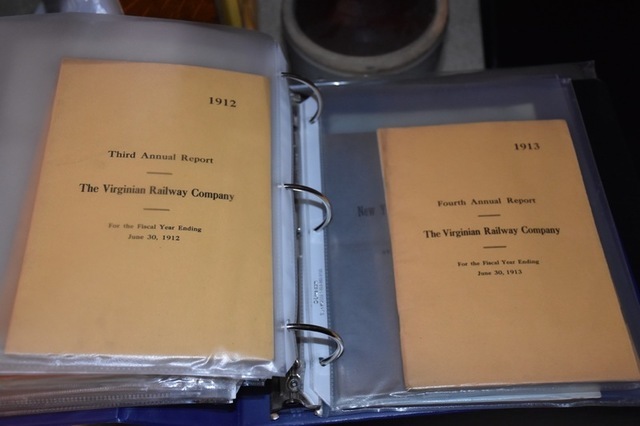 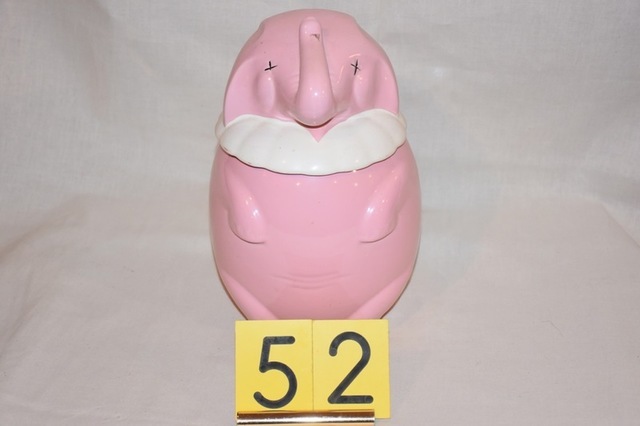 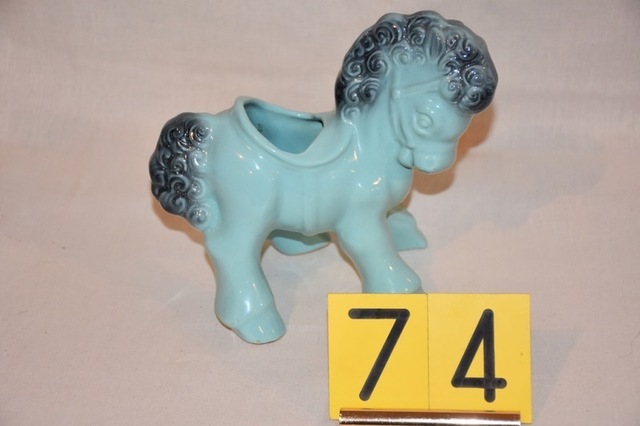 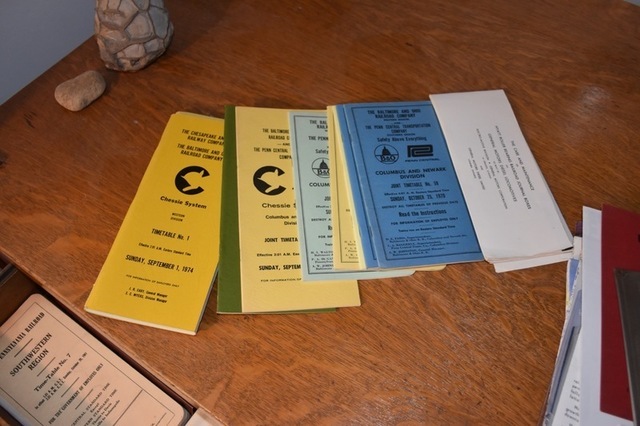 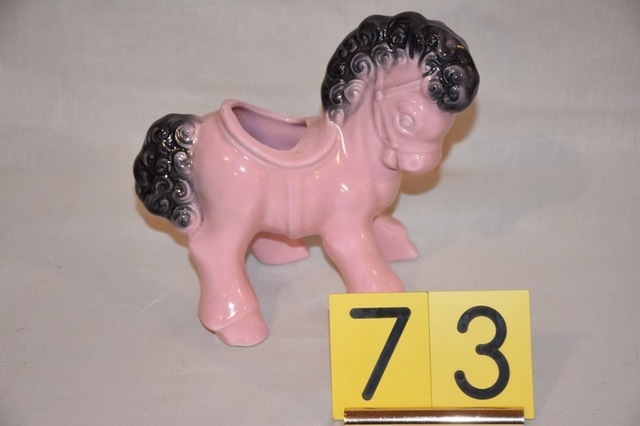 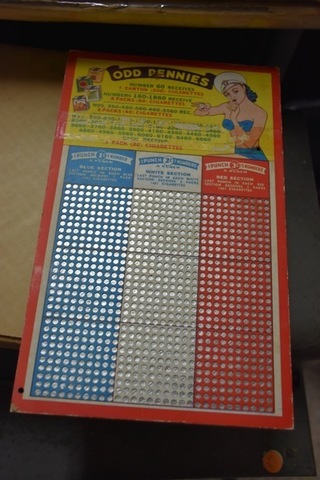 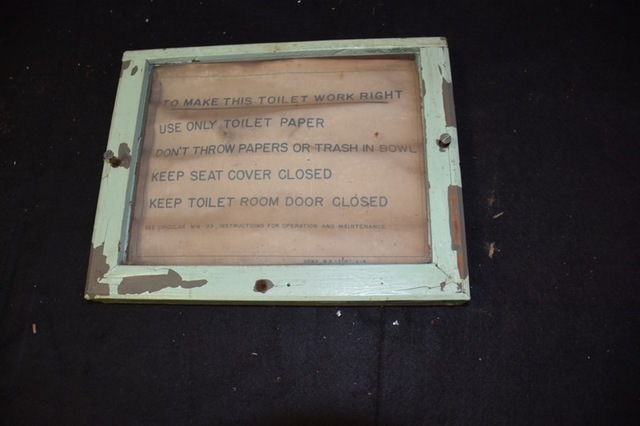 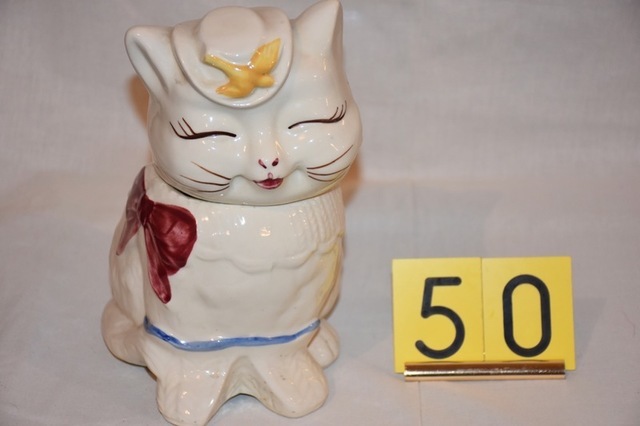 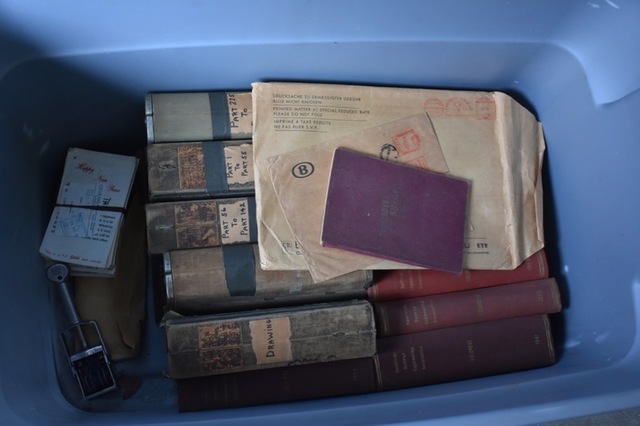 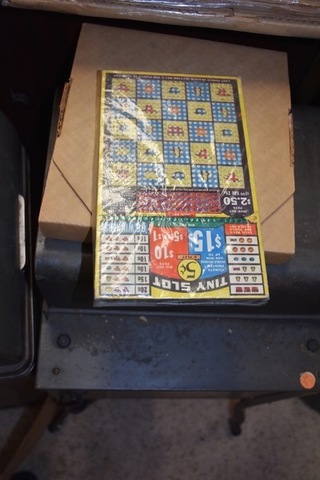 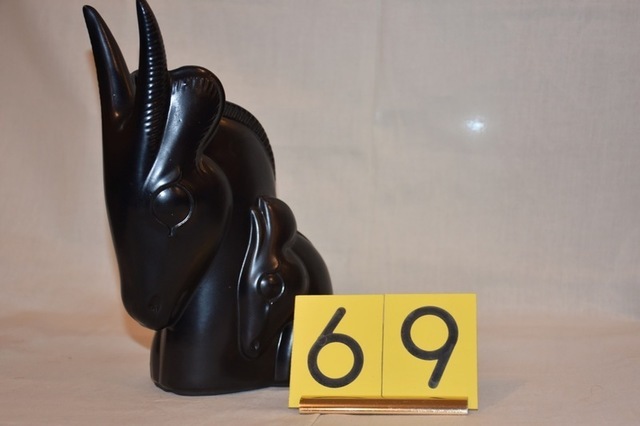 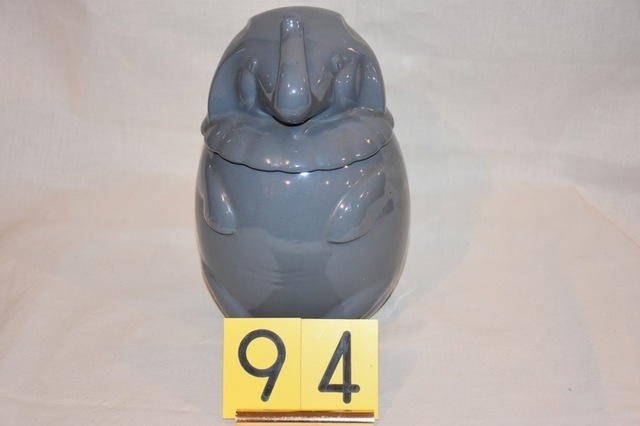 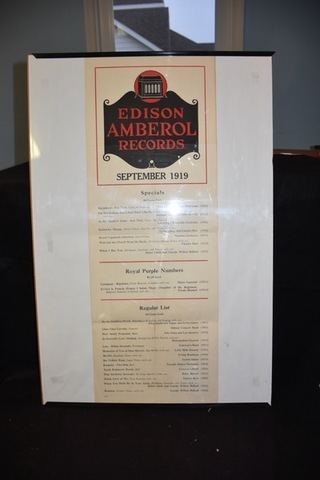 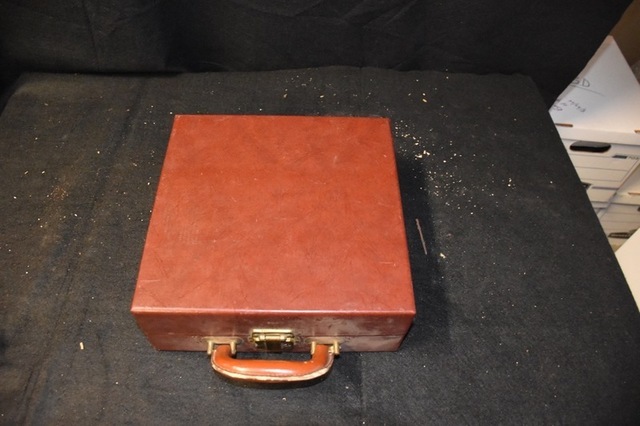 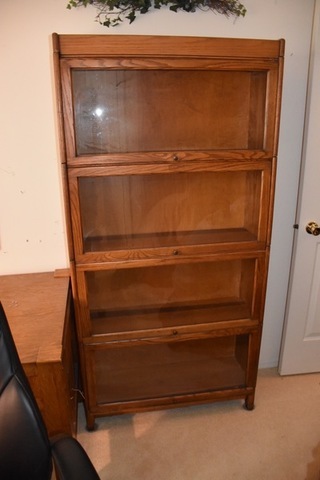 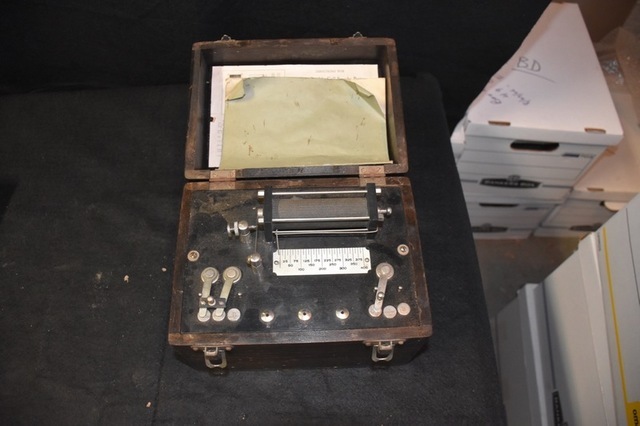 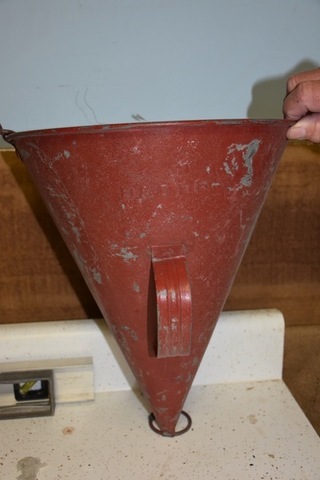 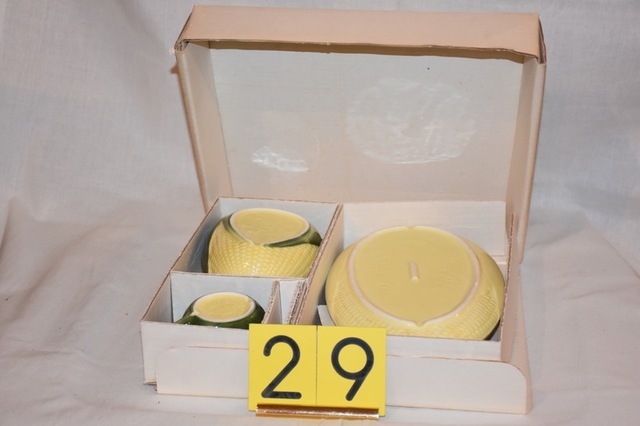 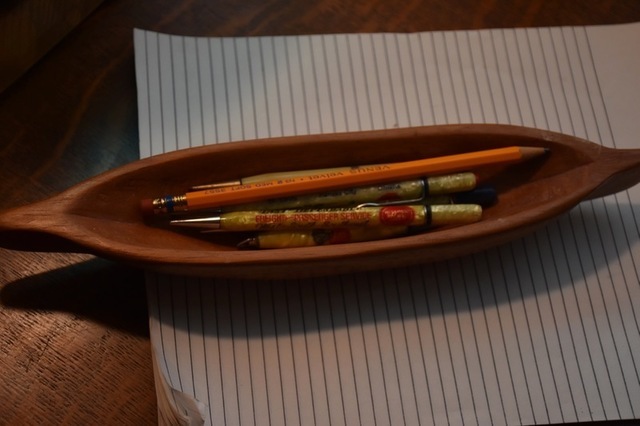 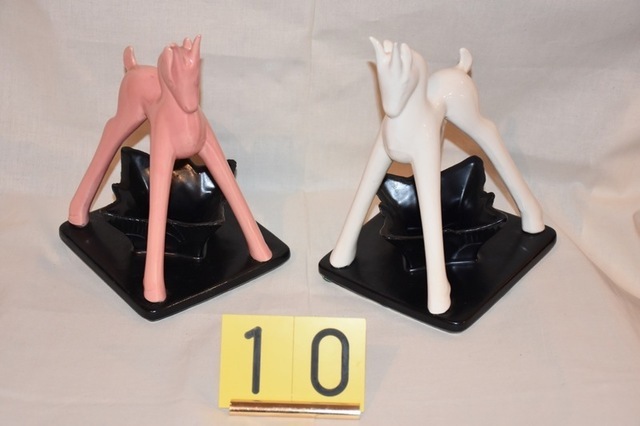 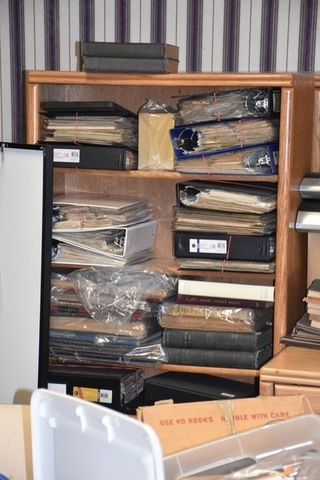 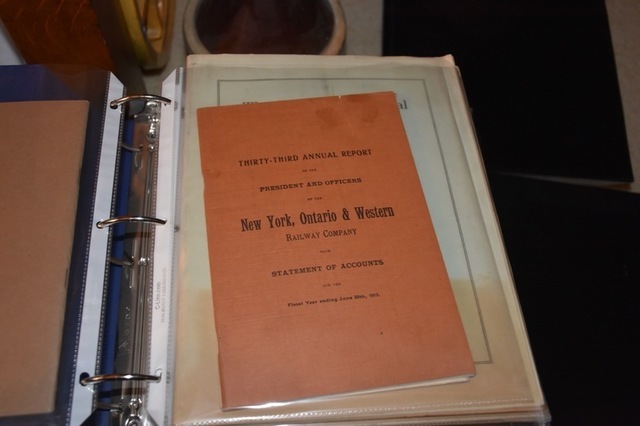 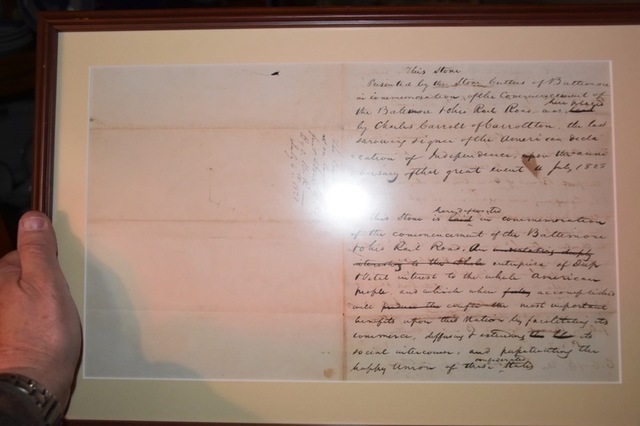 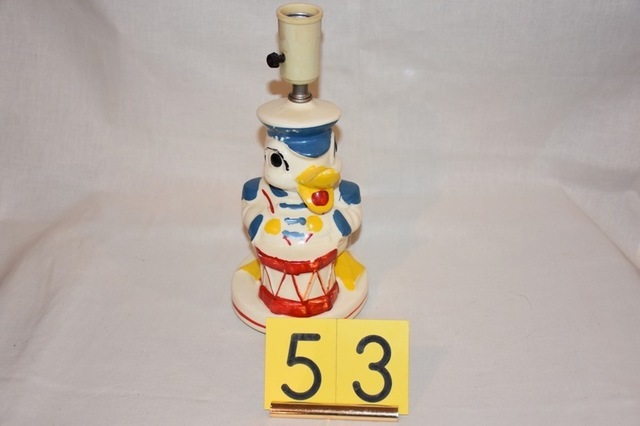 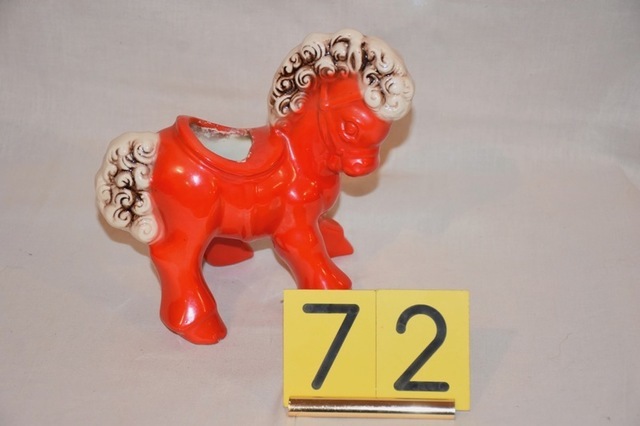 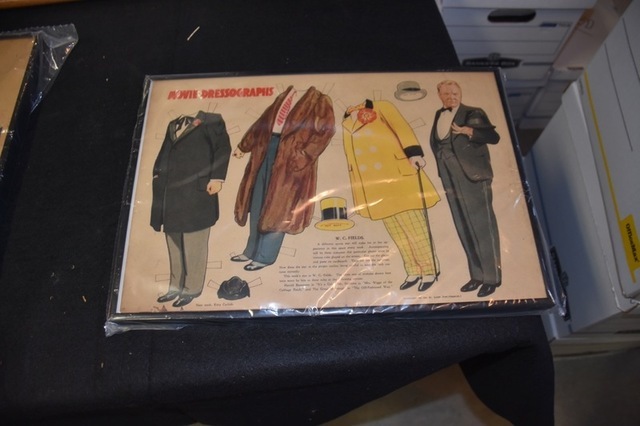 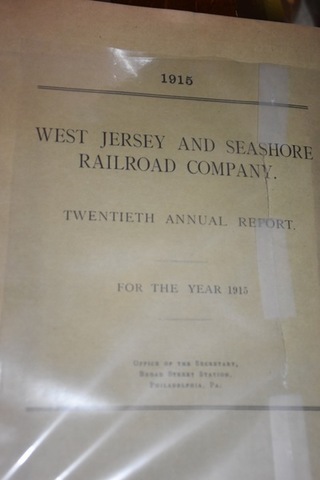 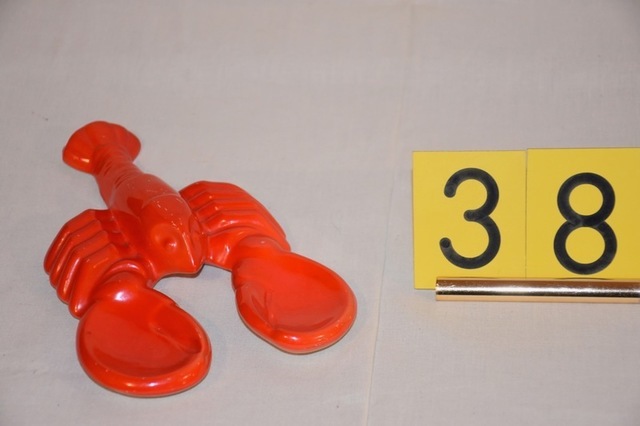 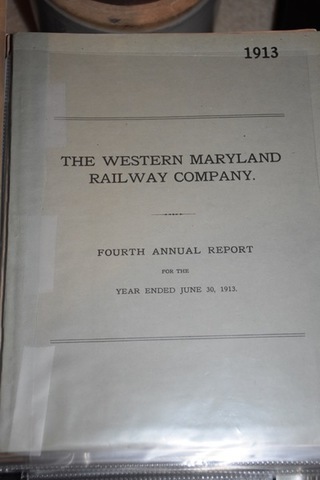 The catalog of the items being sold at this auction is posted under documents. 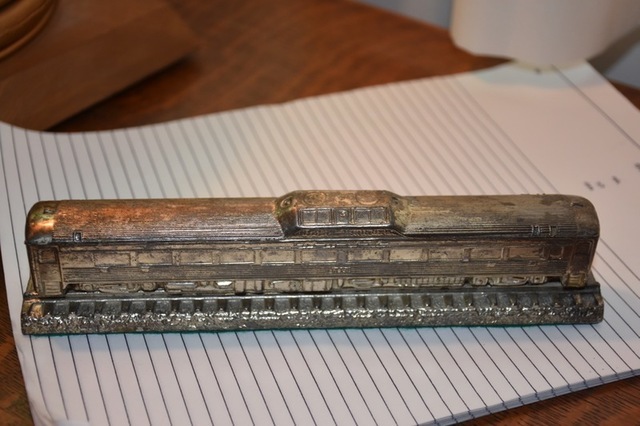 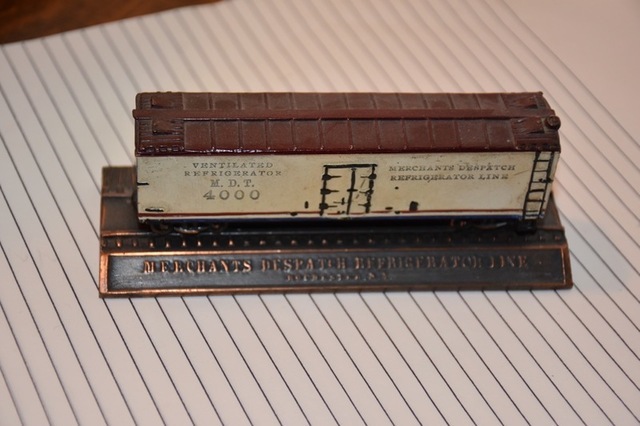 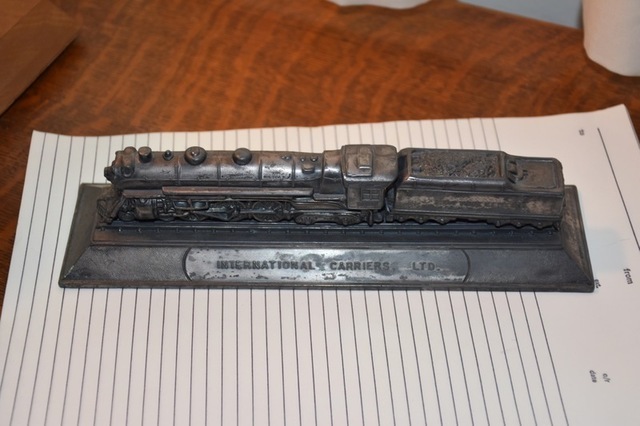 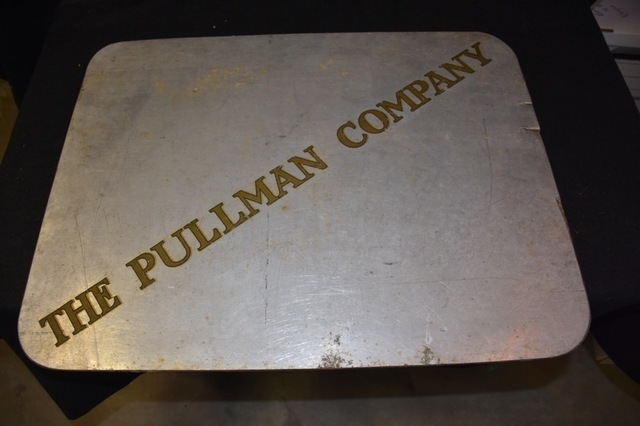 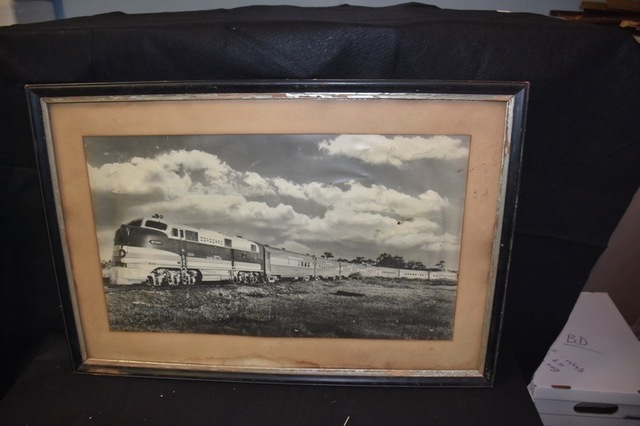 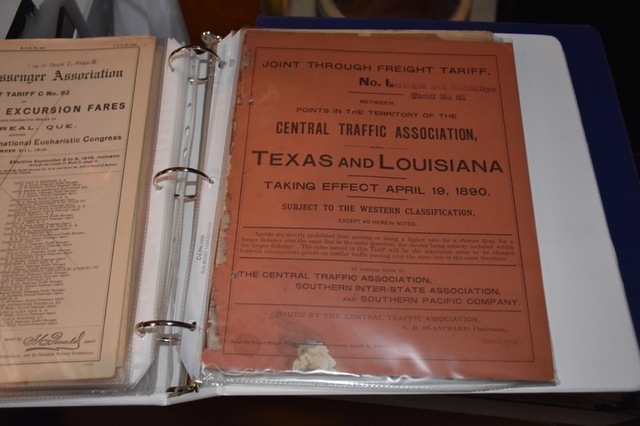 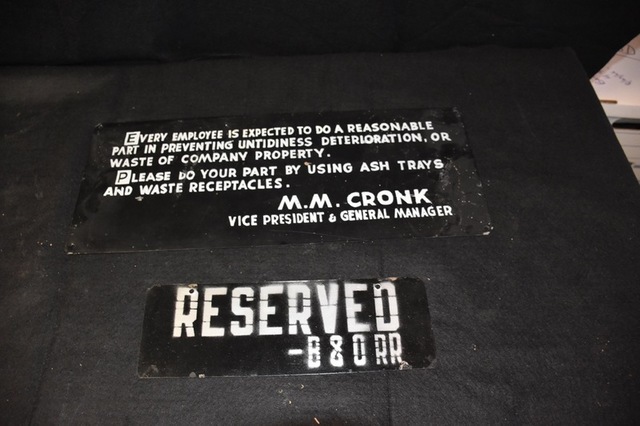 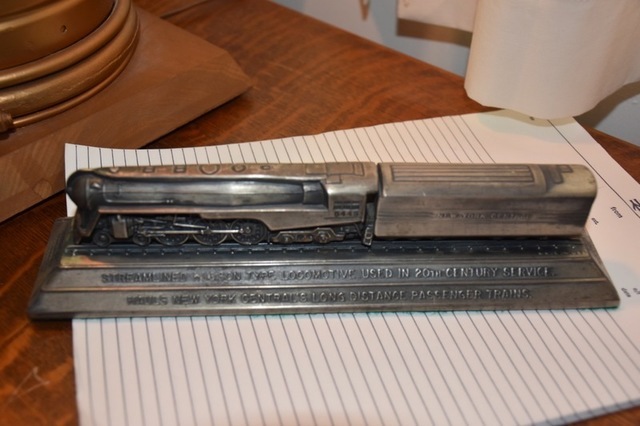 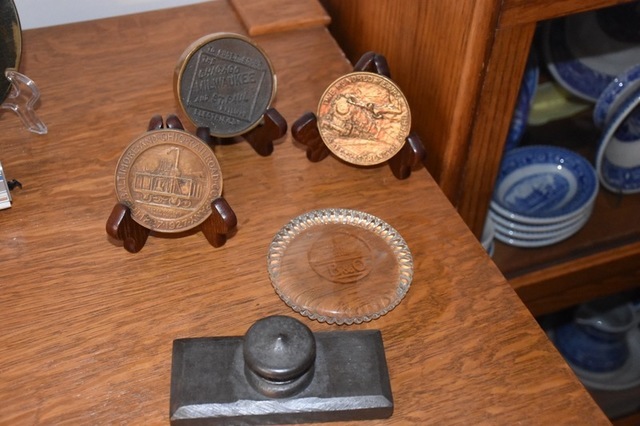 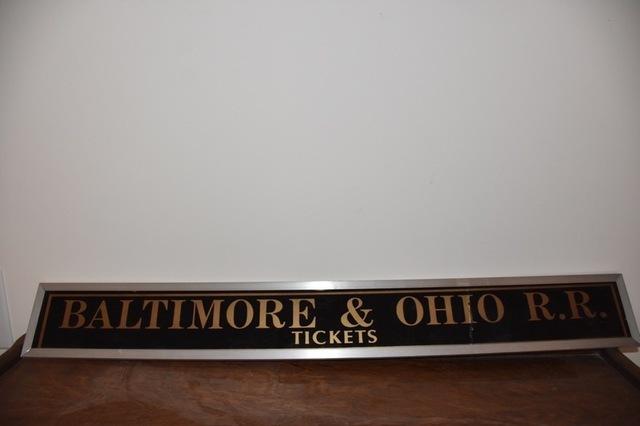 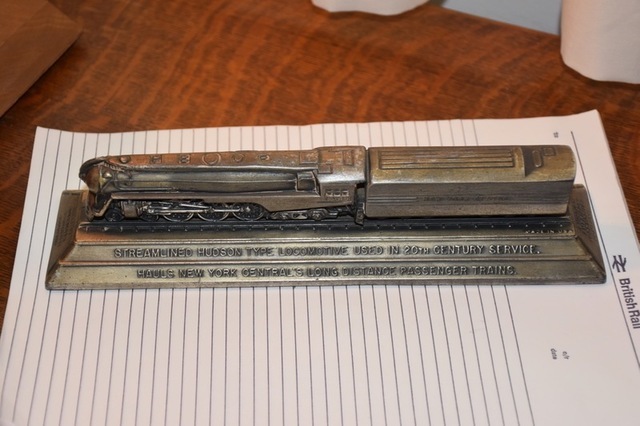 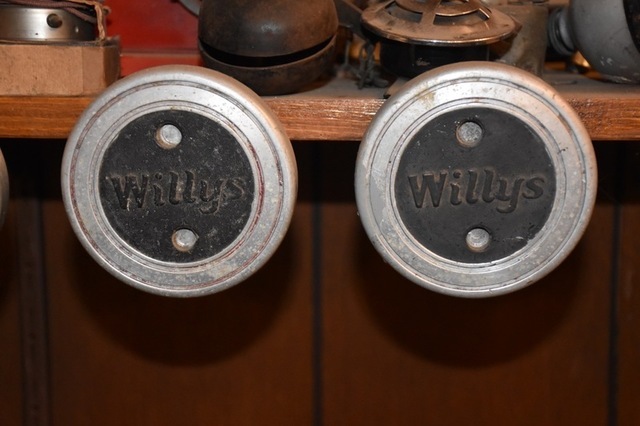 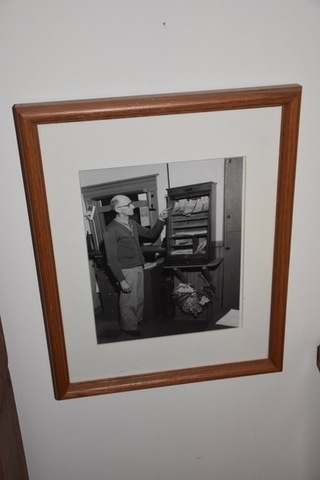 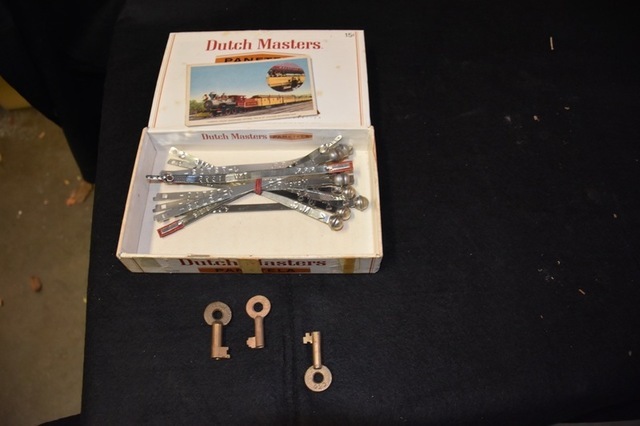 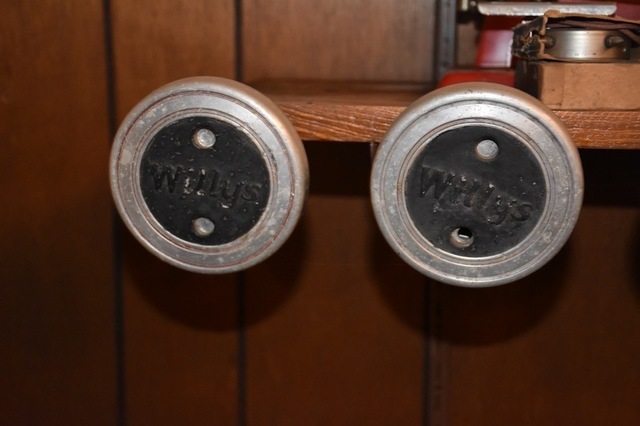 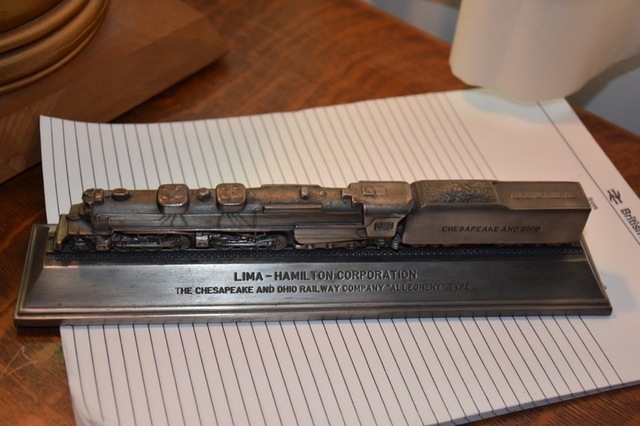 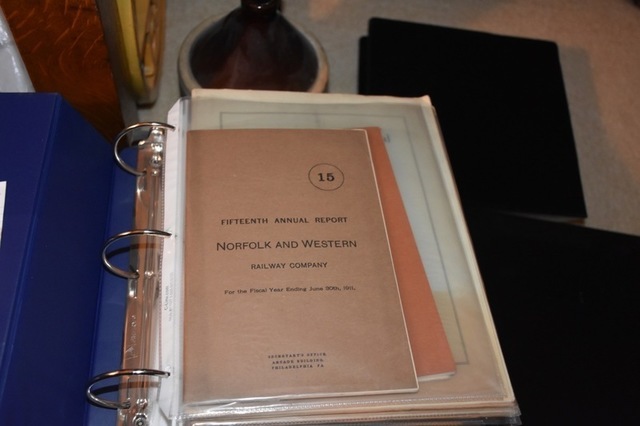 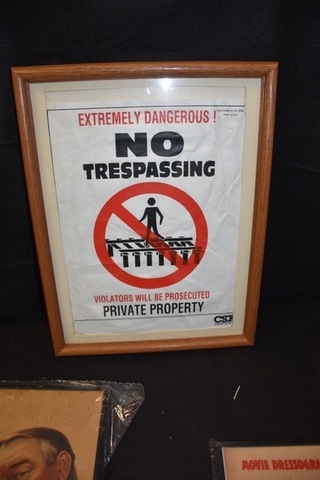 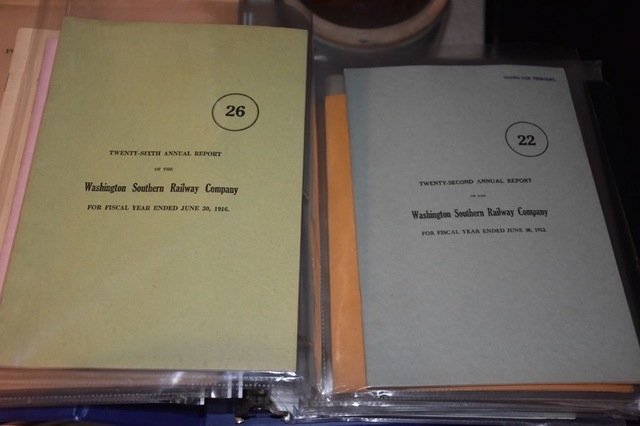 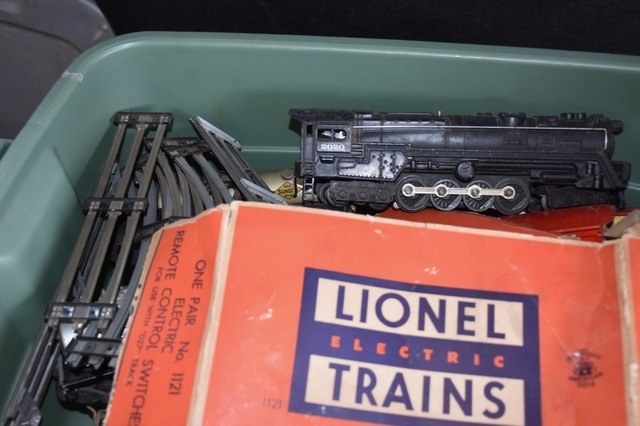 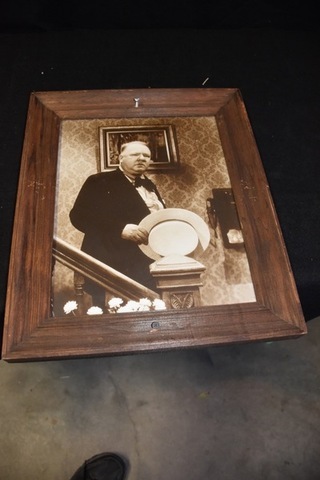 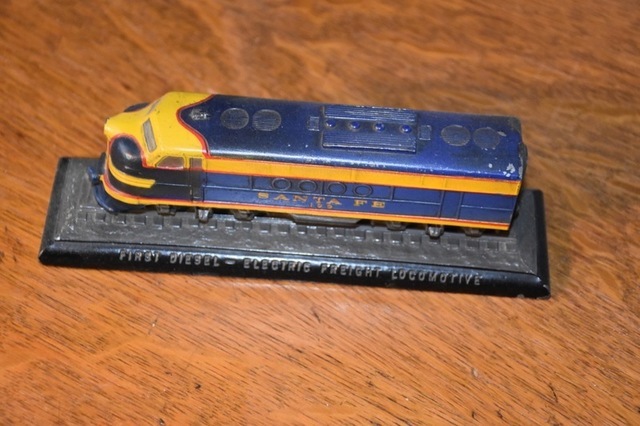 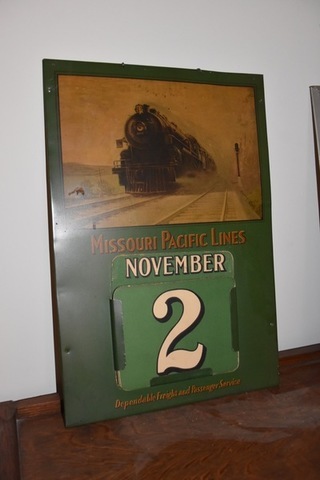 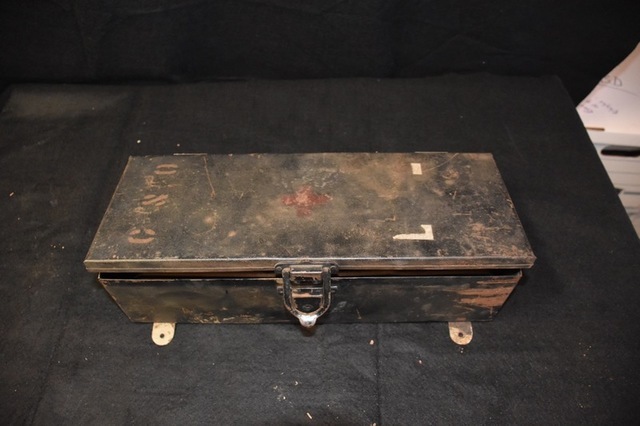 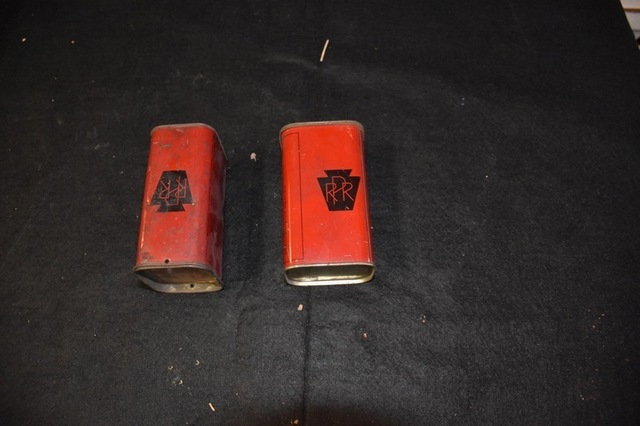 Next is the William “Bill” Dixon Estate collection of Railroad items from Hastings, Nebraska. 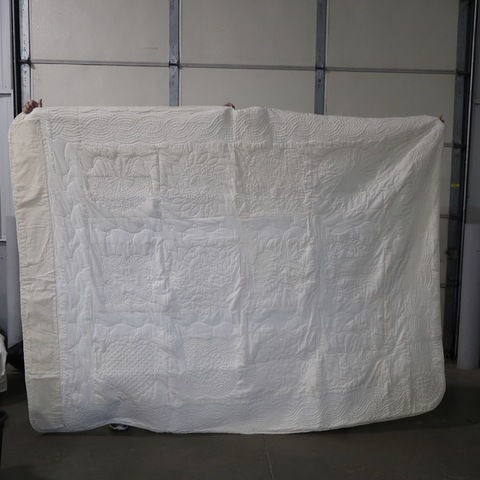 This is huge. 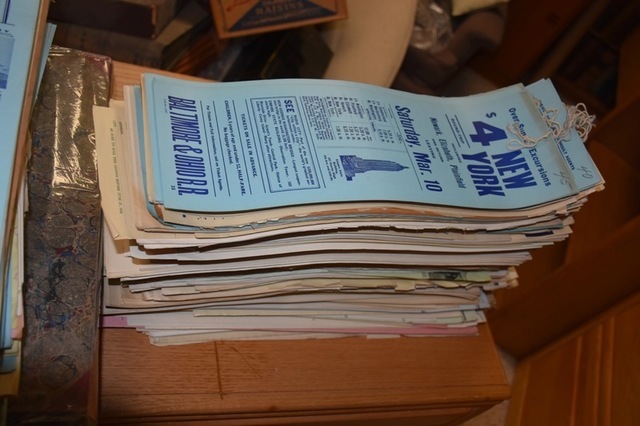 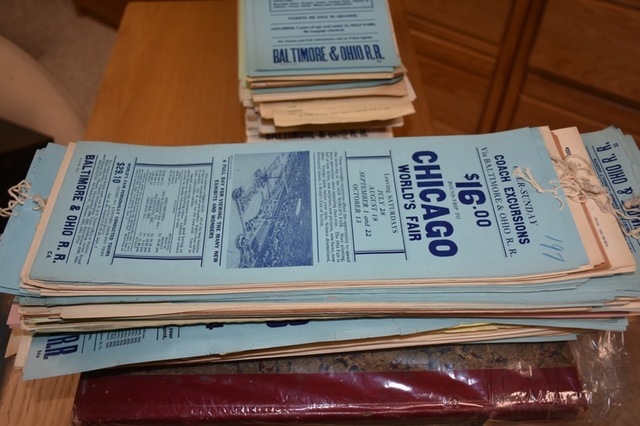 Hundreds and most likely thousands of pieces of paper, catalogs, manuals, etc. 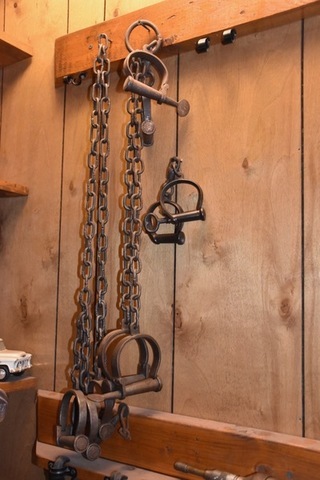 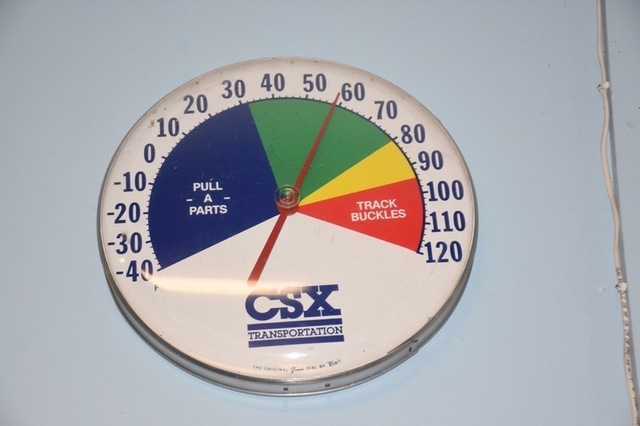 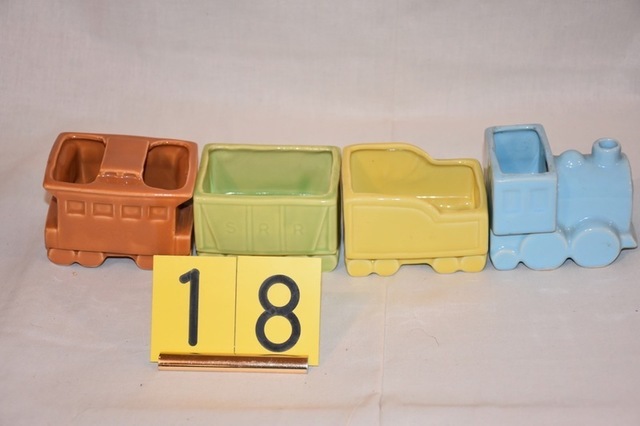 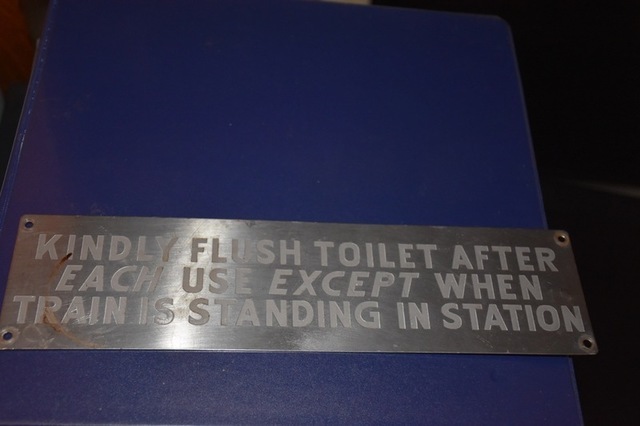 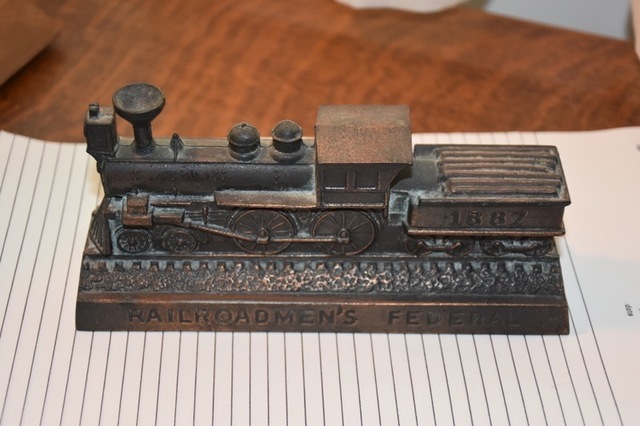 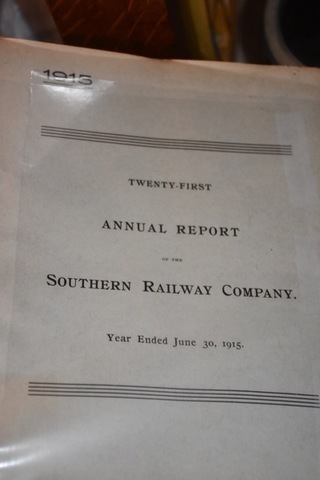 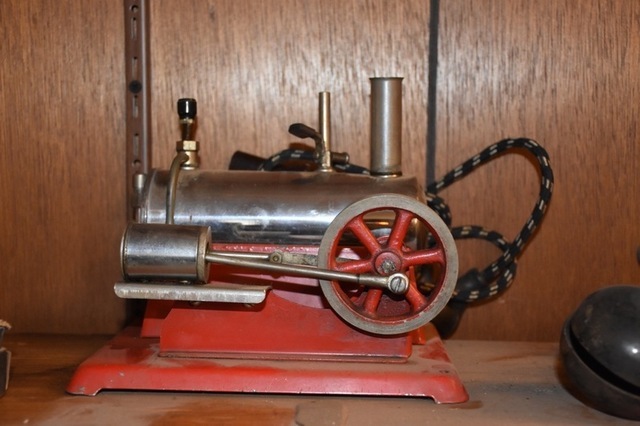 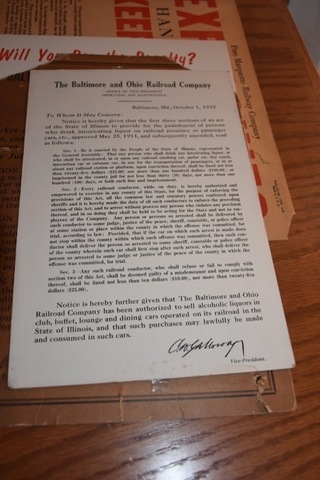 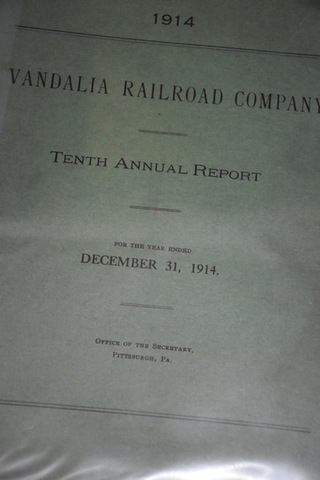 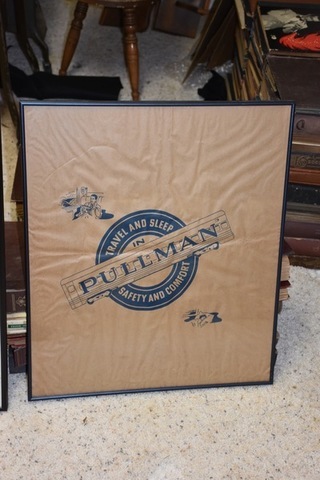 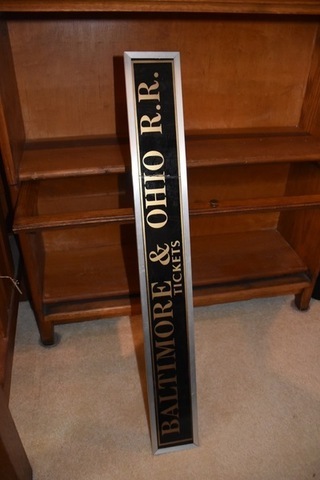 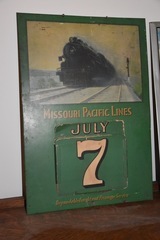 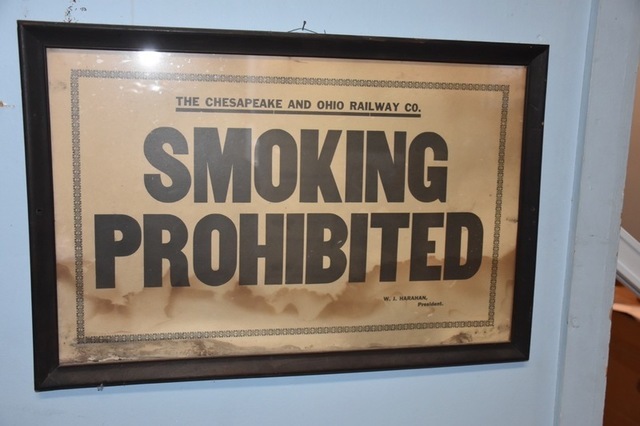 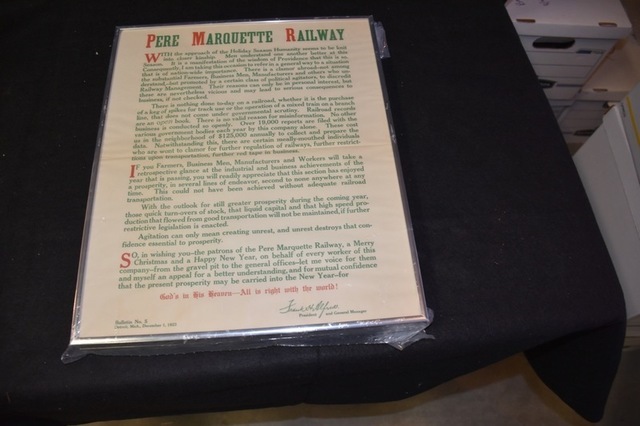 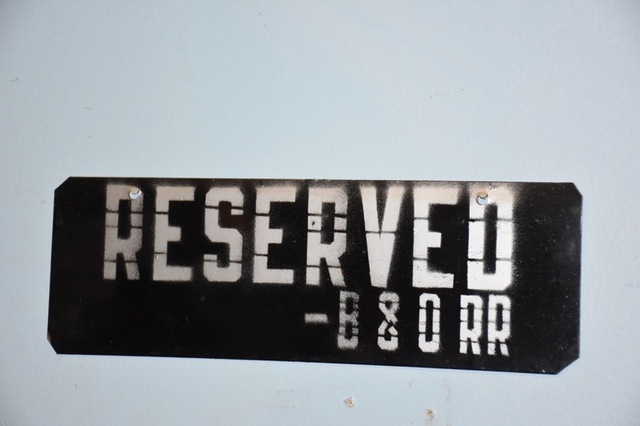 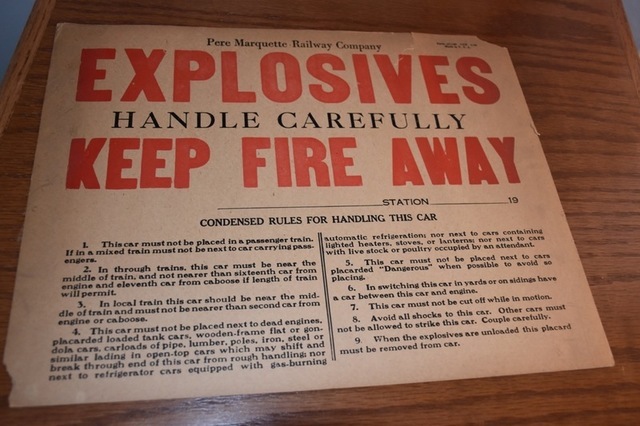 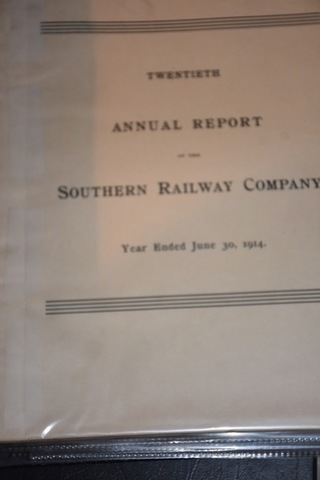 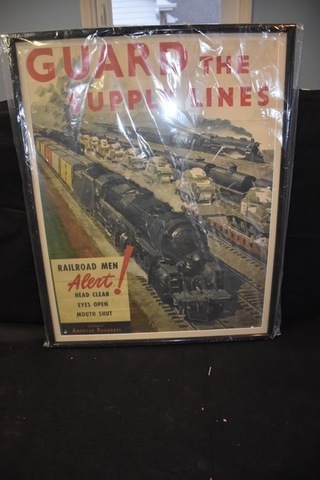 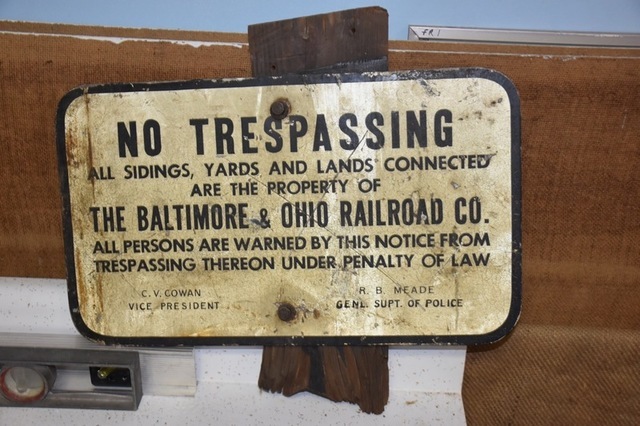 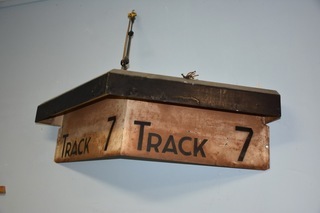 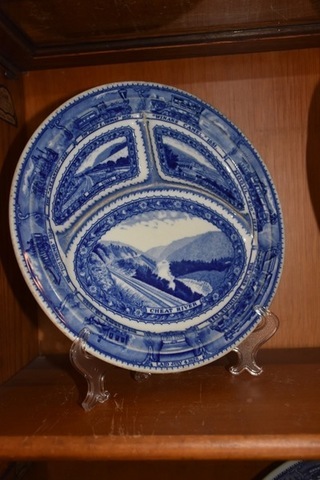 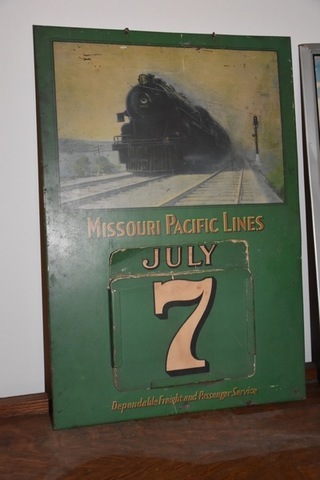 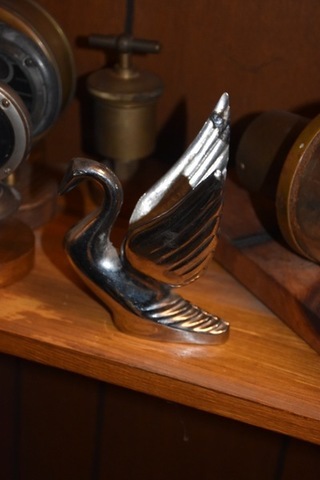 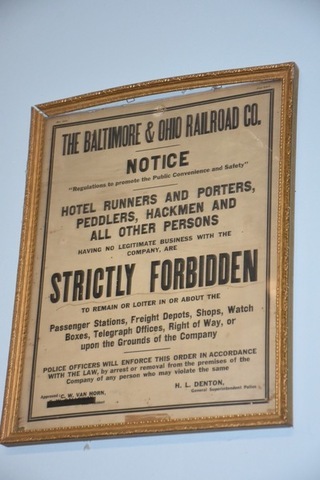 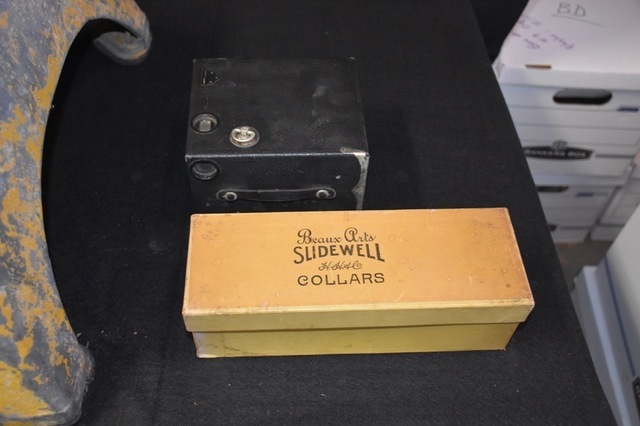 in addition to the standard railroad items will be sold. 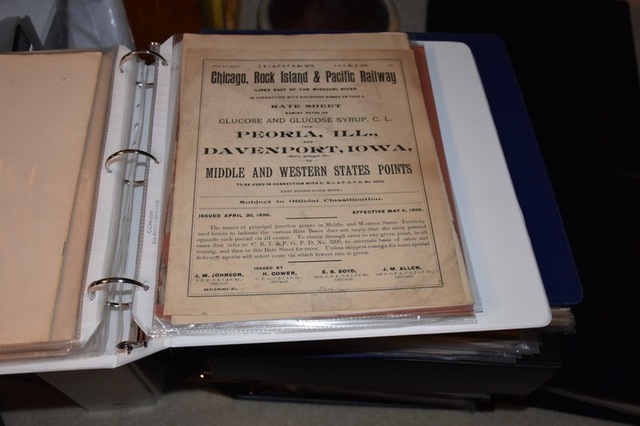 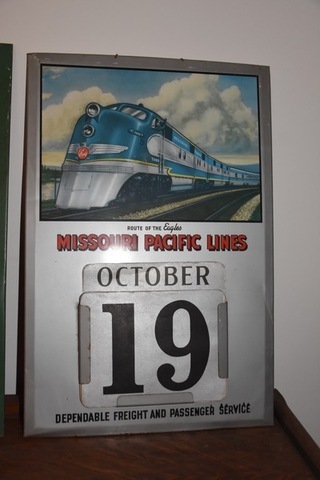 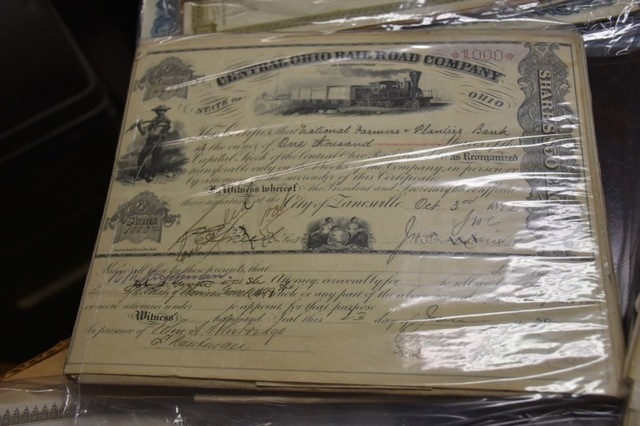 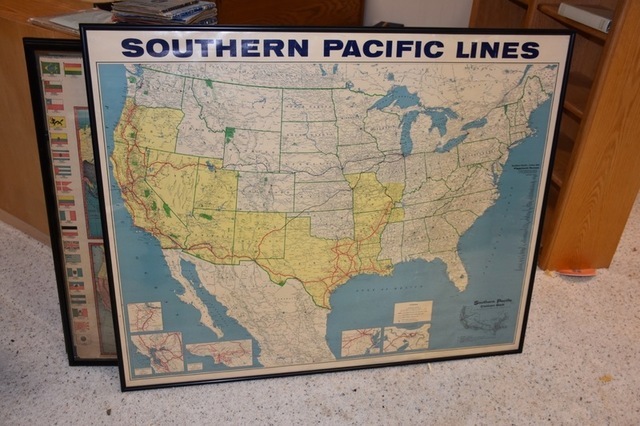 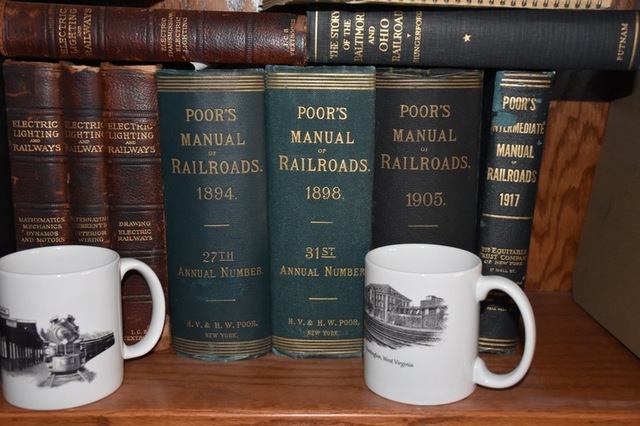 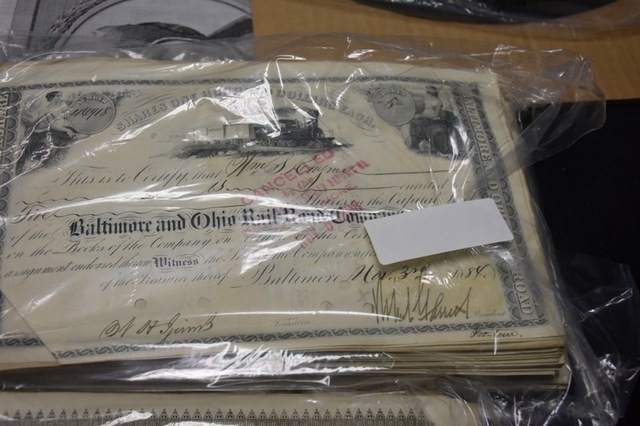 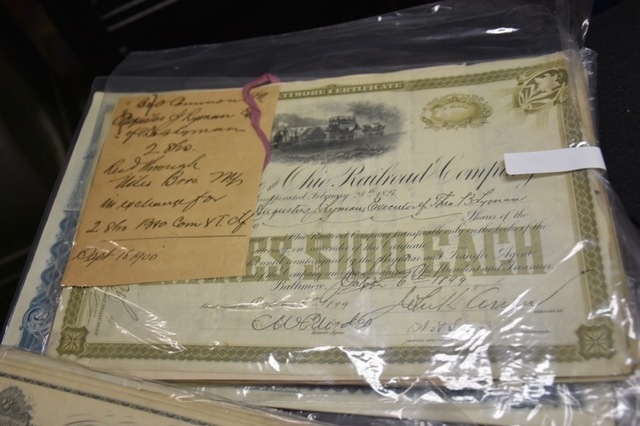 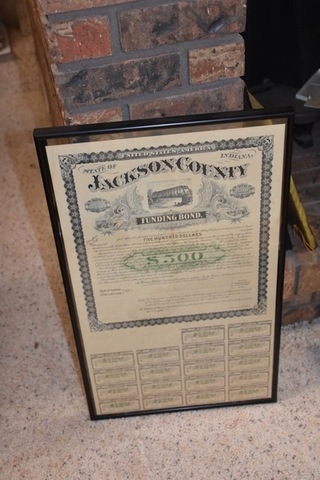 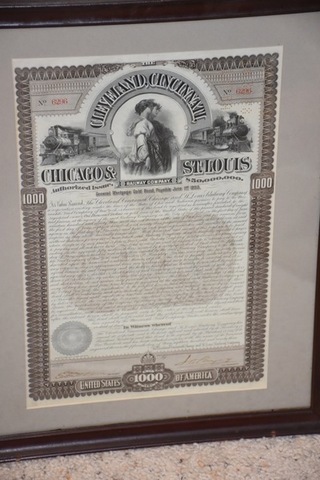 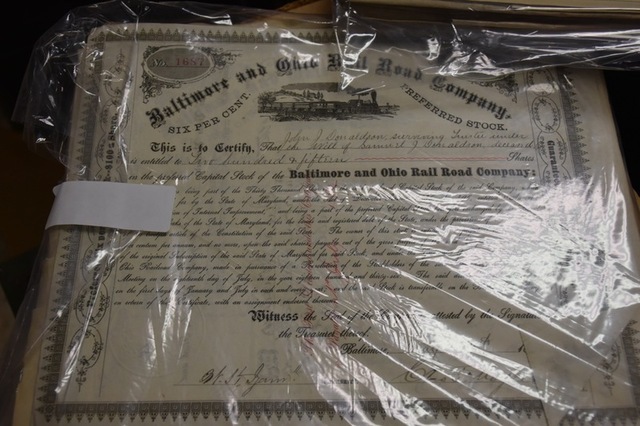 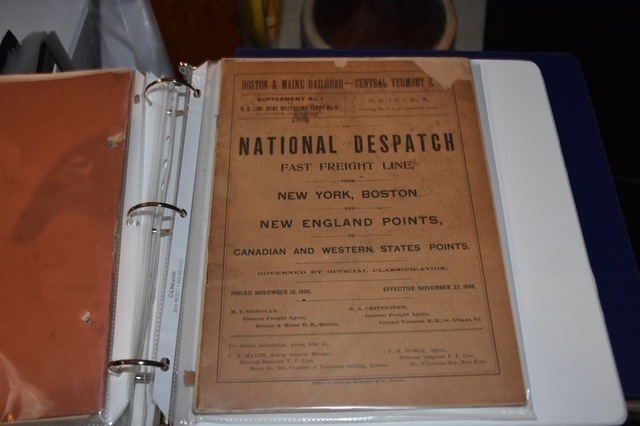 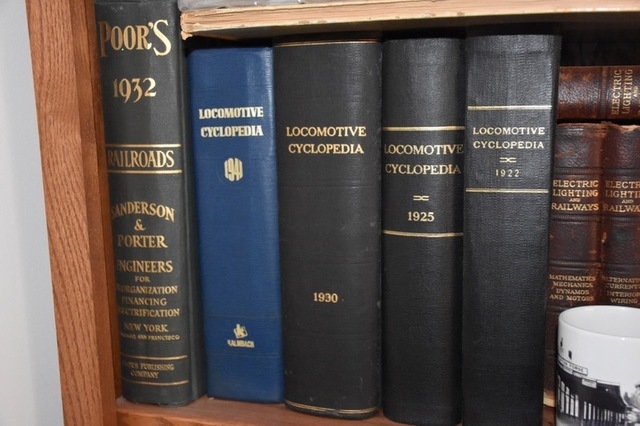 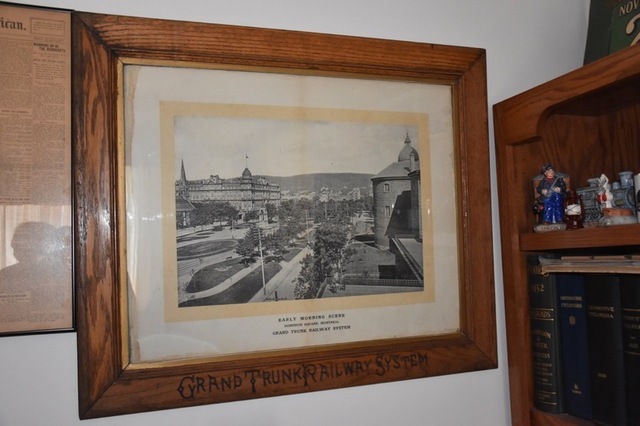 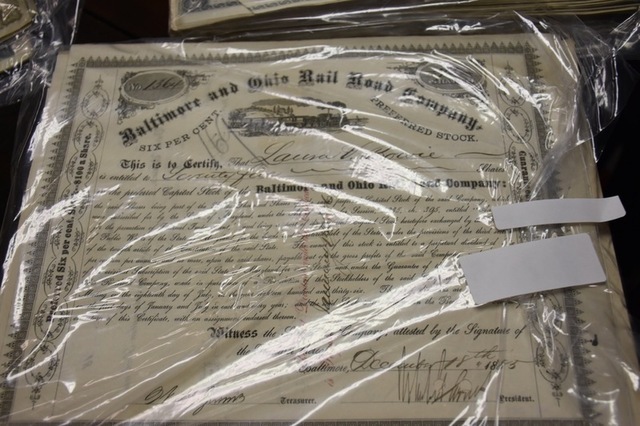 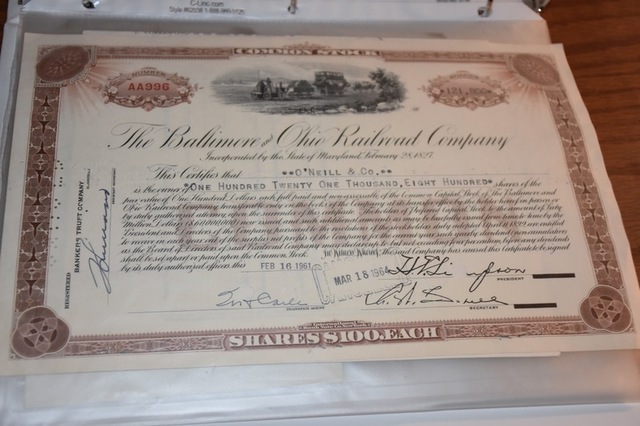 As we briefly glanced at the collection while loading it in Nebraska it was obvious that just about every railroad was represented from 1900 on, in reports, stock certificates, trip opportunities posted at the depots, etc. 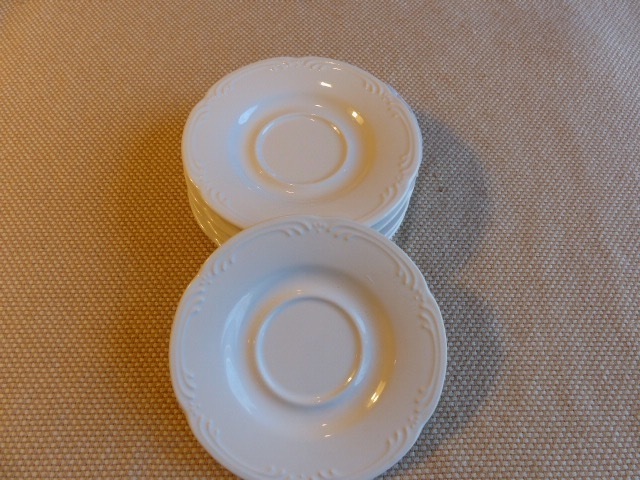 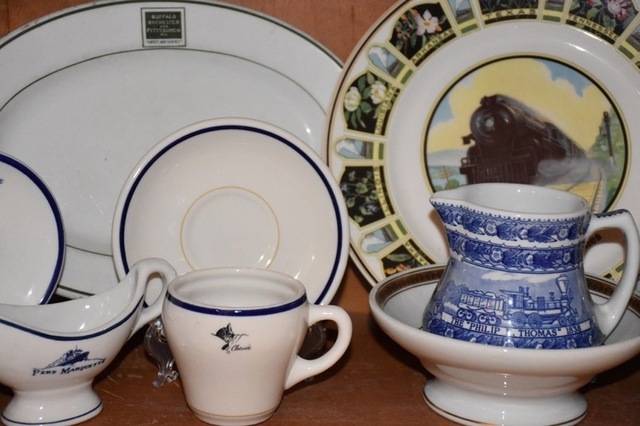 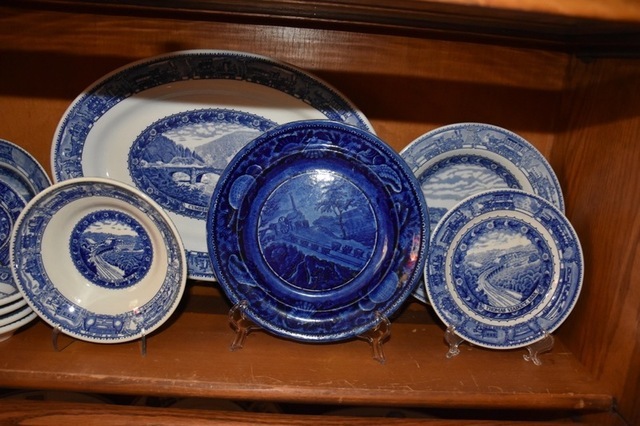 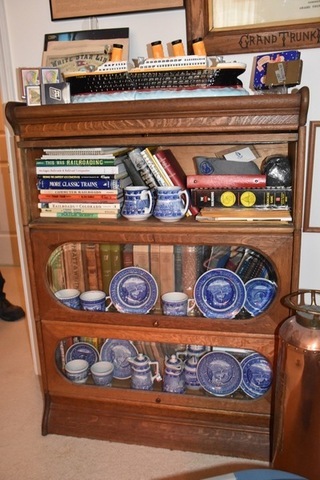 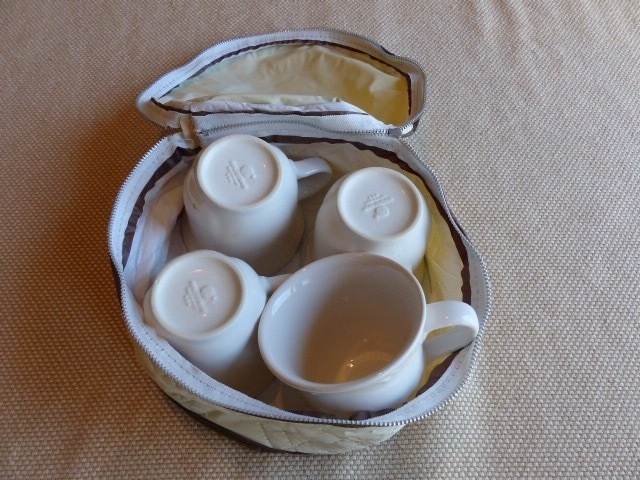 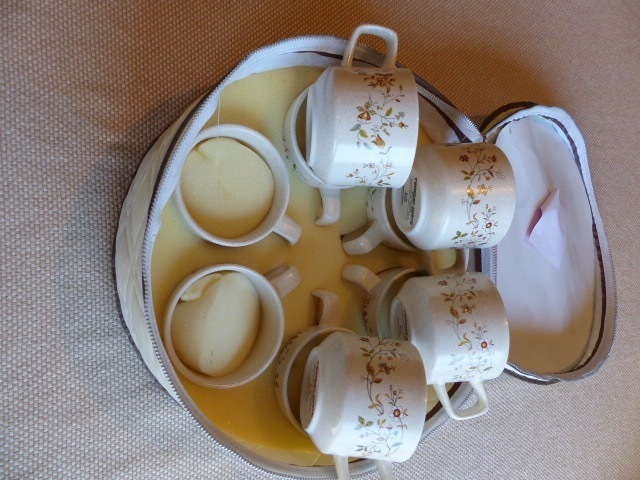 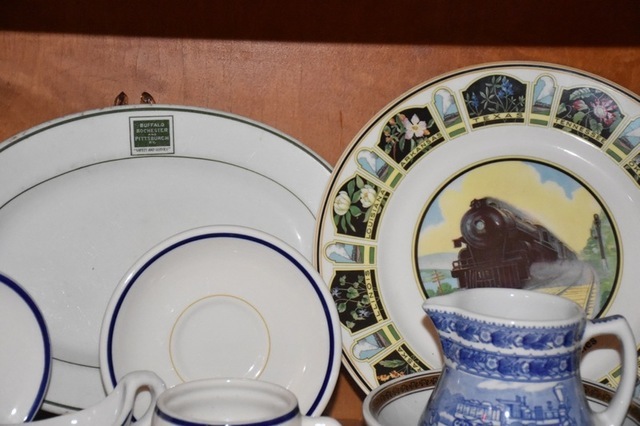 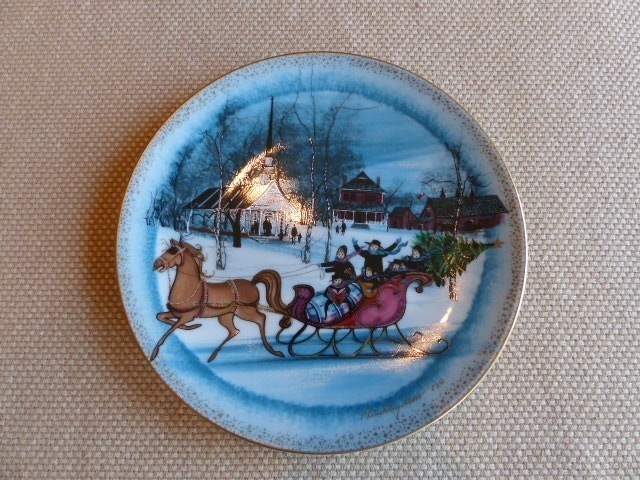 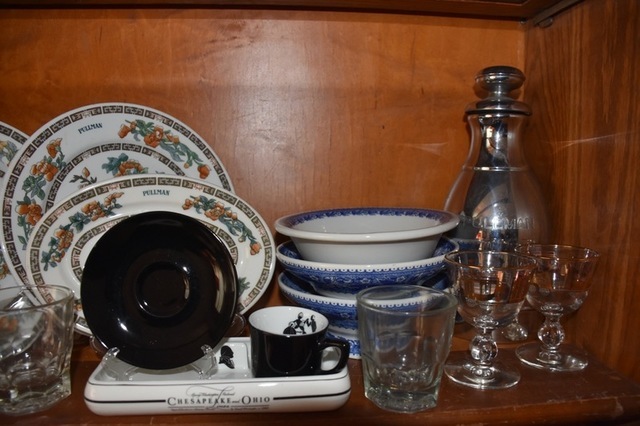 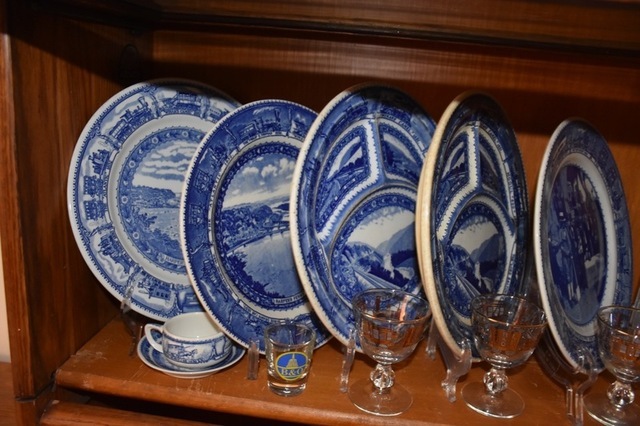 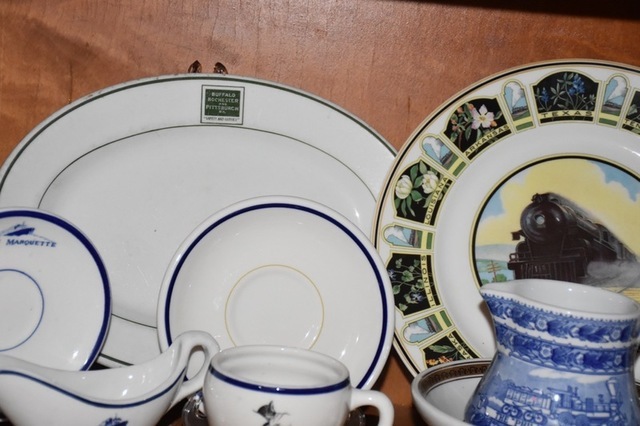 Then we gathered the china collection of B&O pieces, Pullman examples, blue and white, flow blue, and more. 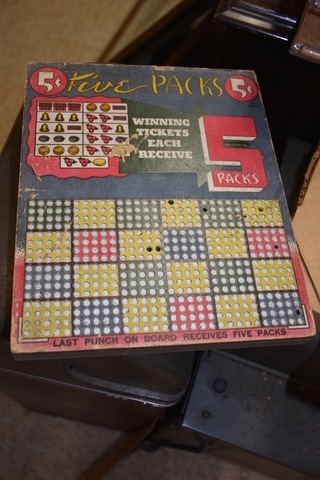 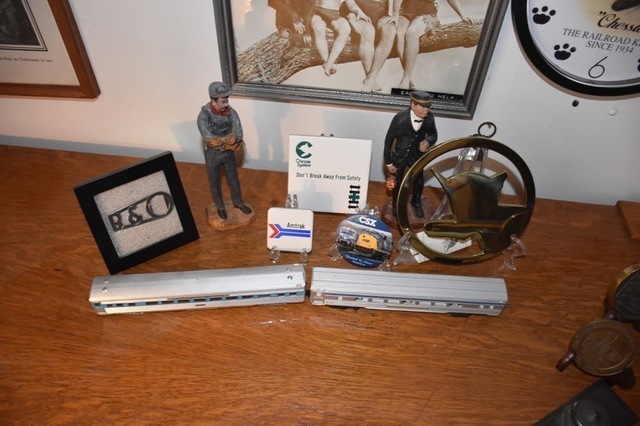 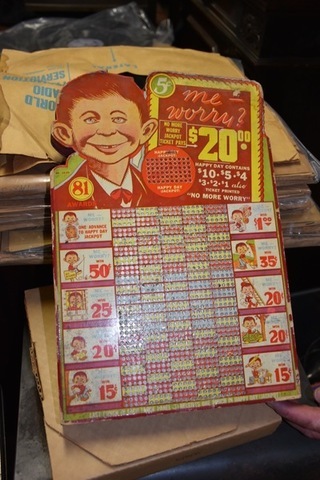 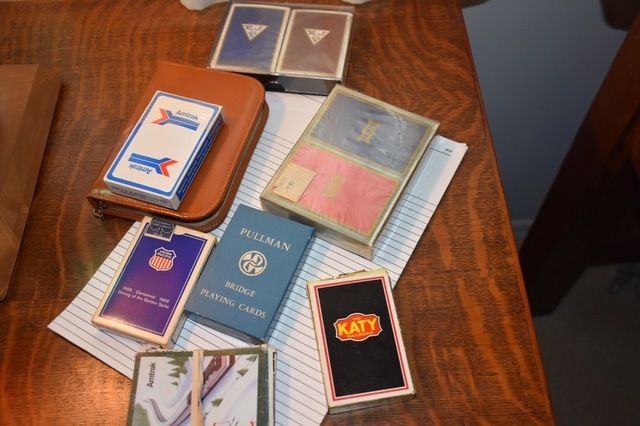 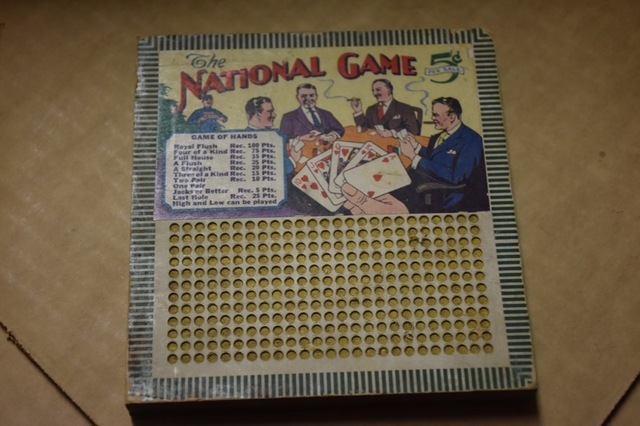 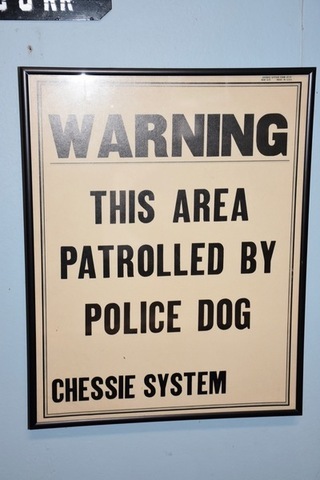 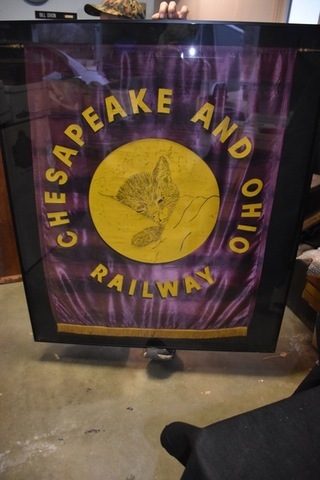 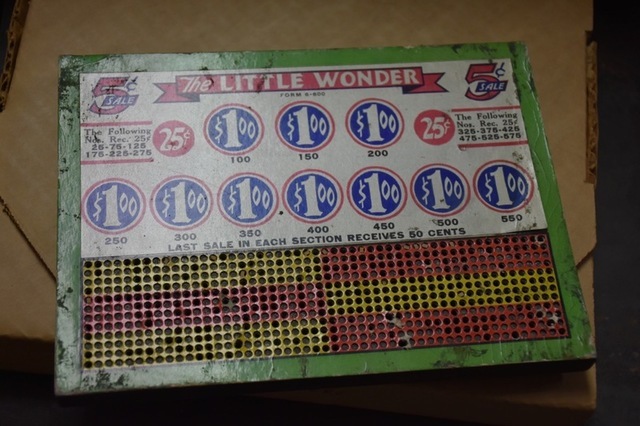 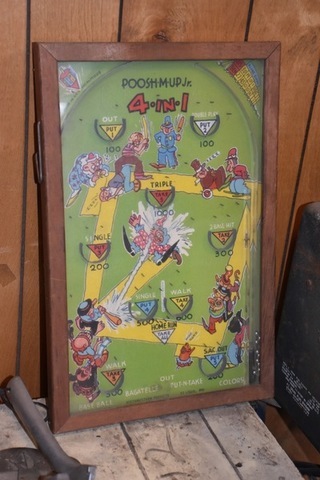 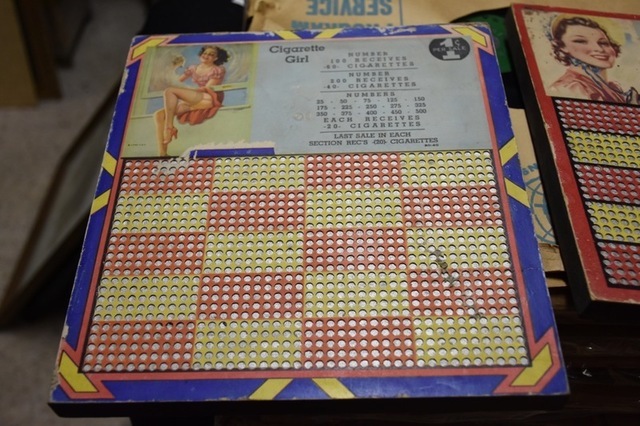 Chessie cat pieces, also playing cards, signage, posters, train steps, oak multi-drawer cabinets from the railroad and business offices, stack bookcases, barbers chair, barbers shop back mirror and stand, and more. 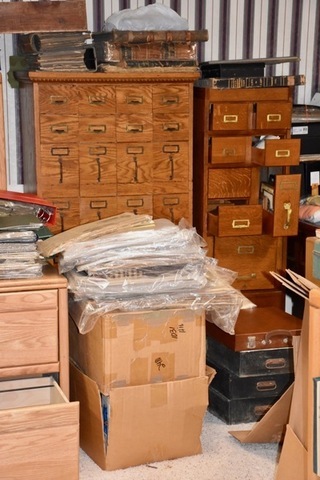 You will not believe the quantity of items from this collection. 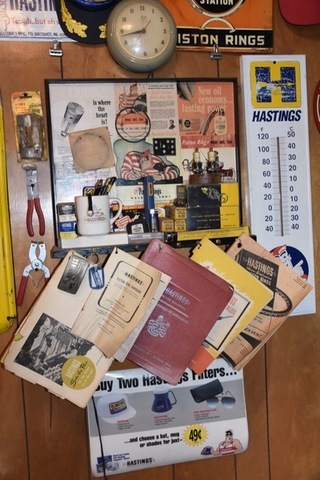 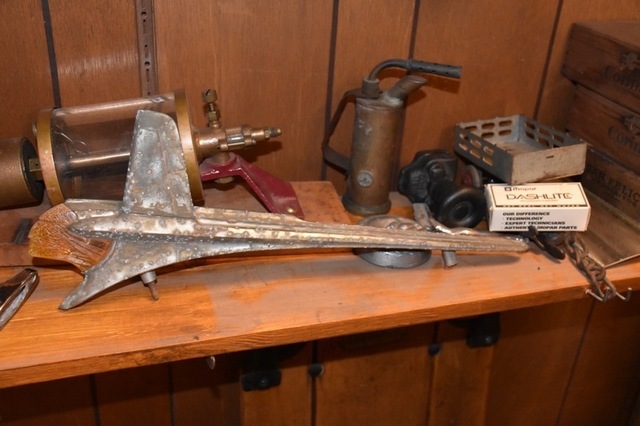 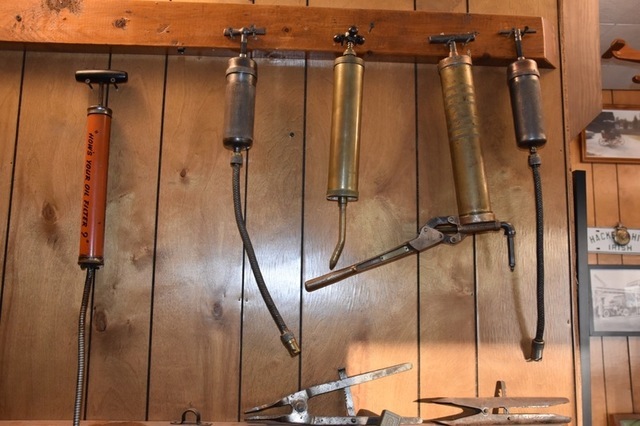 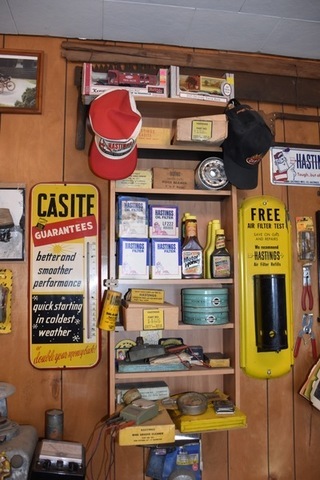 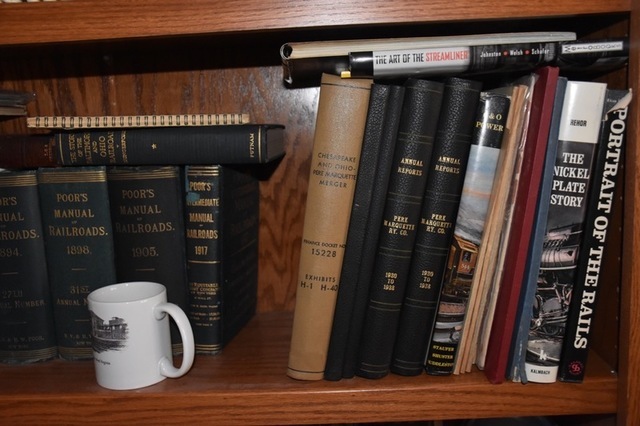 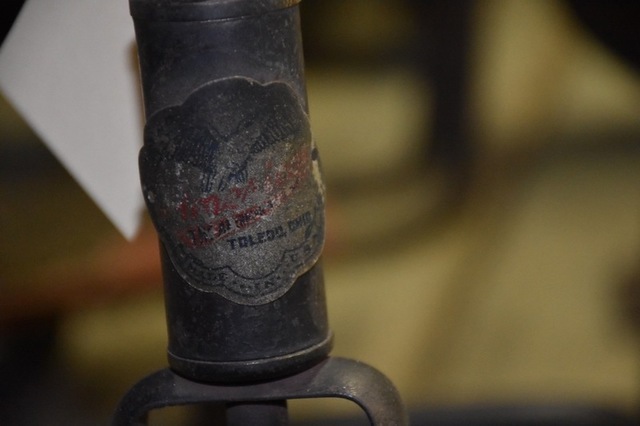 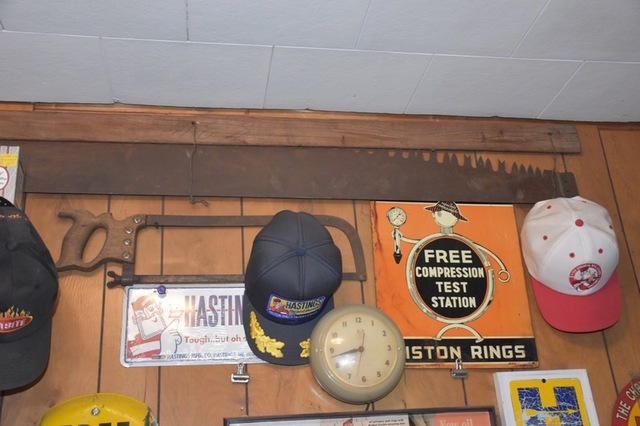 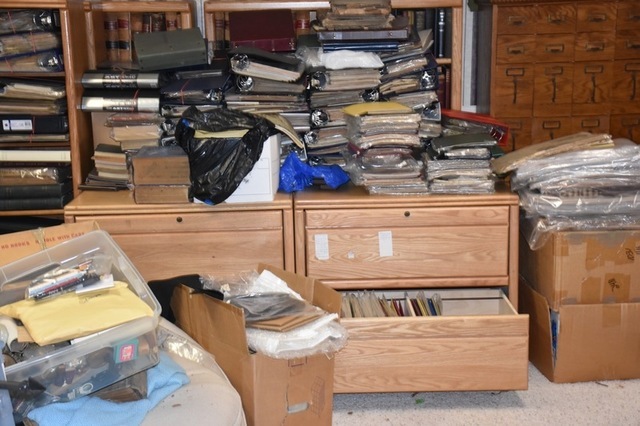 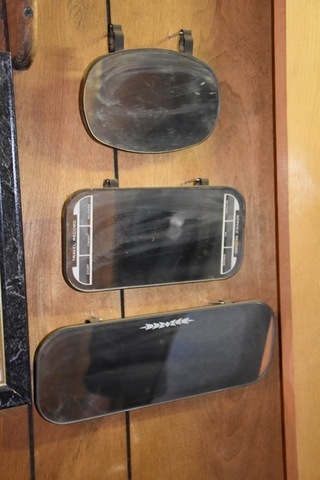 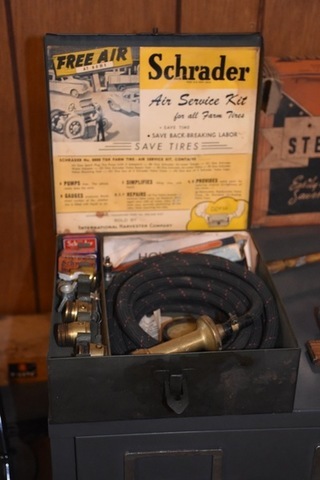 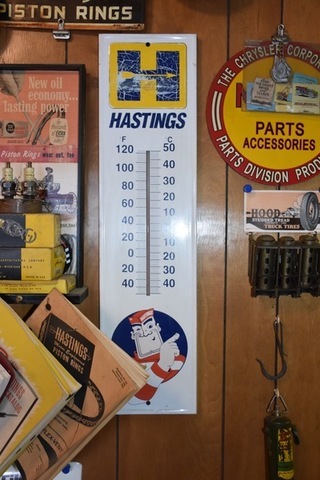 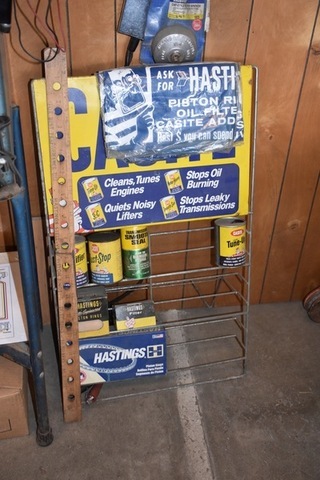 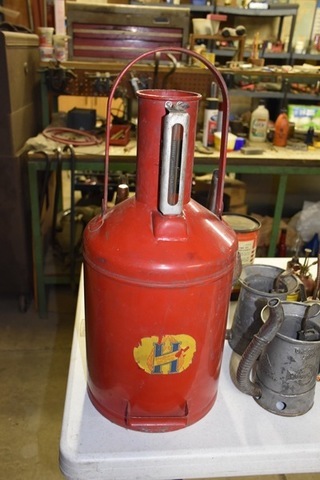 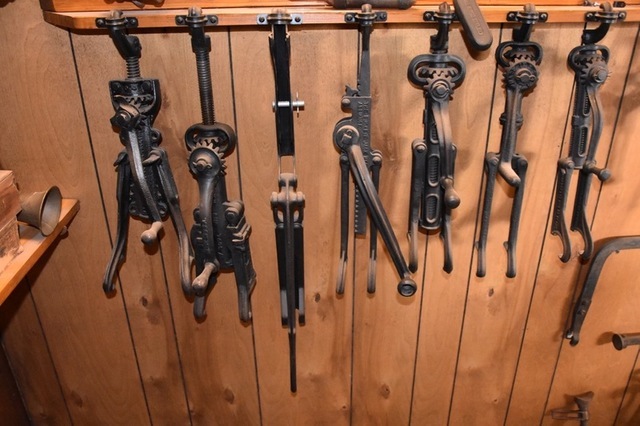 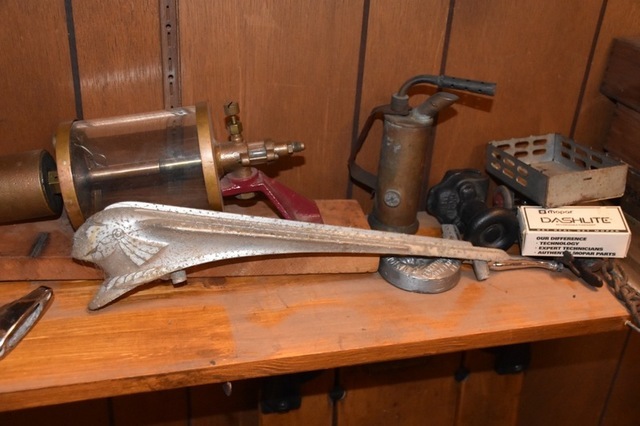 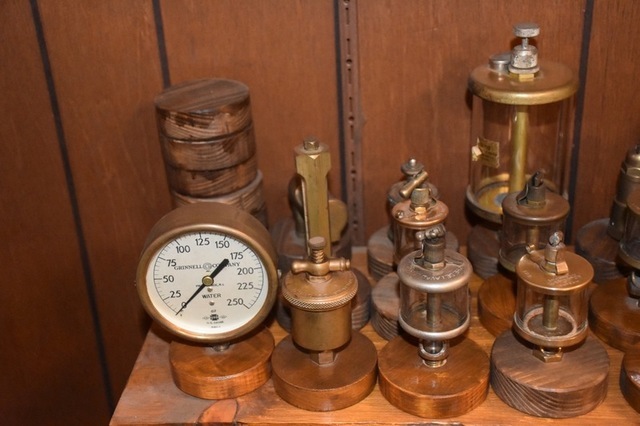 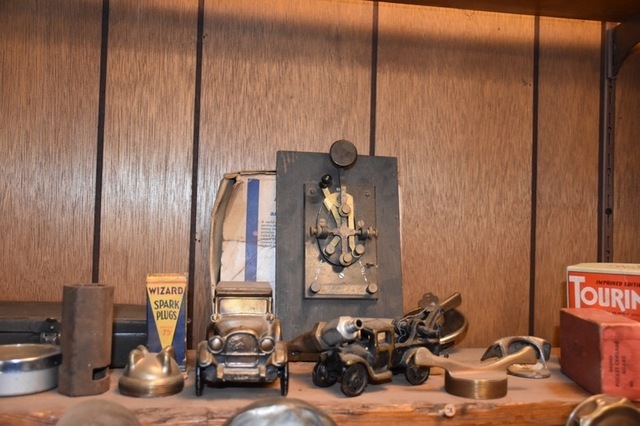 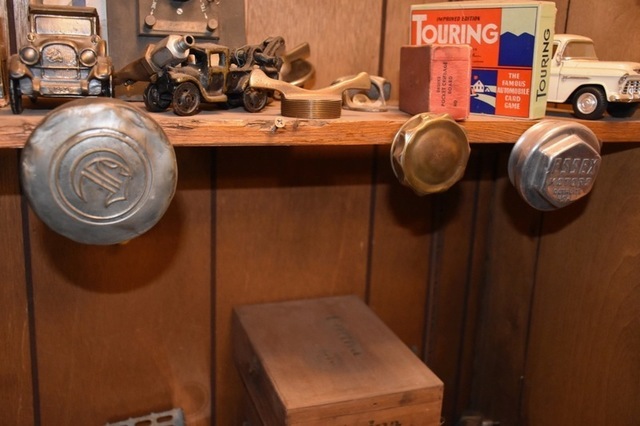 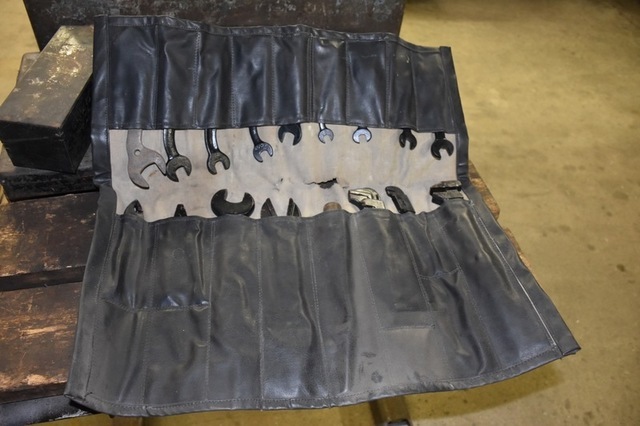 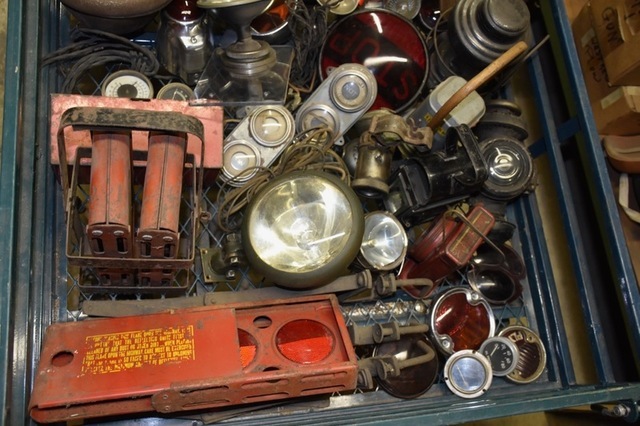 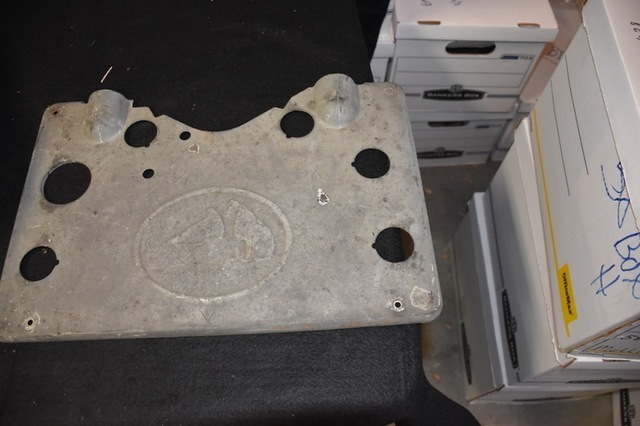 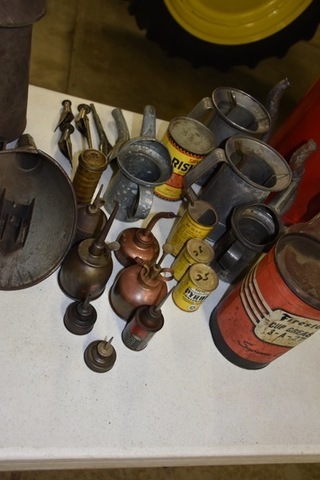 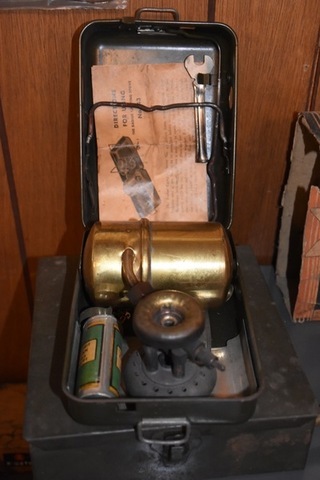 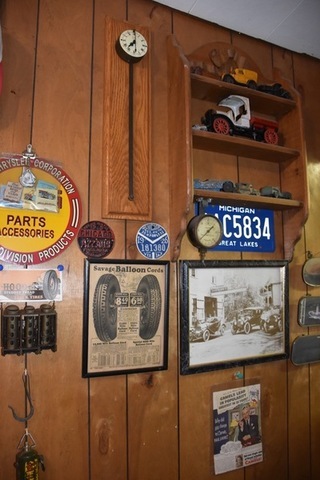 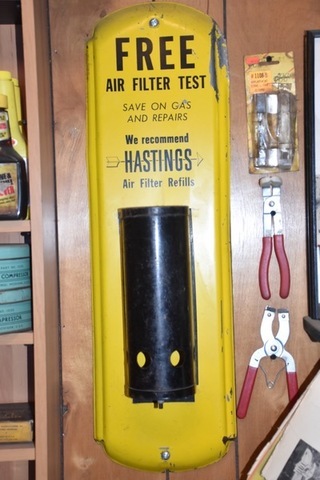 Next is Al Hackett’s collection that includes a great representation of antique automotive, garaage and car items, along with Hastings, Michigan company historical collectibles. 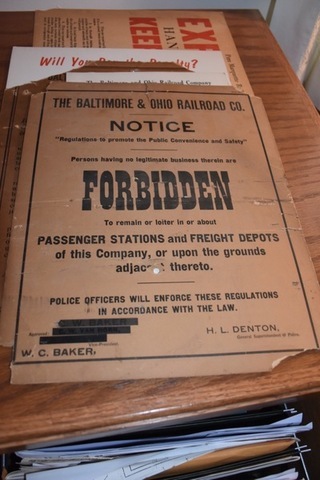 Also signs, old tools, interesting childrens tricycles, scooters, bicycles, velocipede, wagon, etc, cast iron canons, old gas motors, oilers, and more. 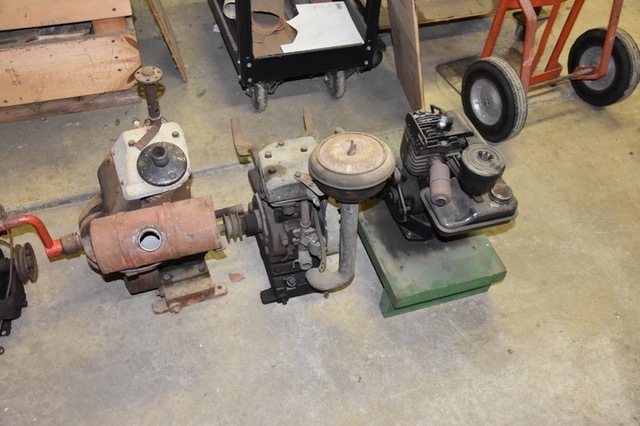 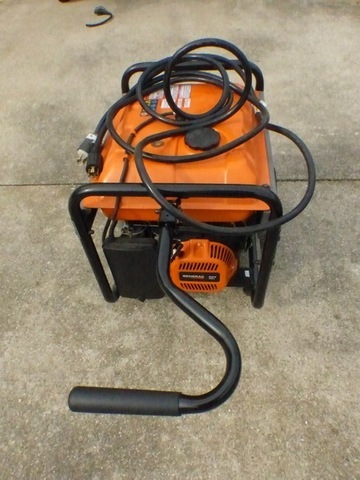 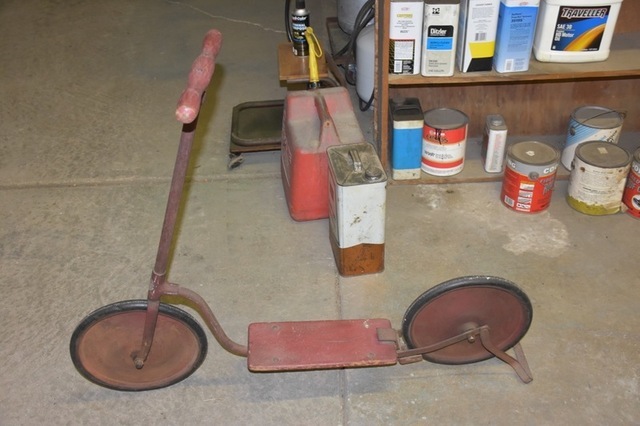 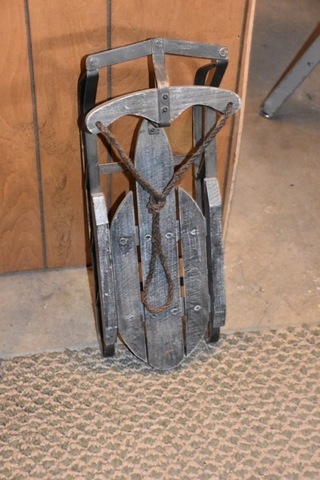 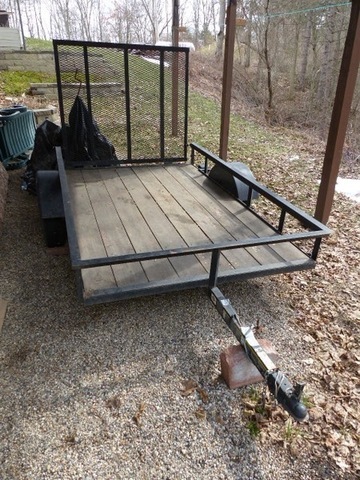 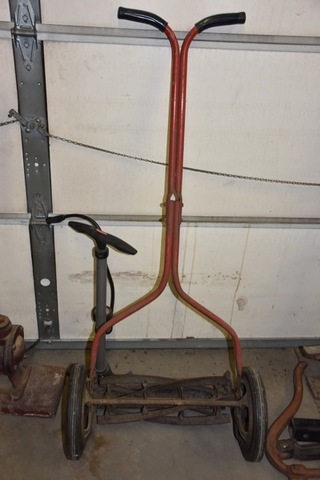 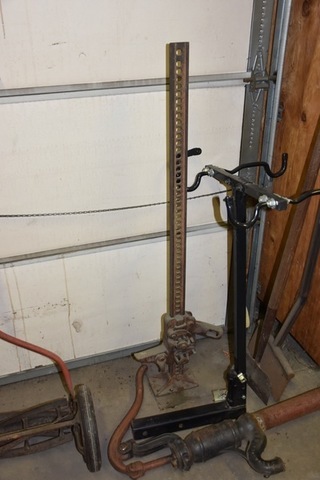 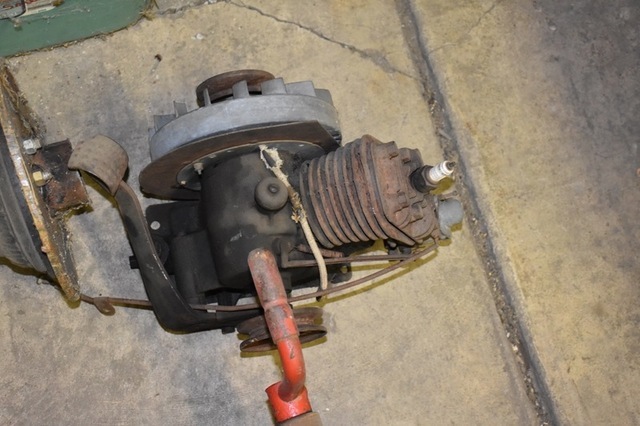 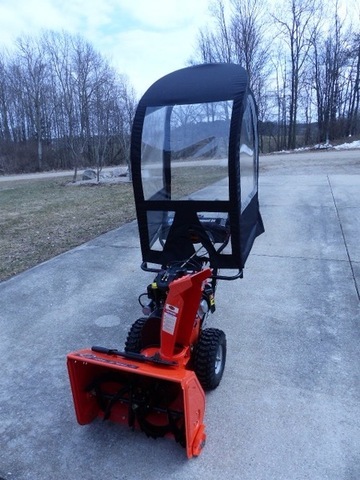 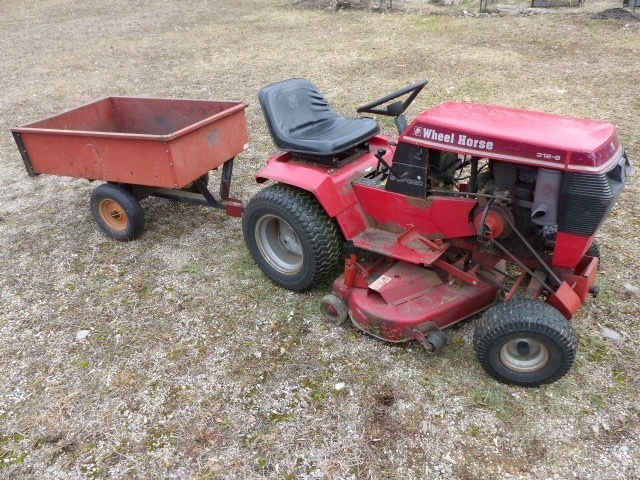 Also, we have a group of modern items including a Ariens snowblower, Generac generator, 5×8 trailer with drop-ramp, Wheel Horse riding mower, Fiestaware, dolls, some home furnishings, and more. 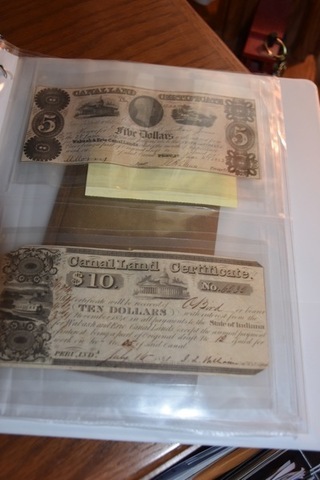 Finally, to be sold at 2:00 P.M. in the Afternoon – We will be selling two collections of Coins including a good representation of U.S. type and silver coinage. 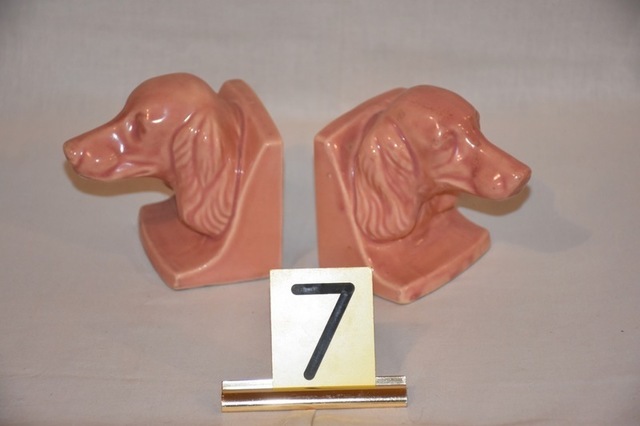 Keep watching for the catalog to be posted. 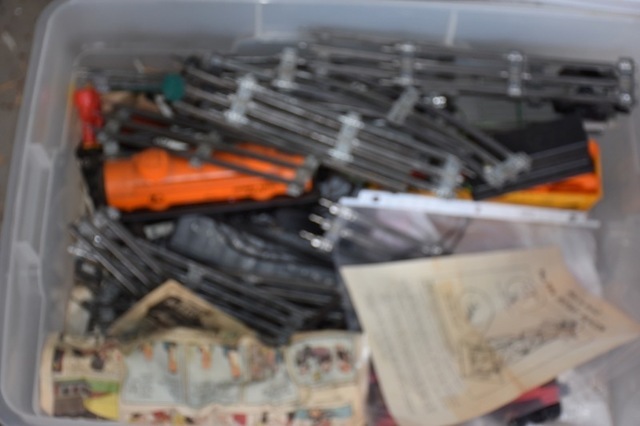 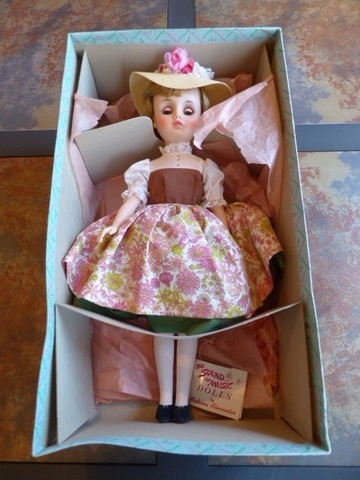 From another collection we have smalls including a hair comb collection, vintage Valentines, 29 hat pins, perfume bottles, fans, old purses, and more. 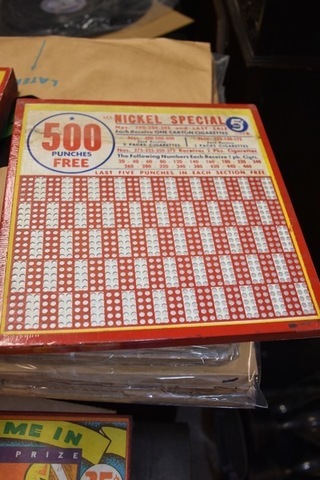 Plan on spending the day. 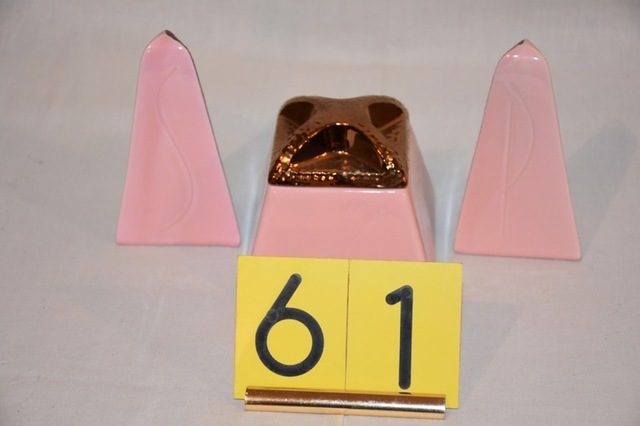 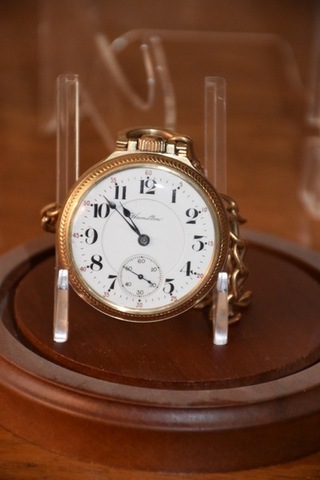 We will most likely sell in two rings and be walking to a lot of the items during the course of the auction. 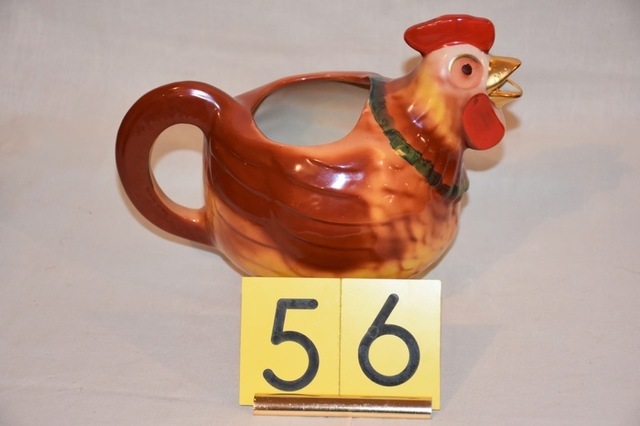 455 pictures posted under our photo galleries. 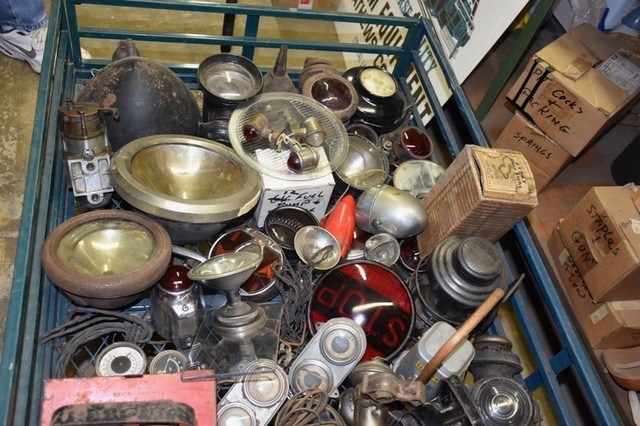 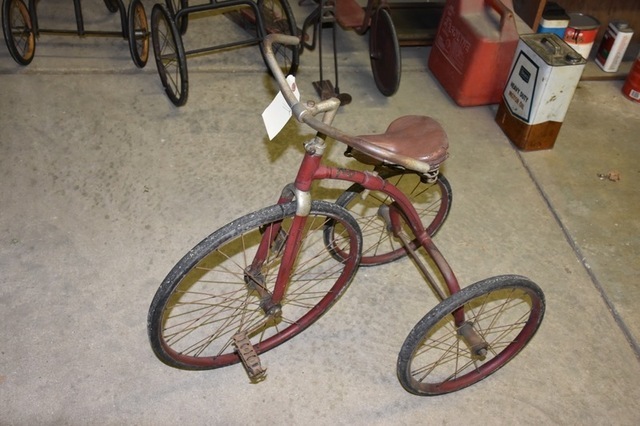 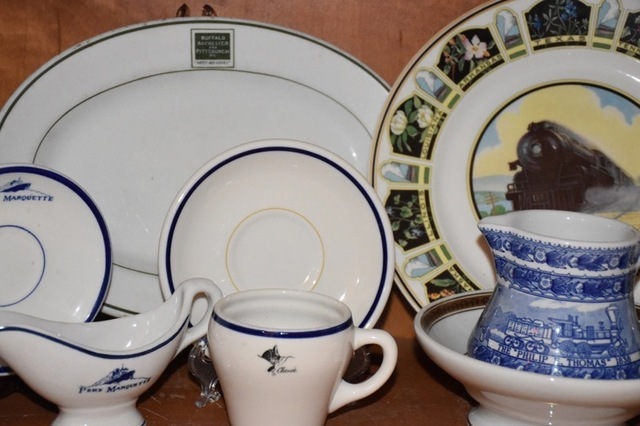 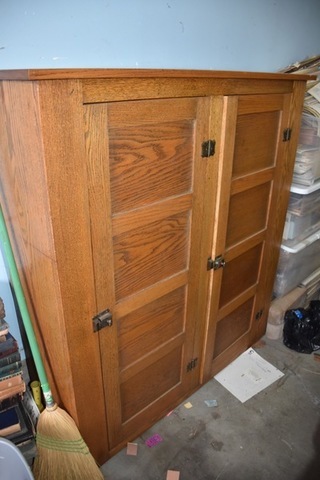 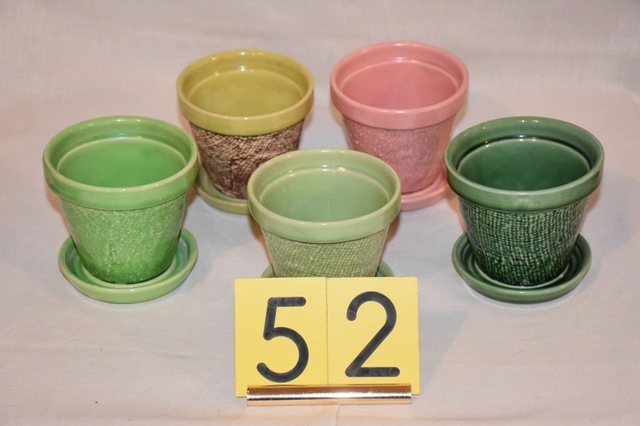 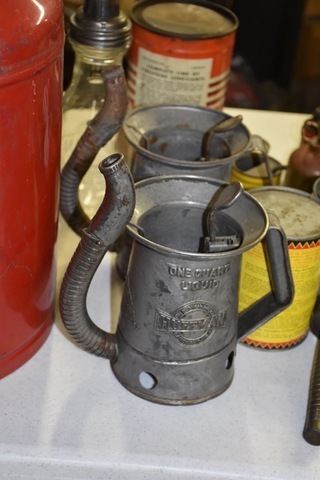 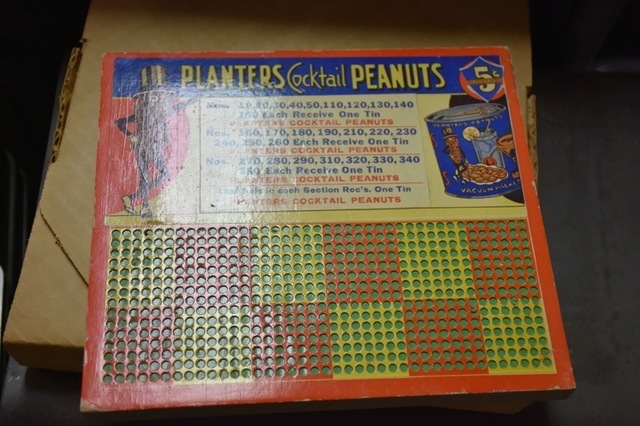 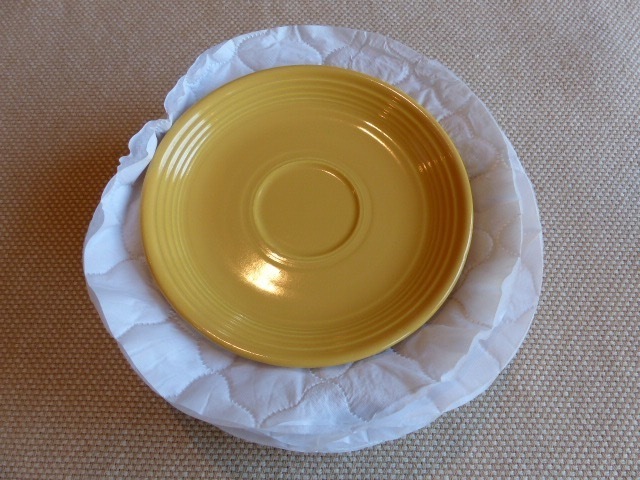 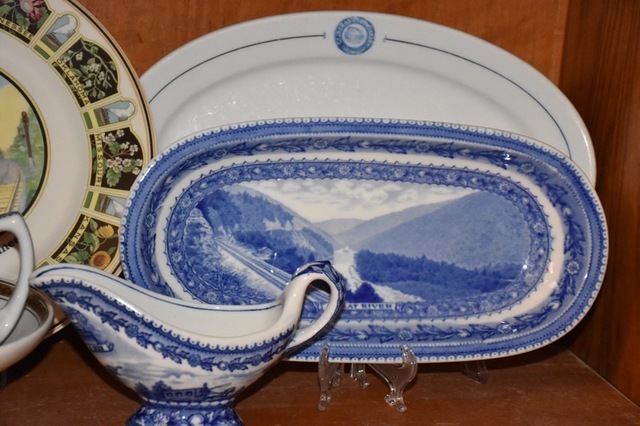 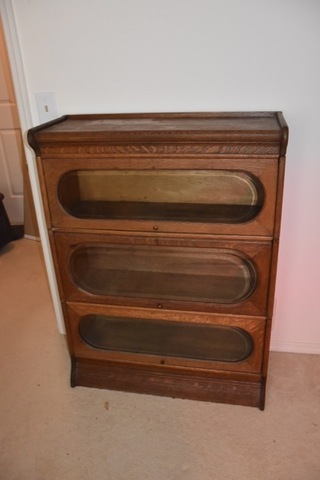 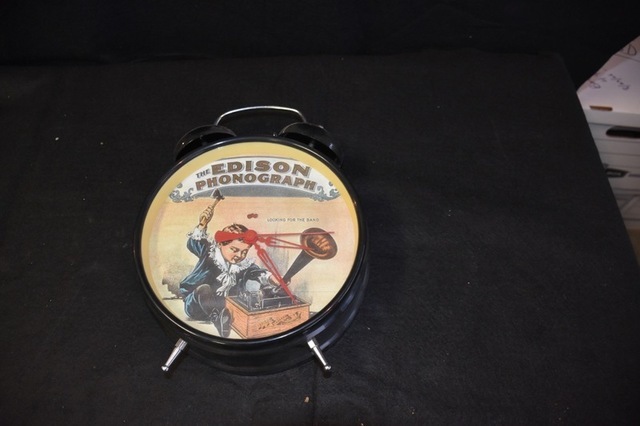 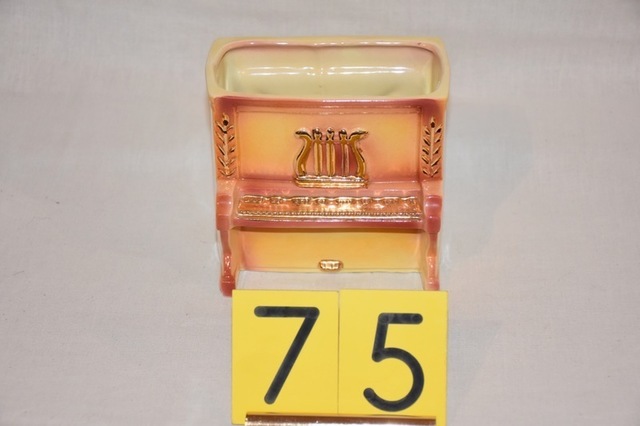 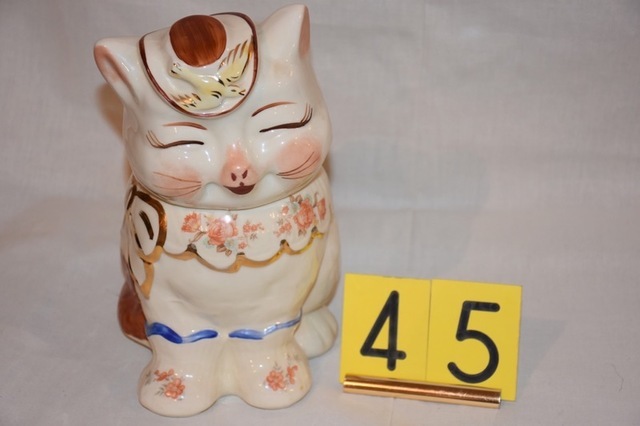 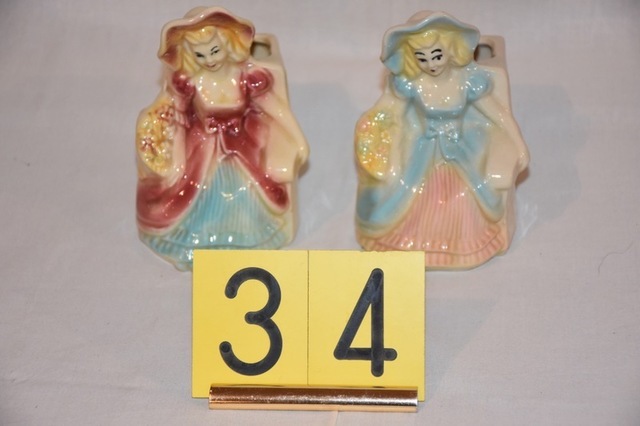 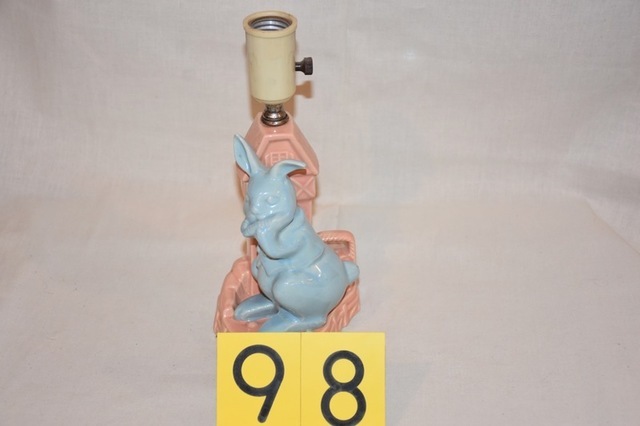 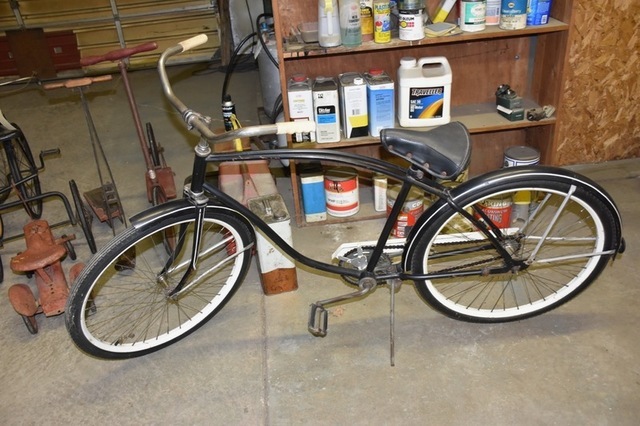 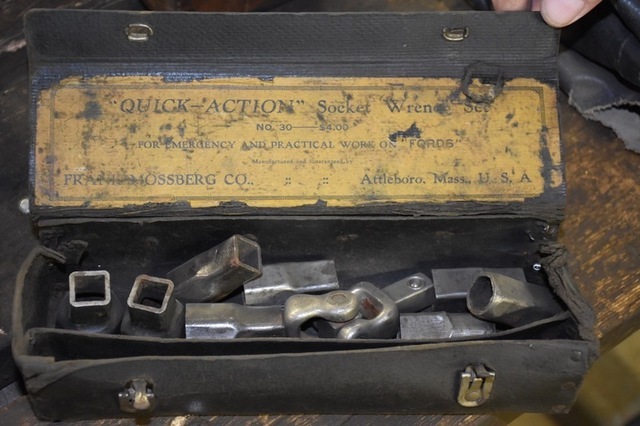 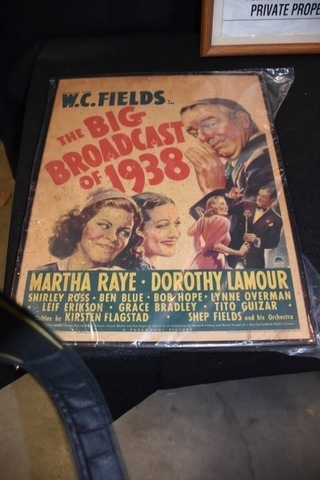 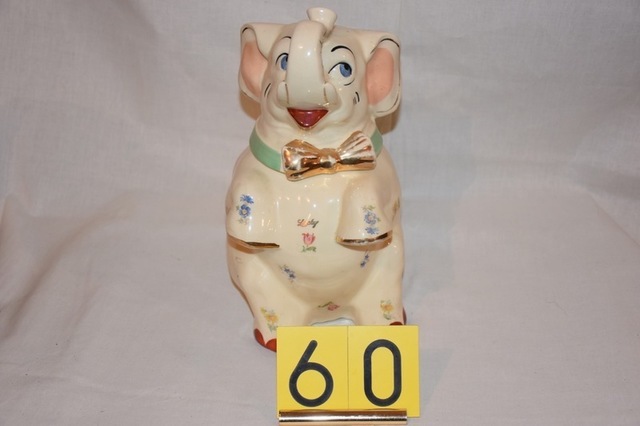 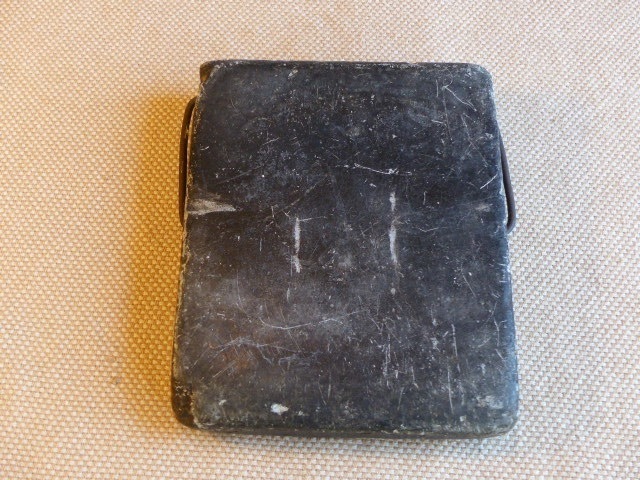 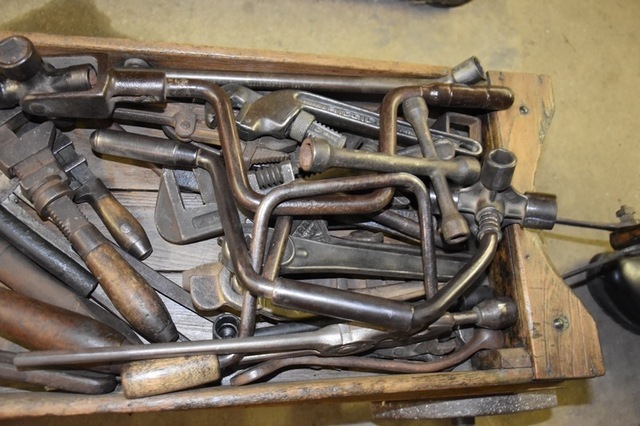 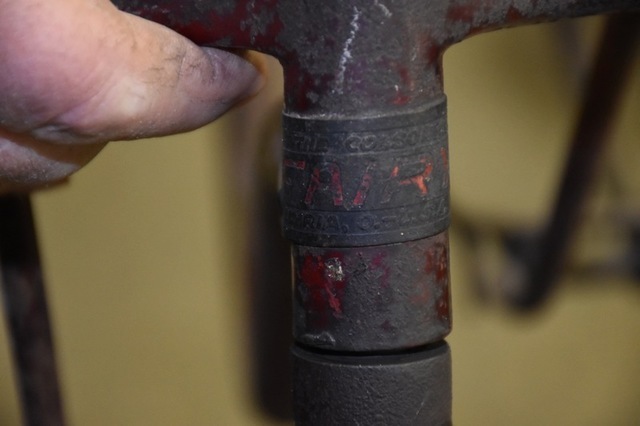 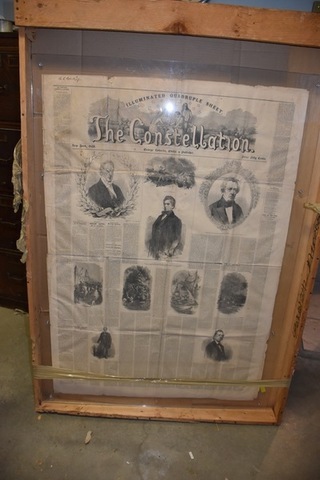 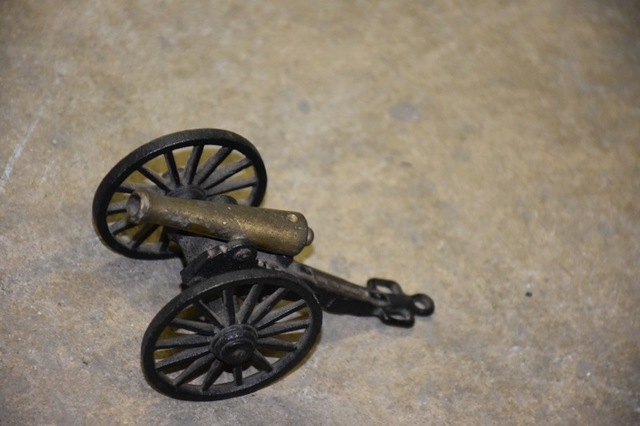 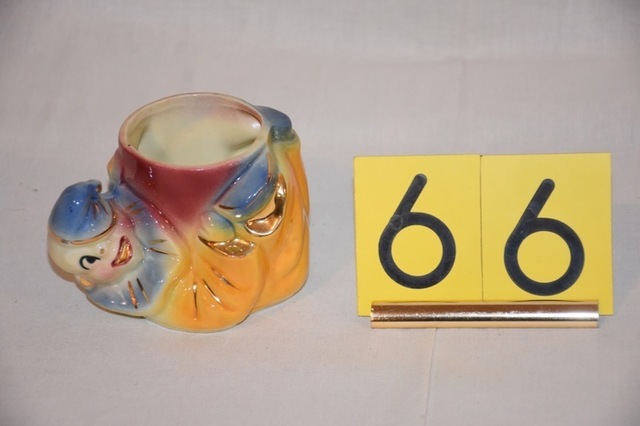 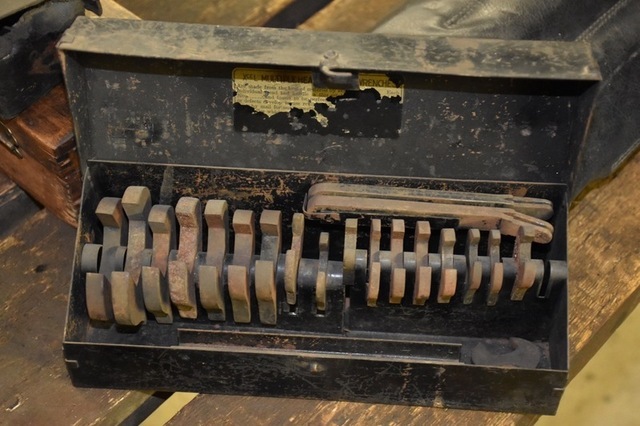 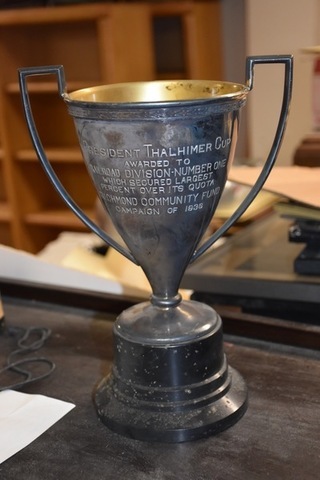 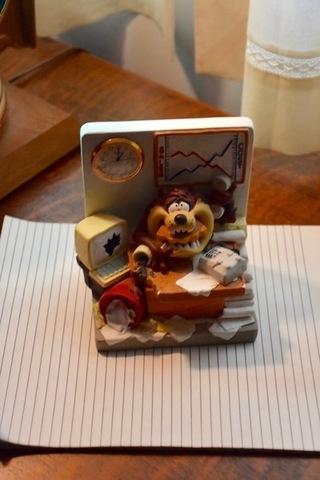 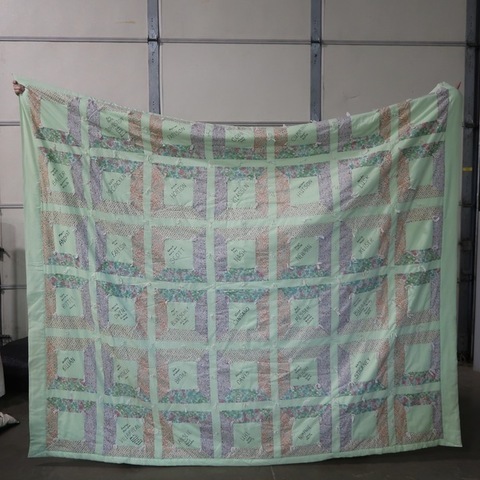 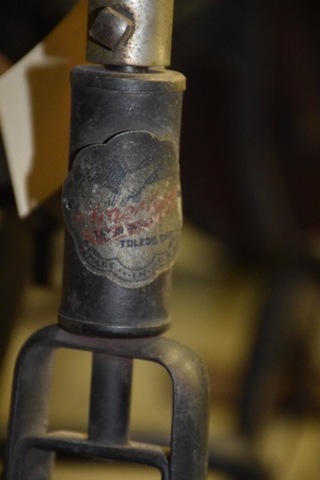 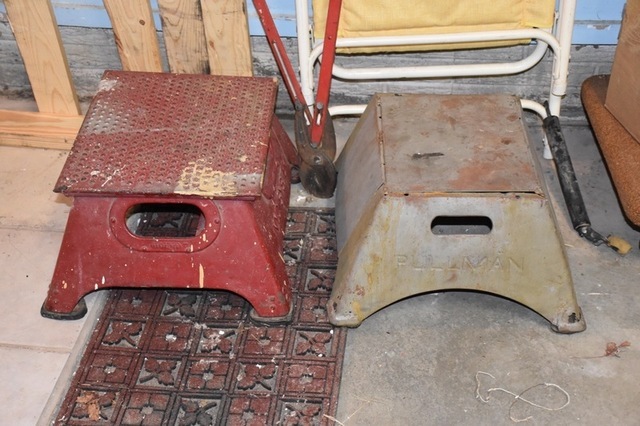 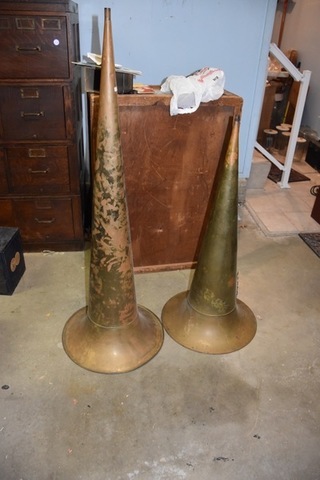 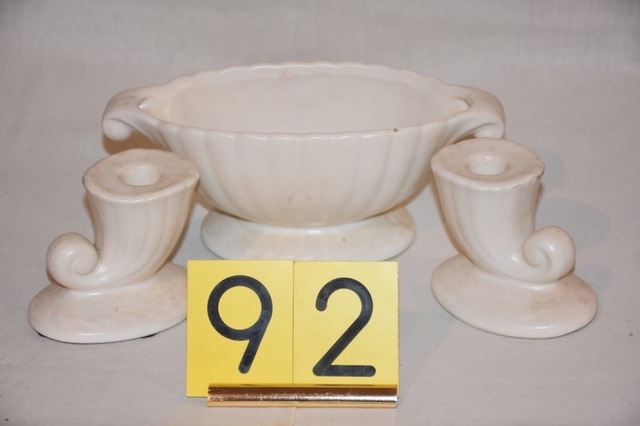 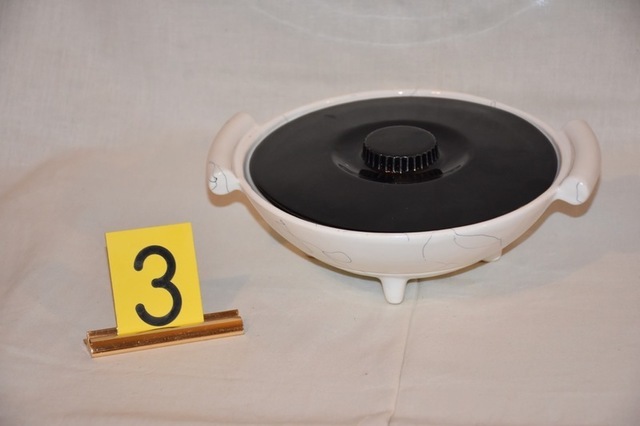 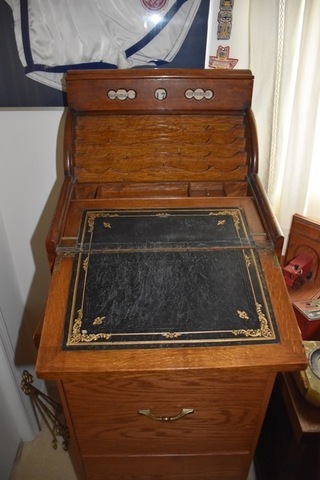 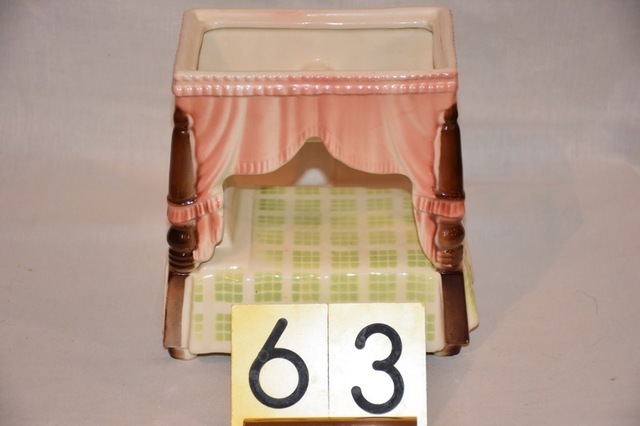 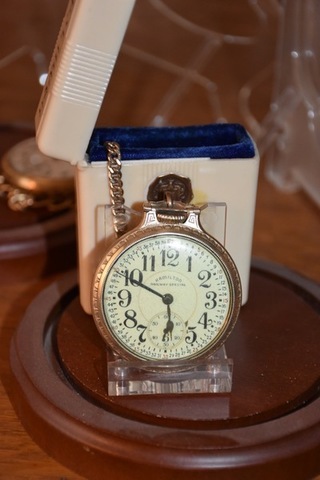 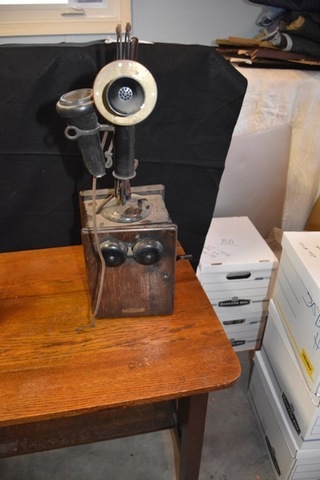 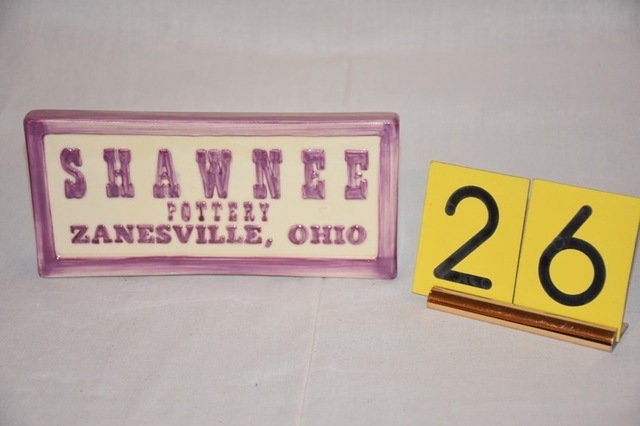 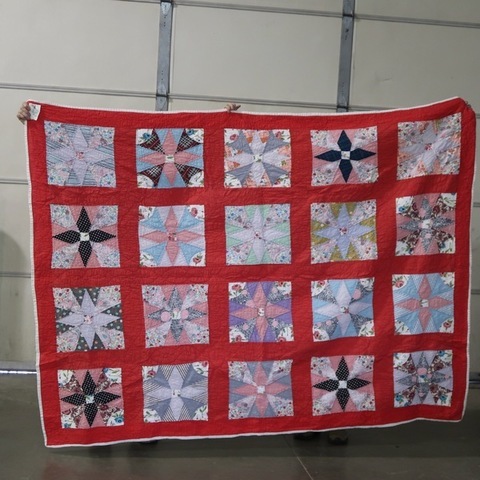 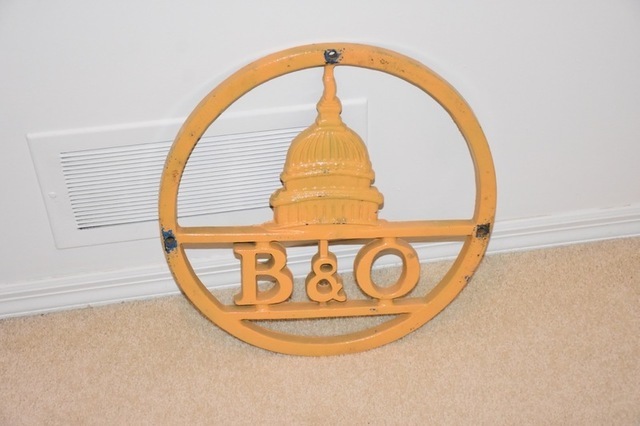 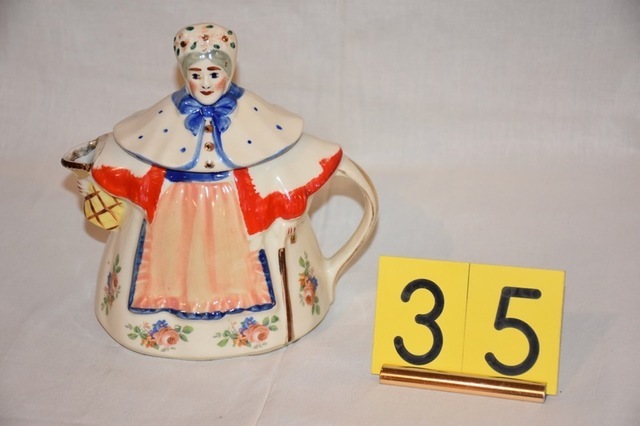 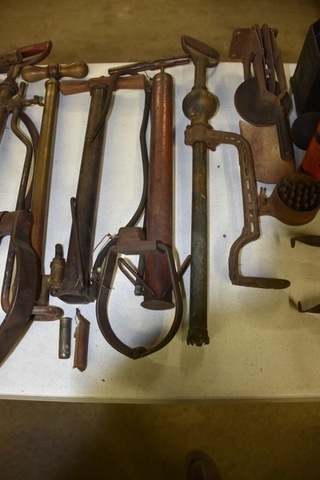 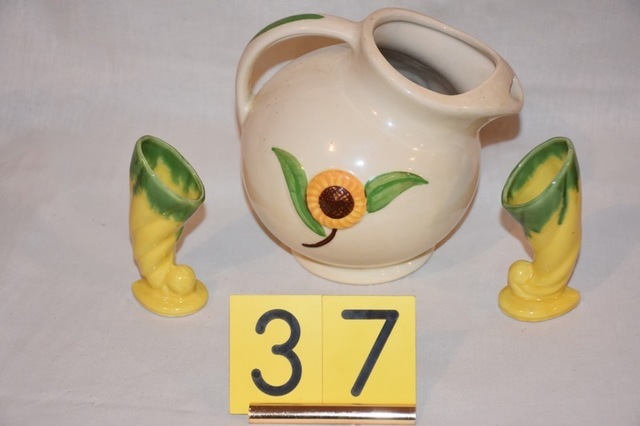 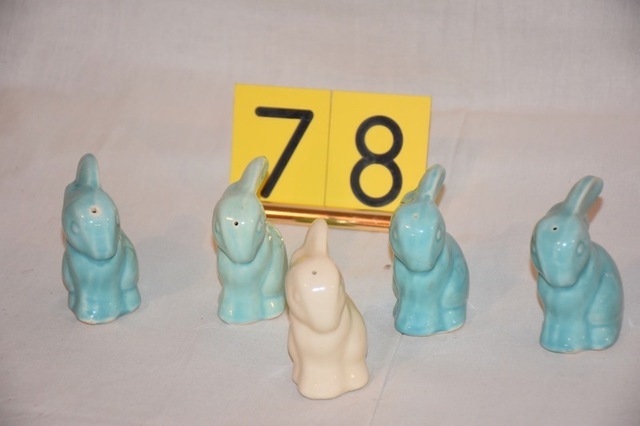 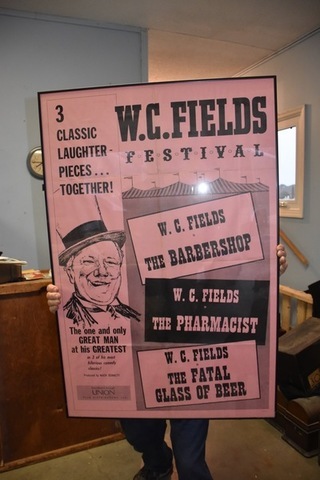 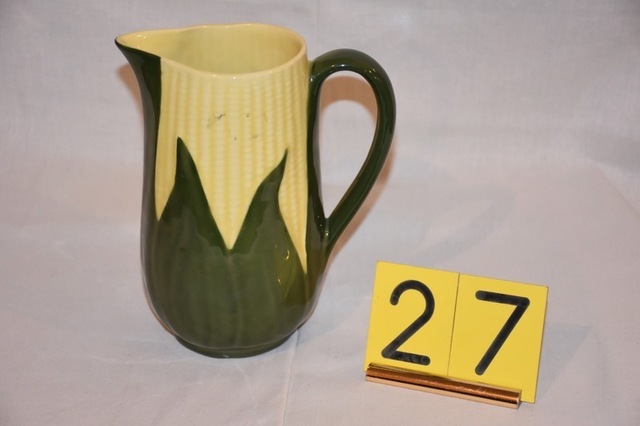 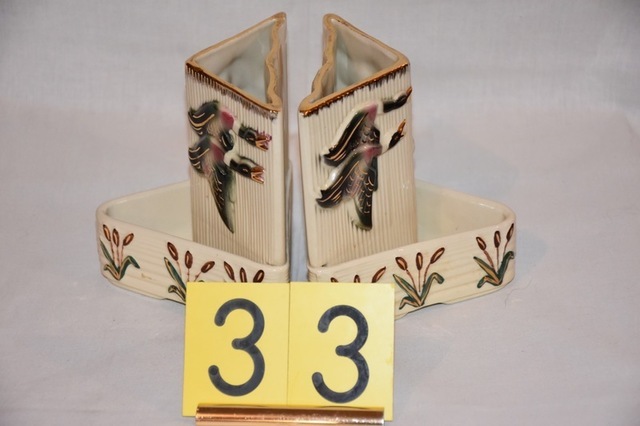 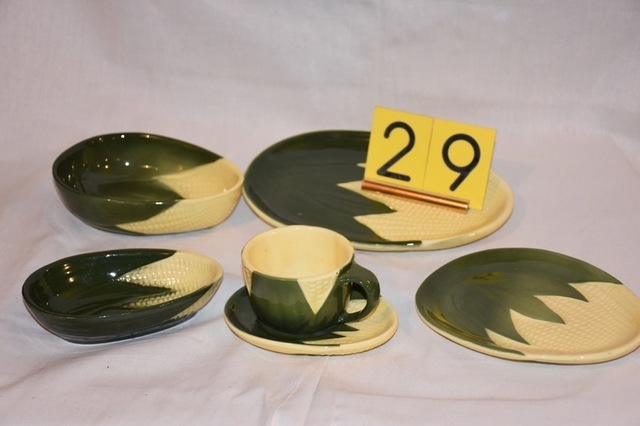 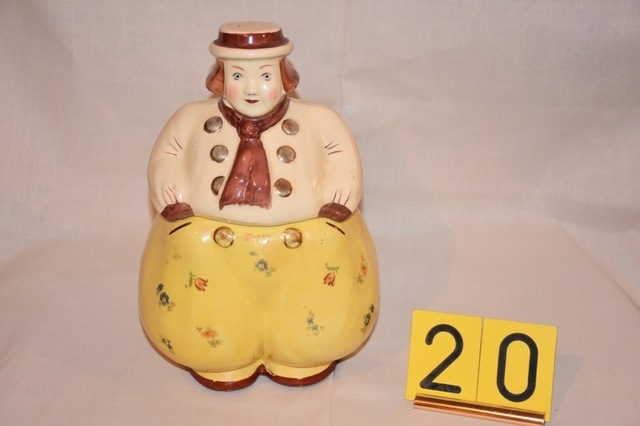 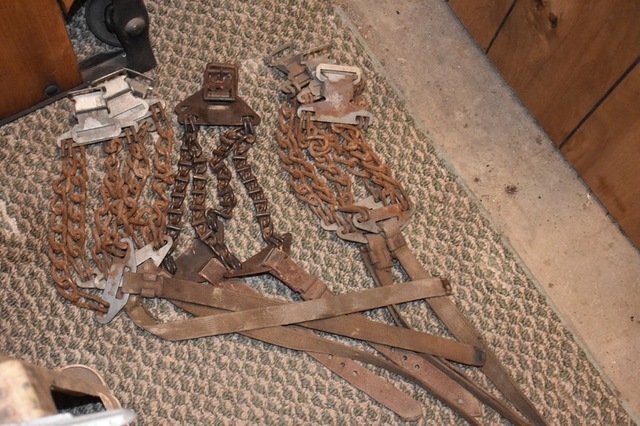 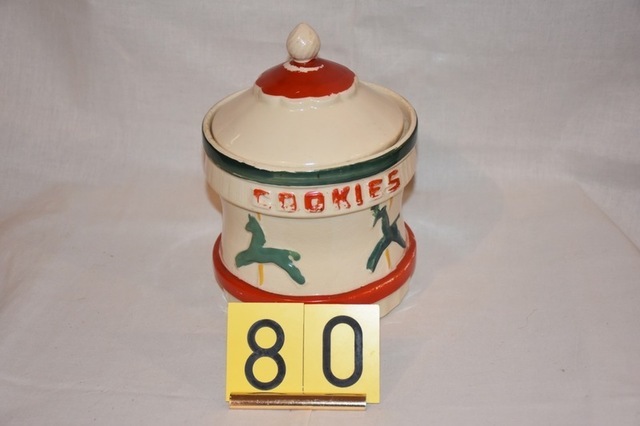 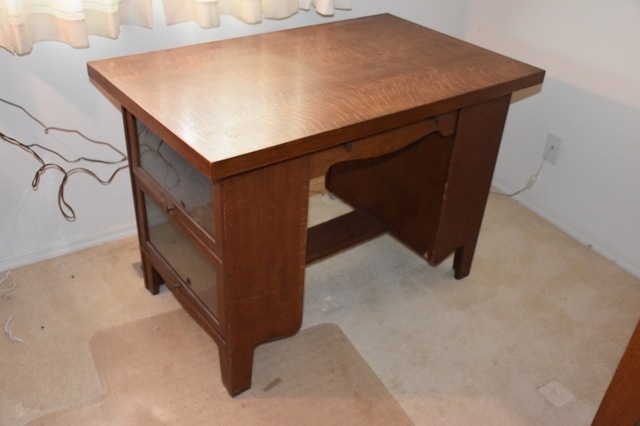 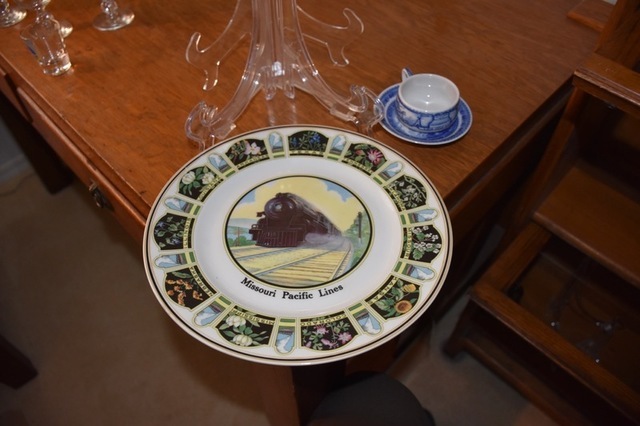 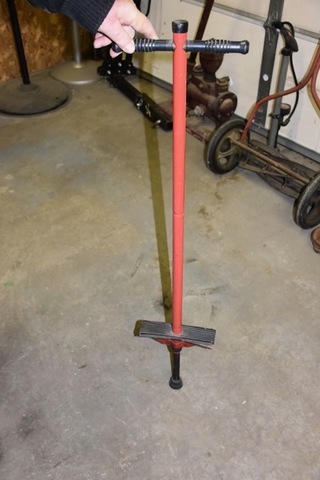 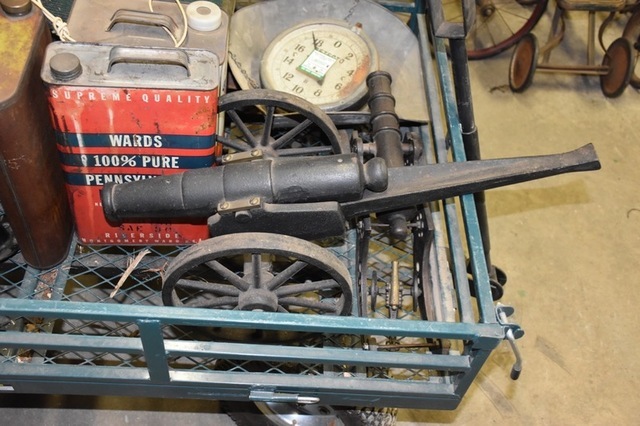 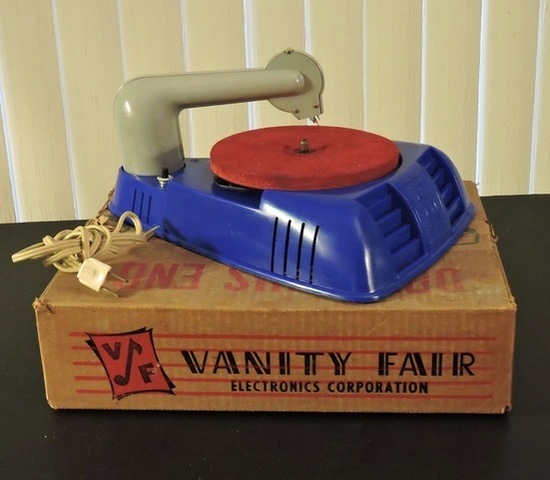 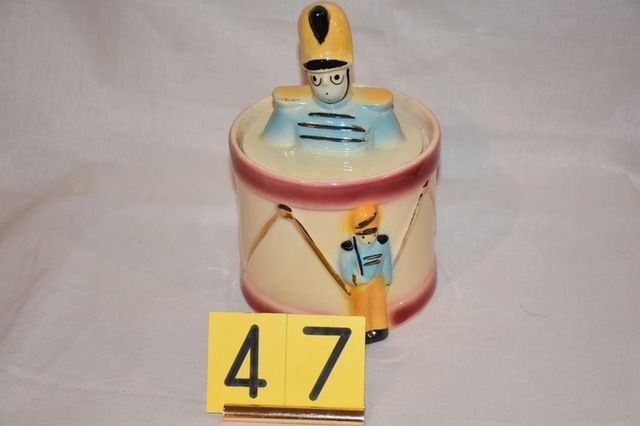 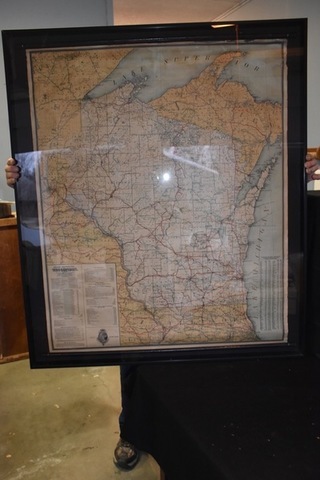 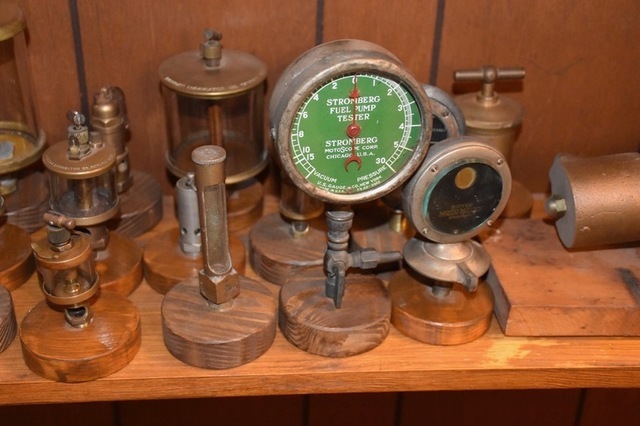 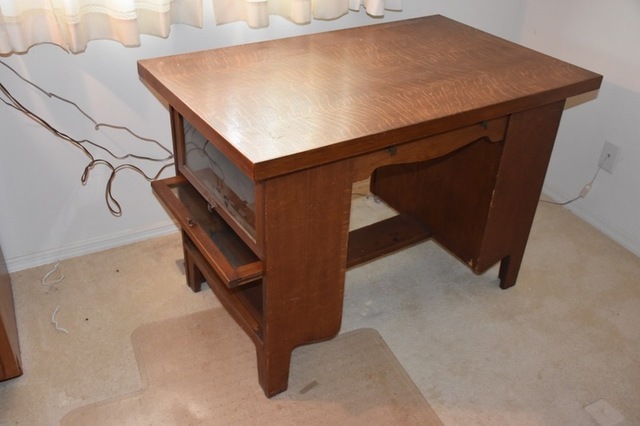 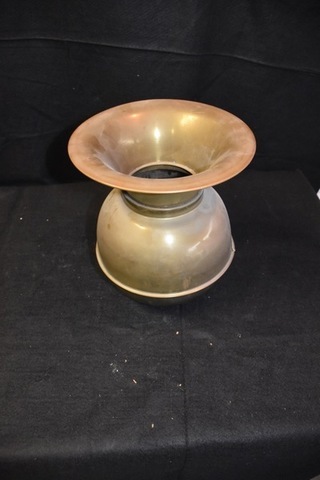 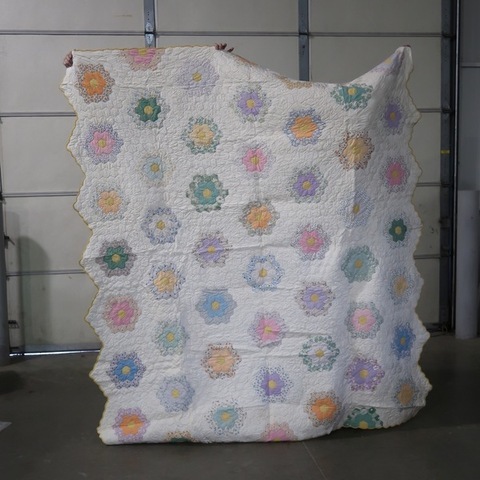 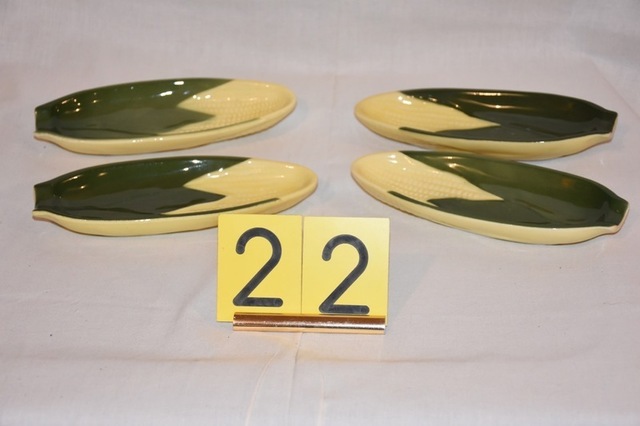 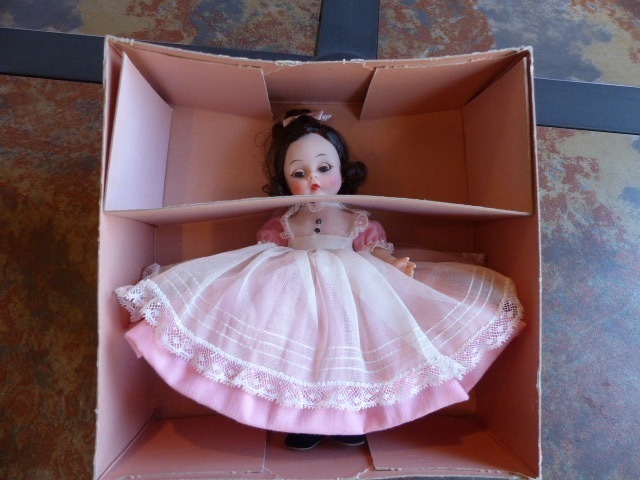 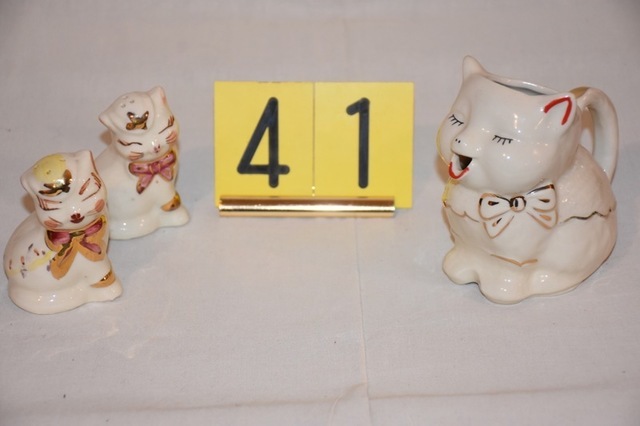 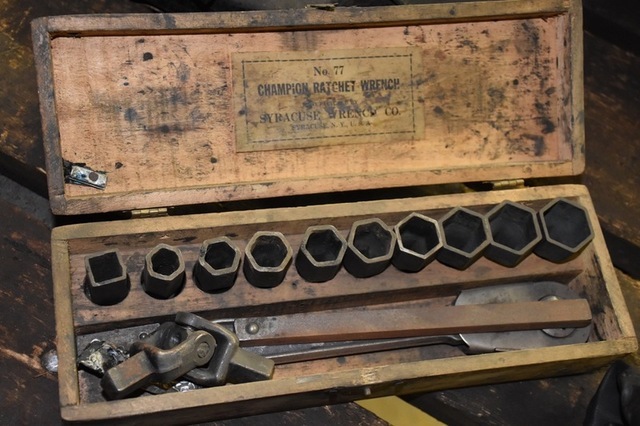 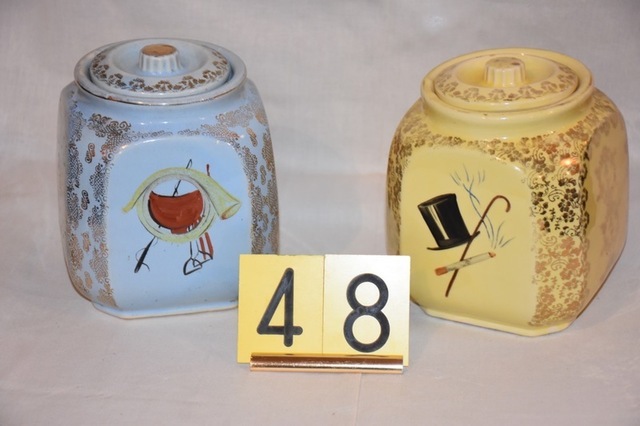 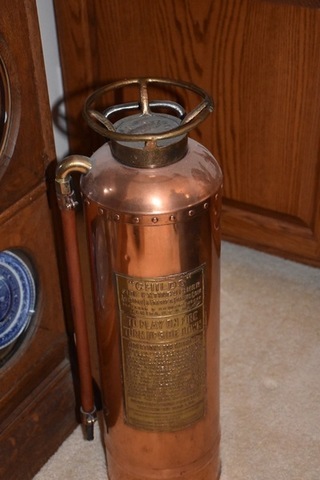 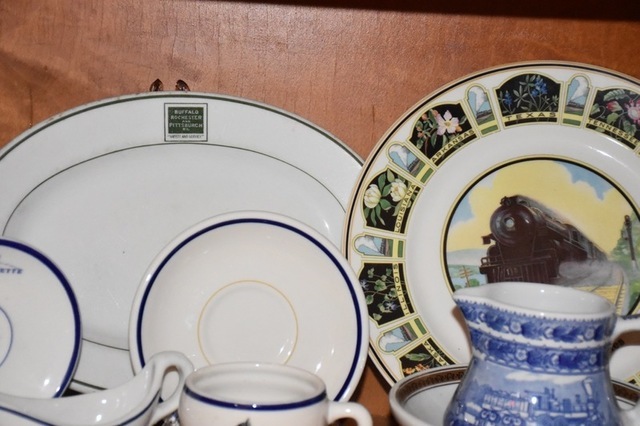 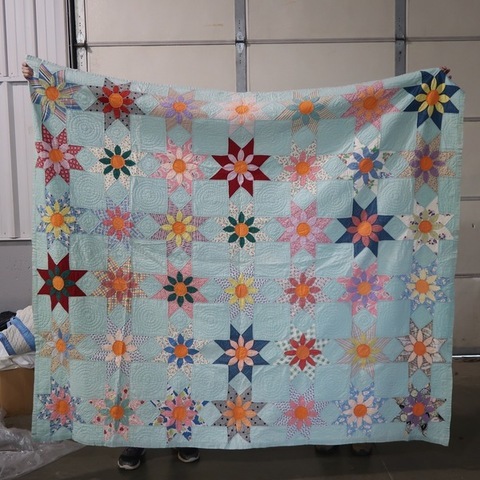 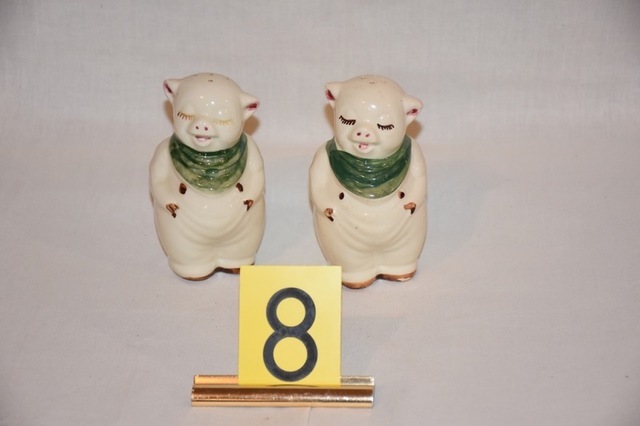 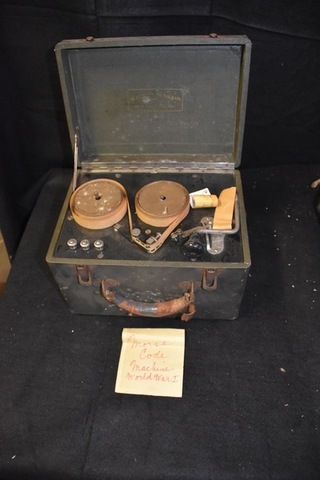 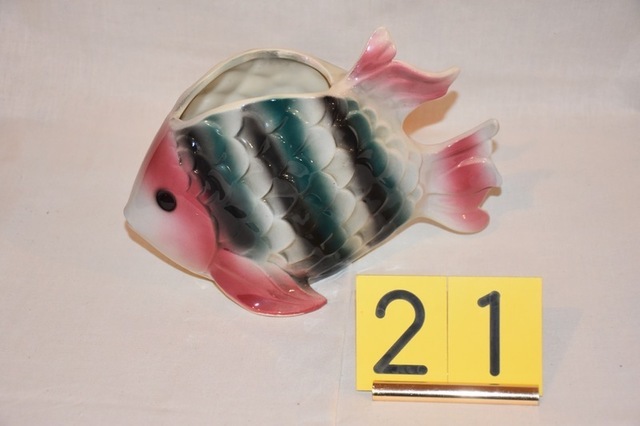 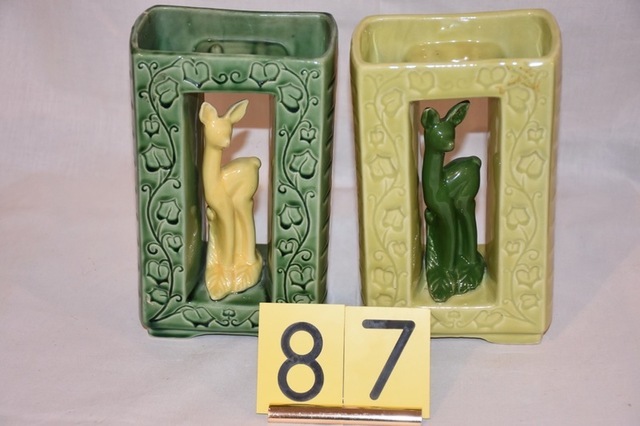 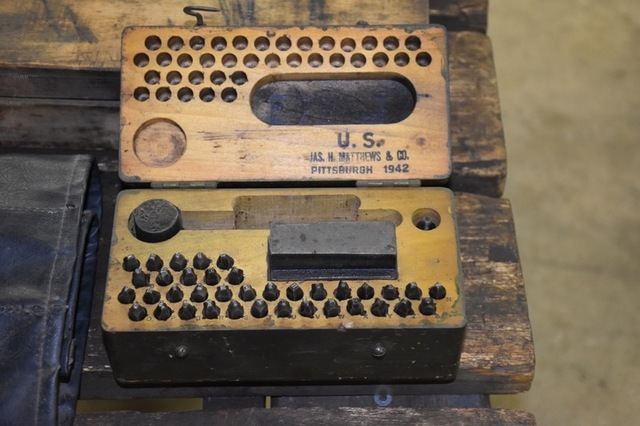 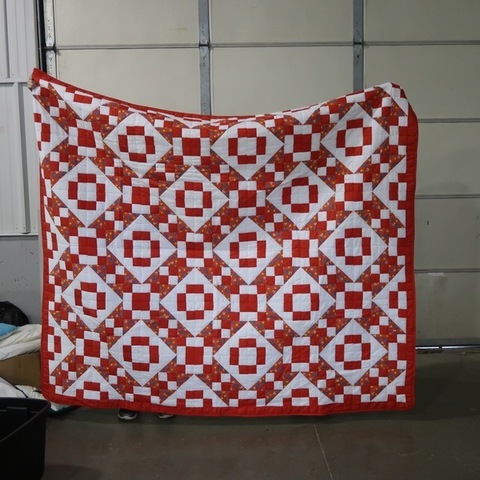 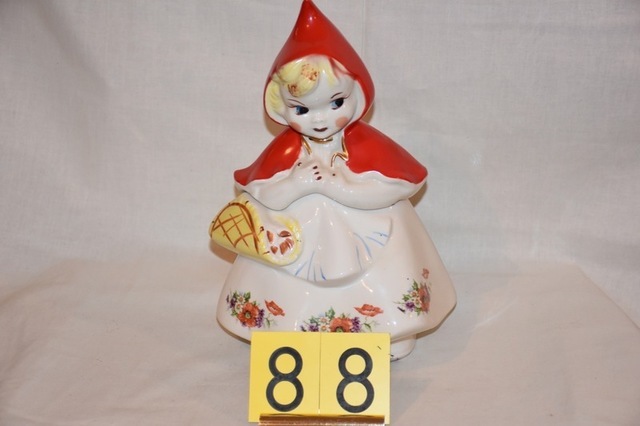 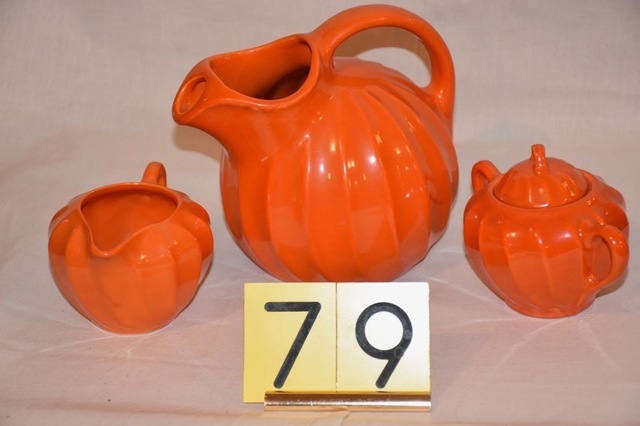 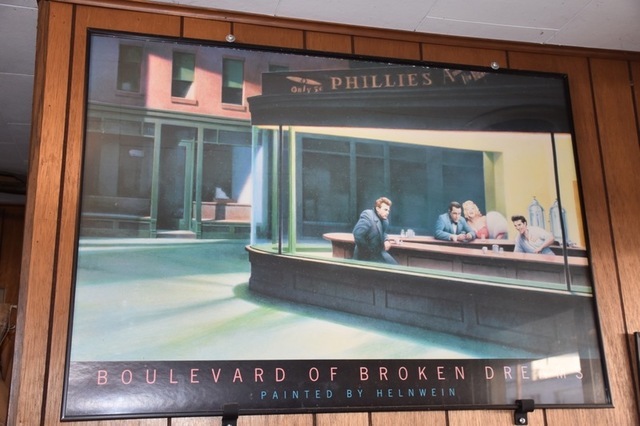 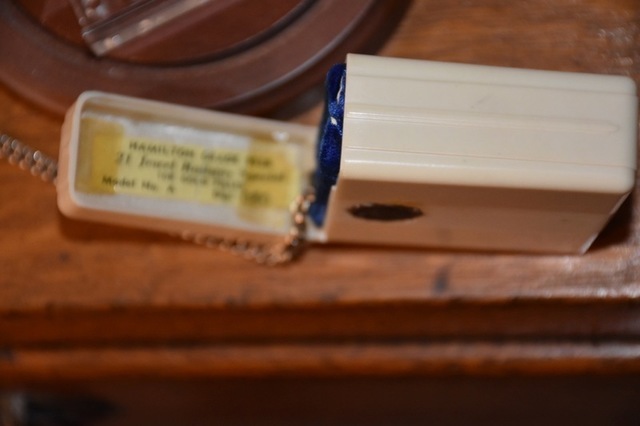 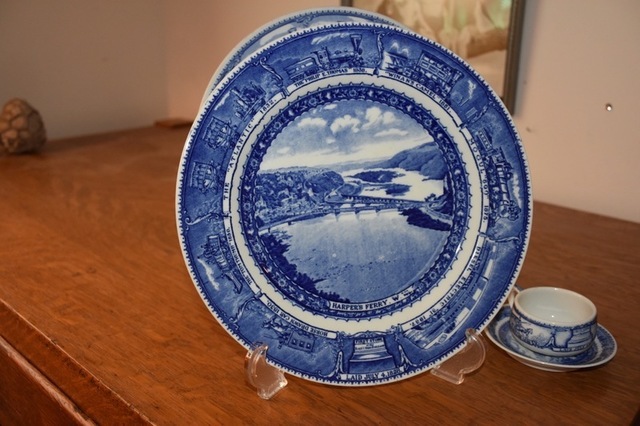 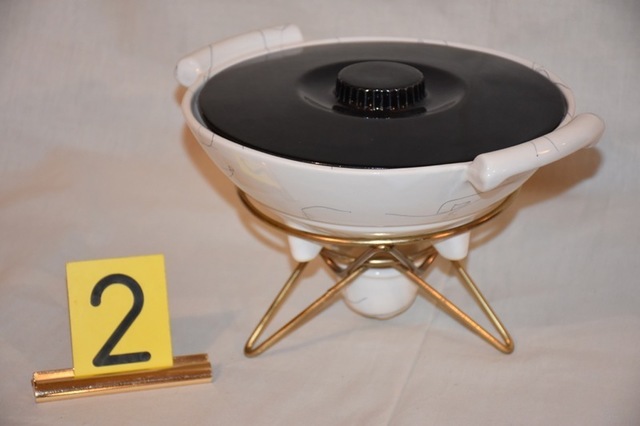 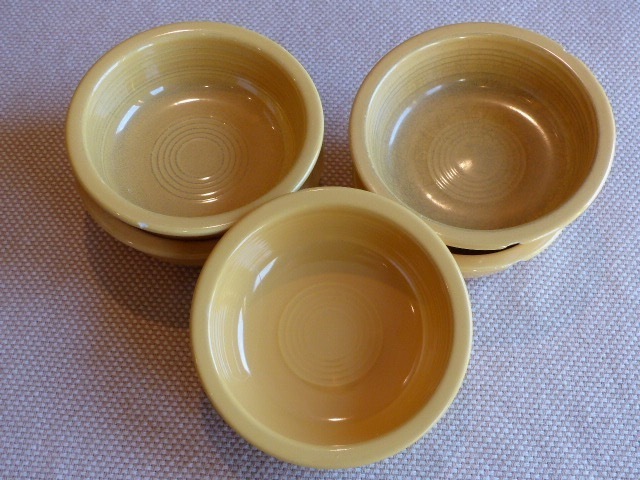 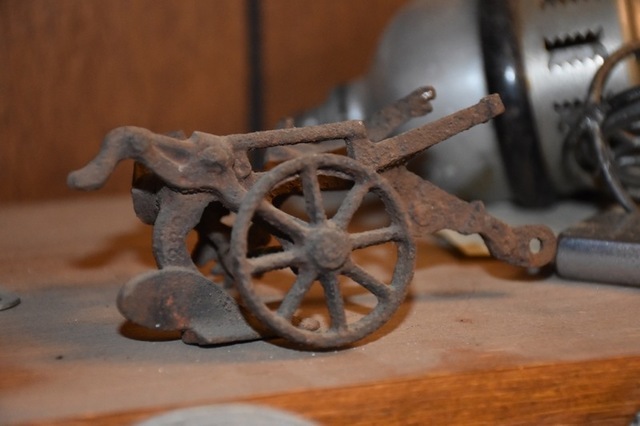 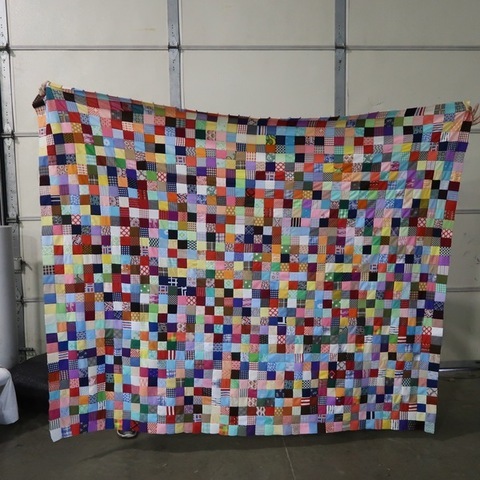 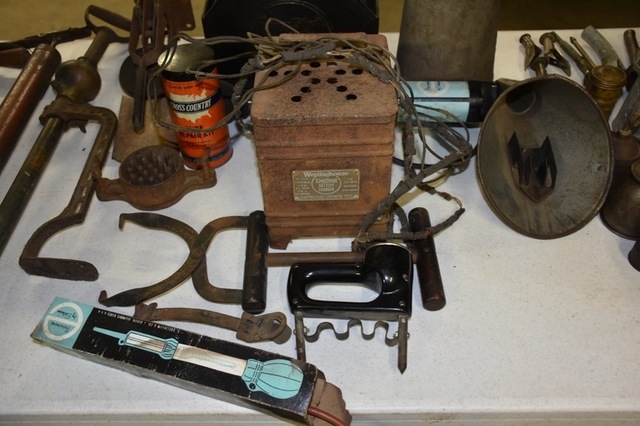 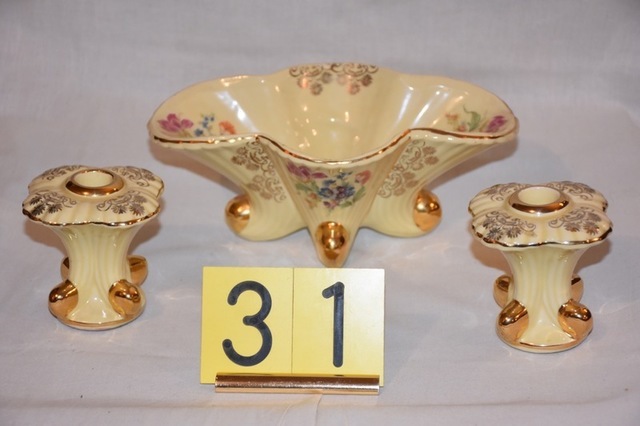 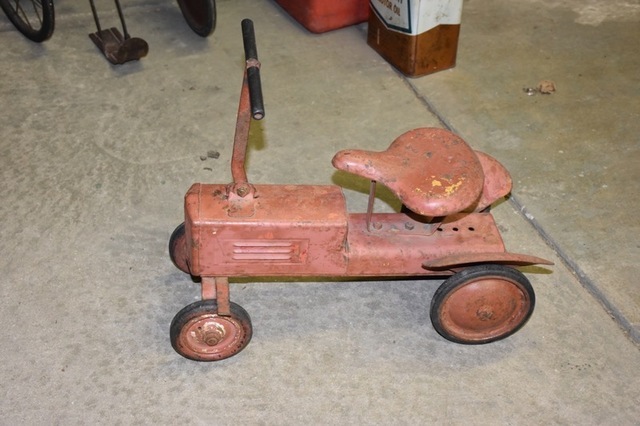 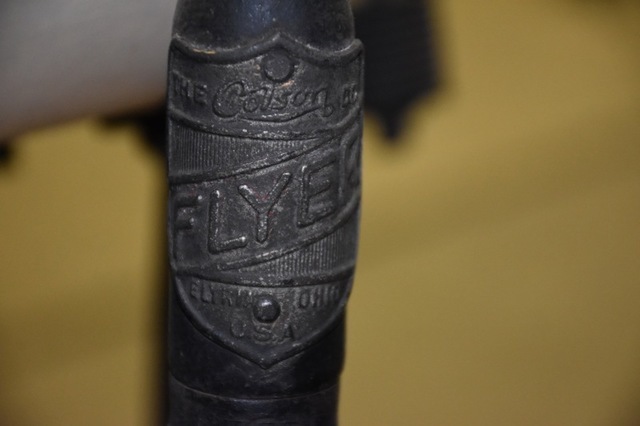 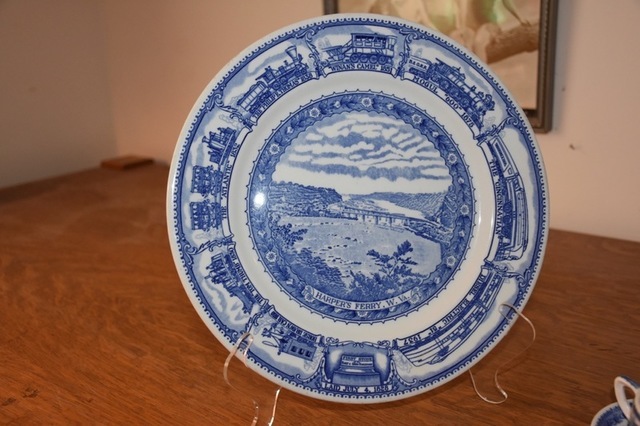 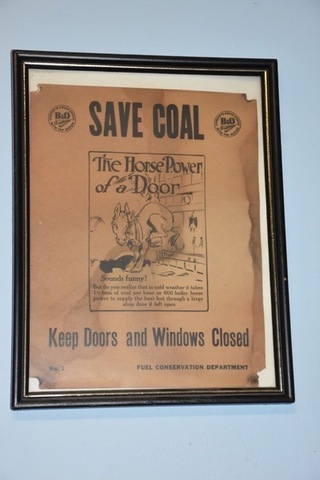 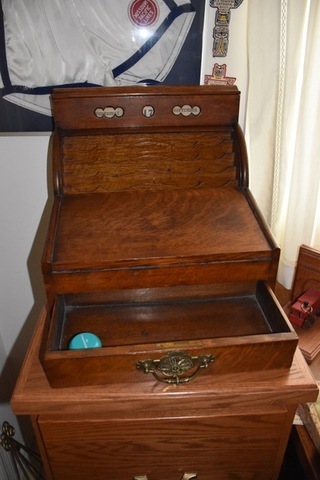 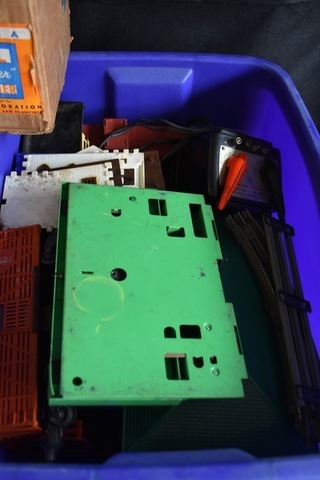 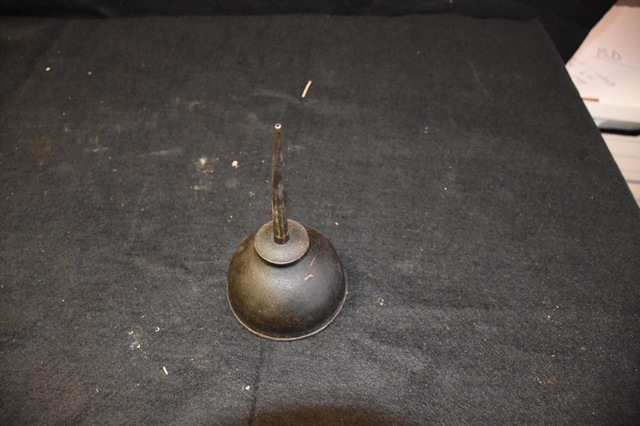 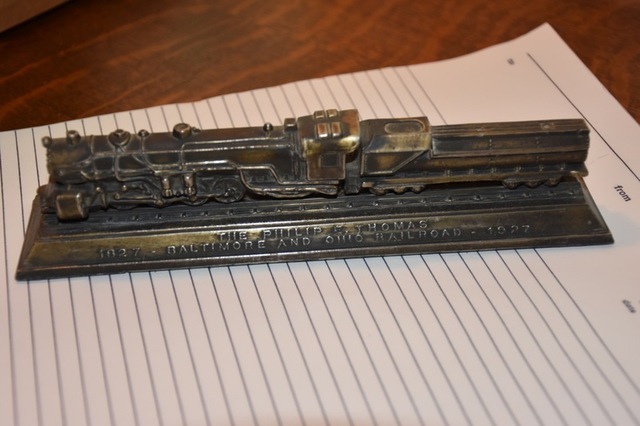 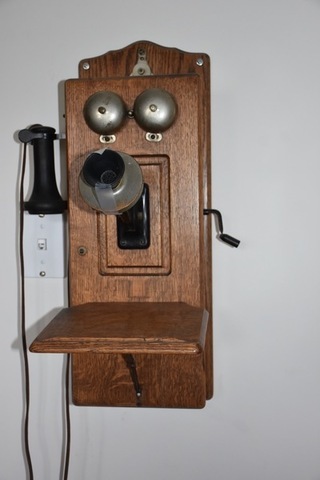 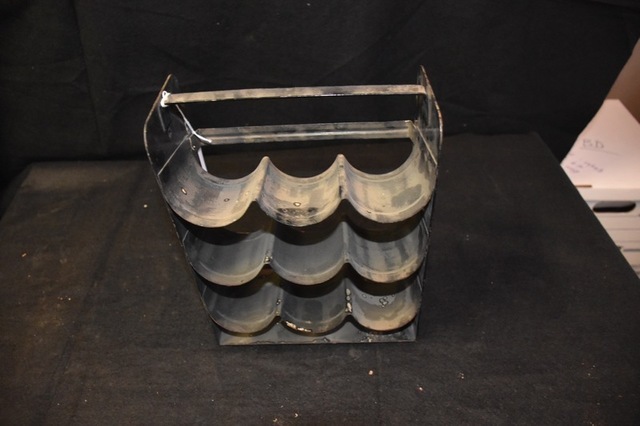 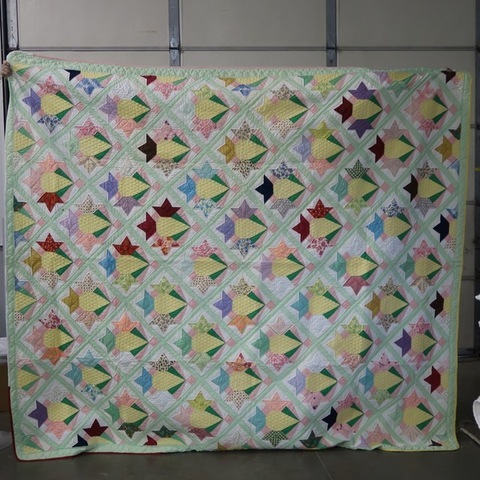 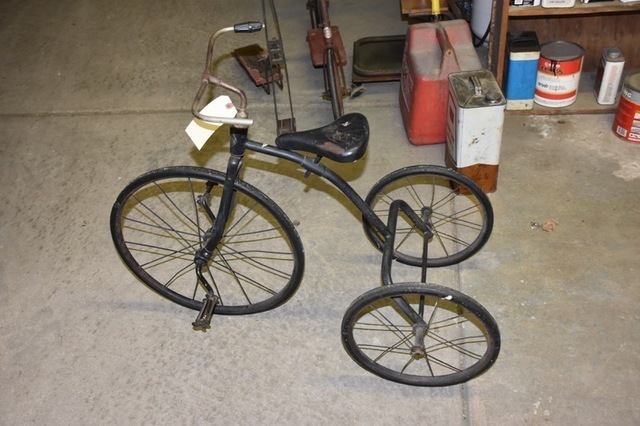 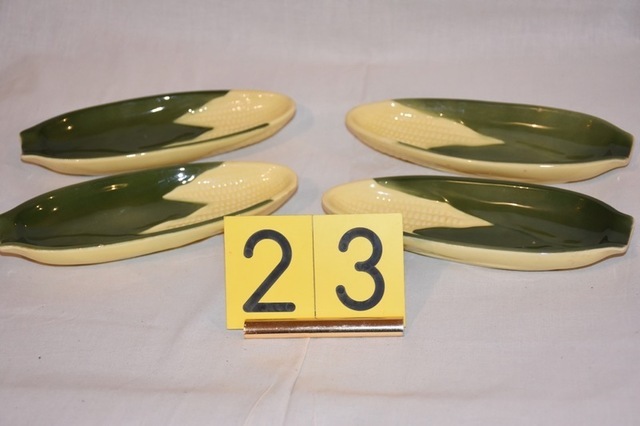 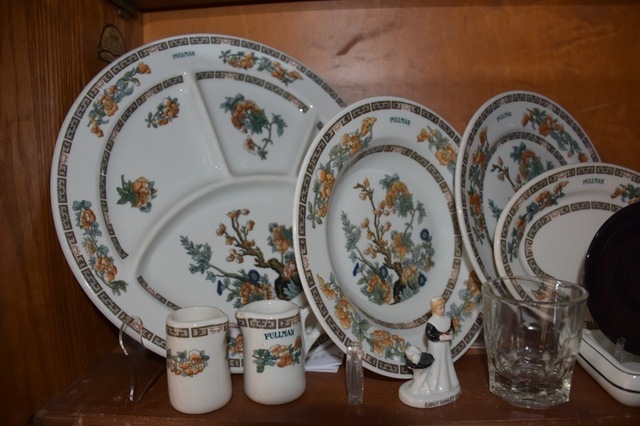 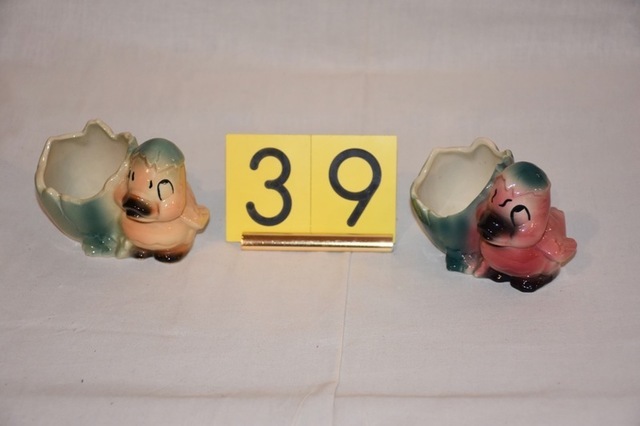 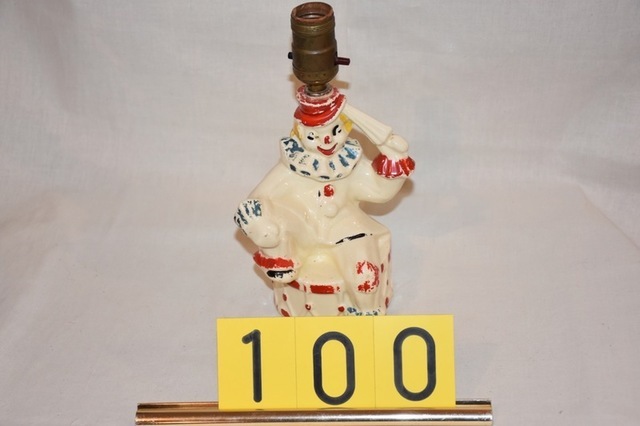 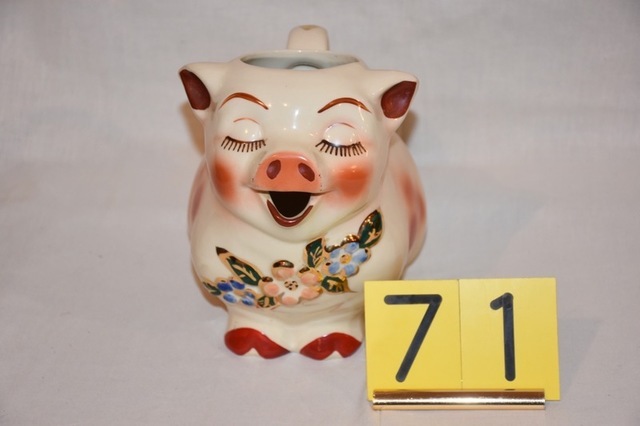 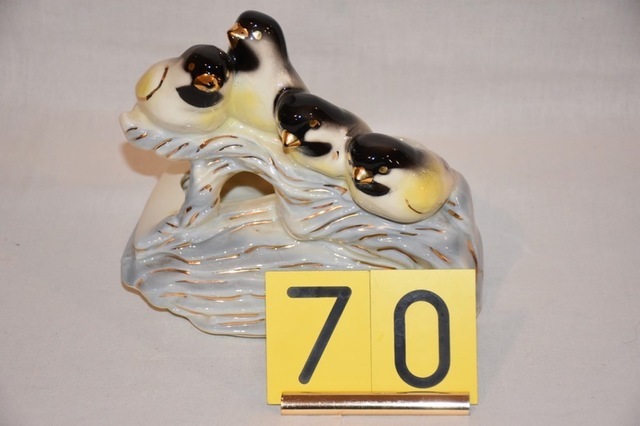 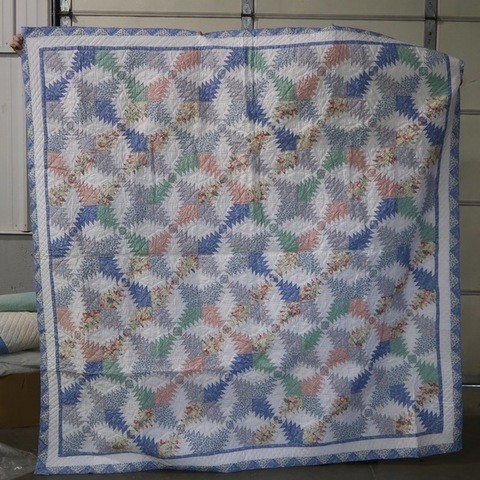 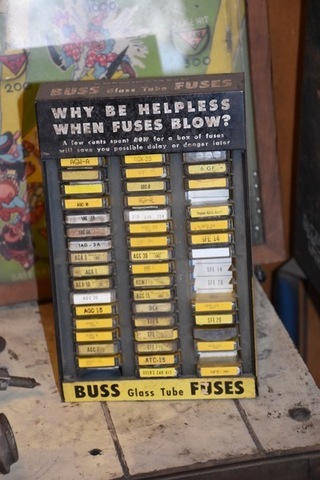 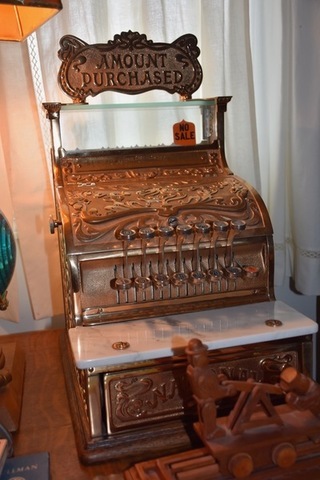 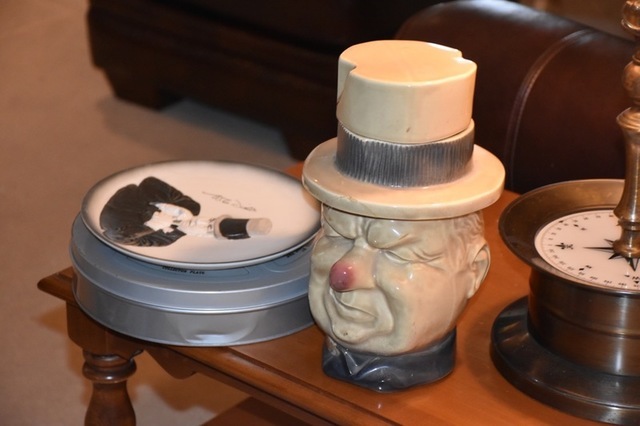 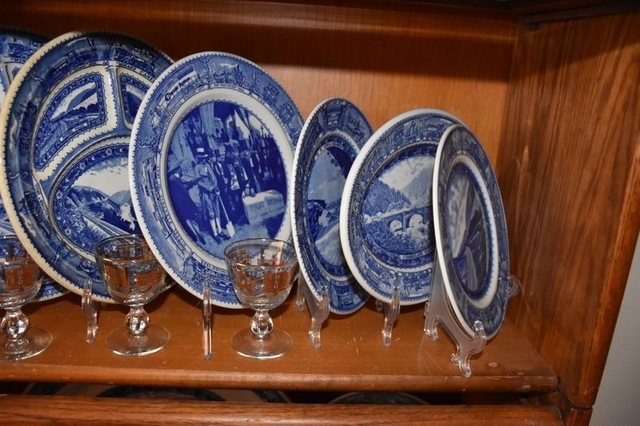 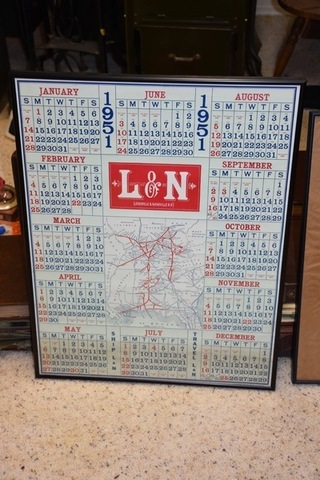 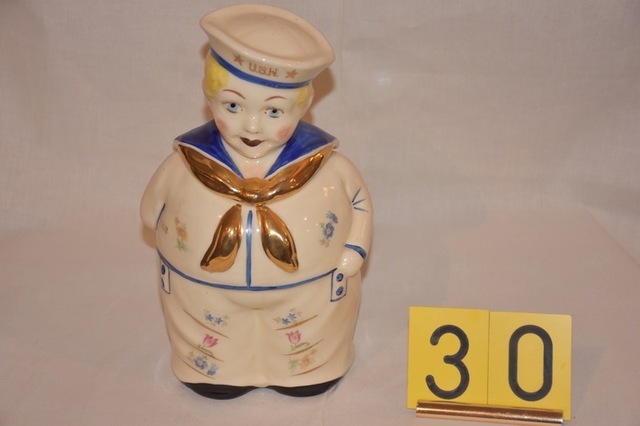 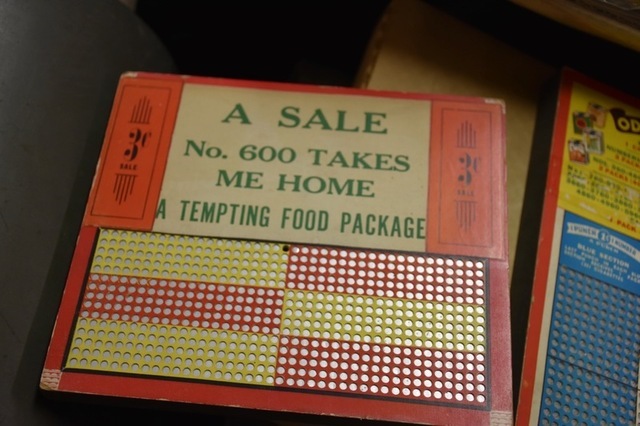 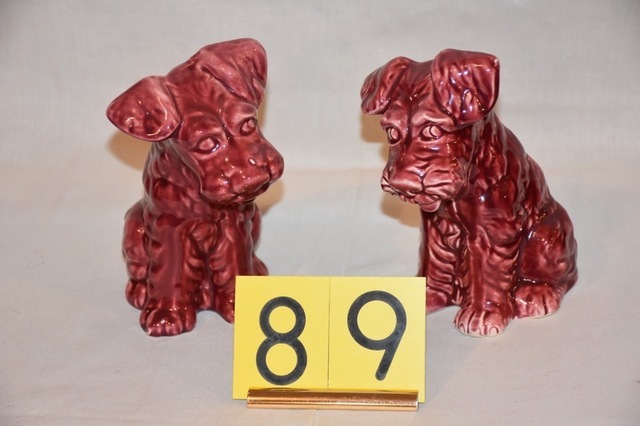 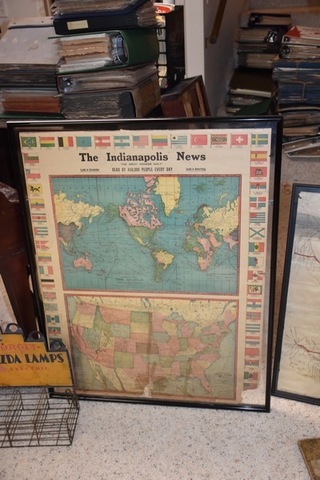 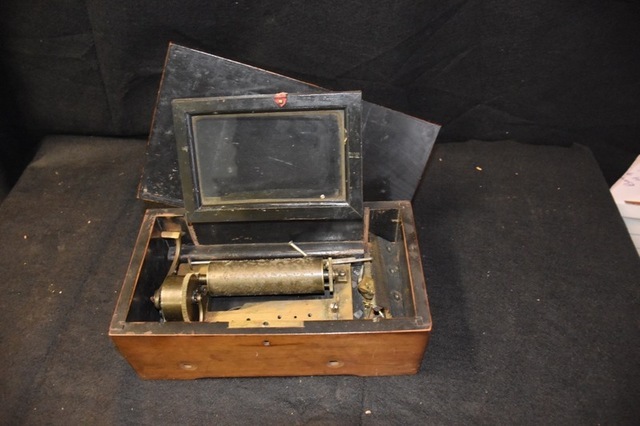 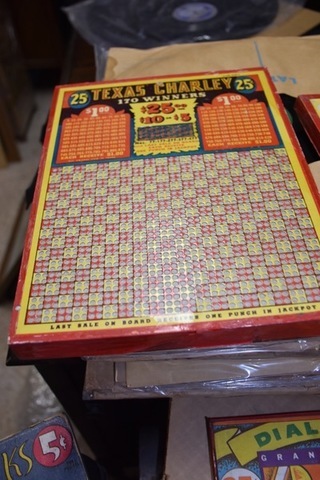 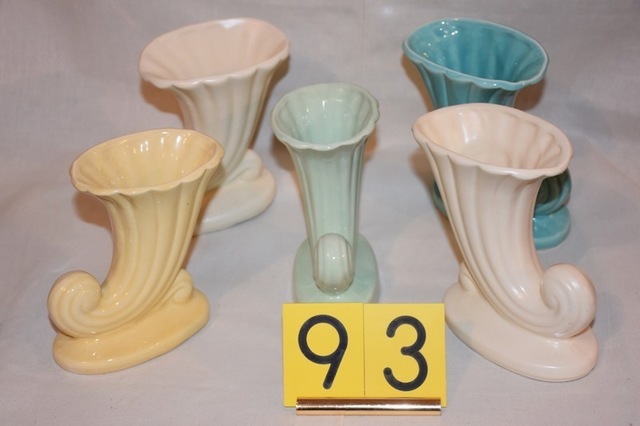 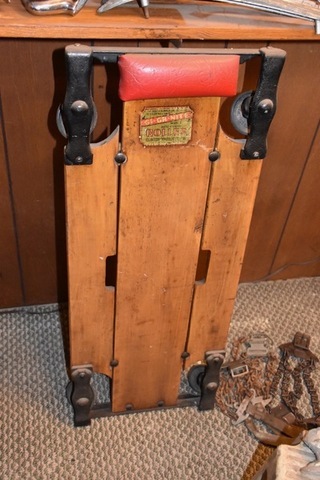 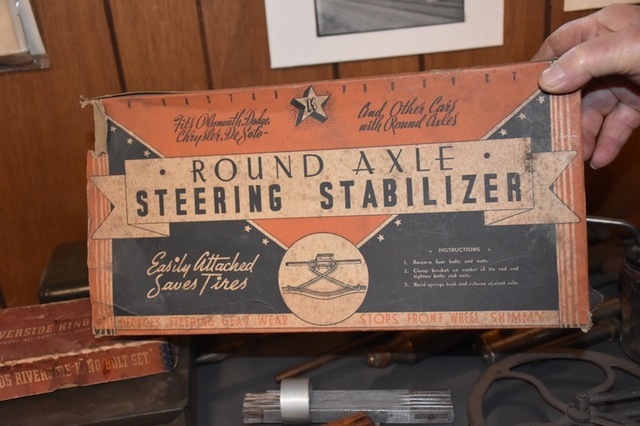 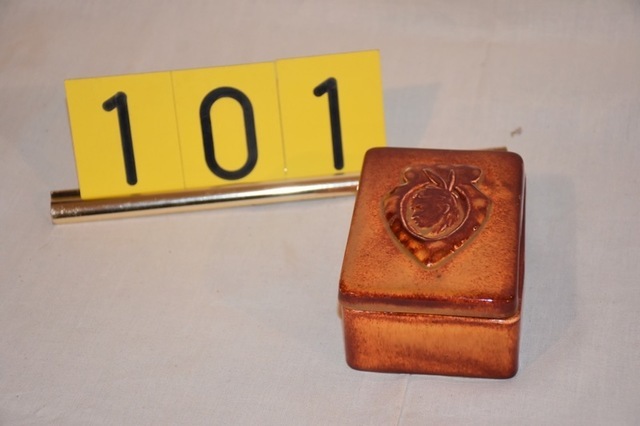 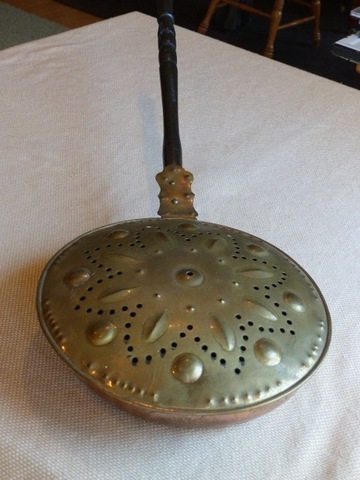 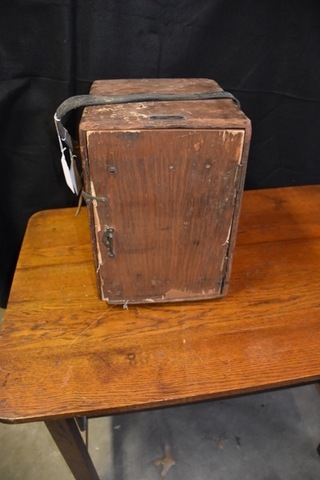 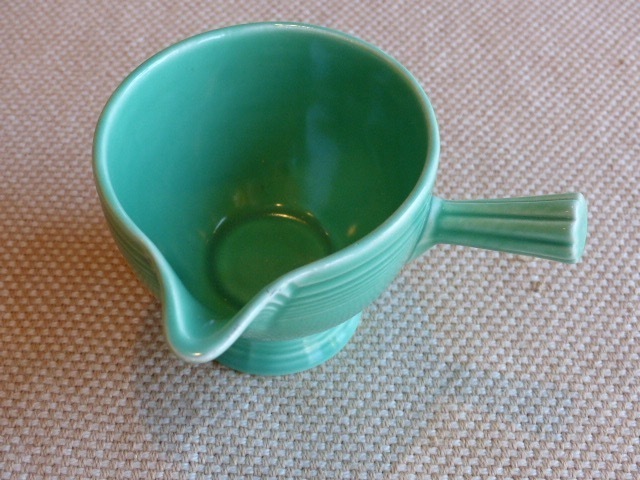 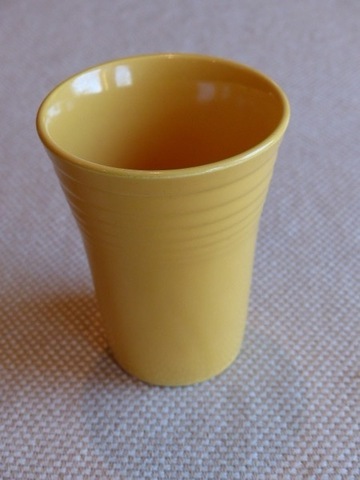 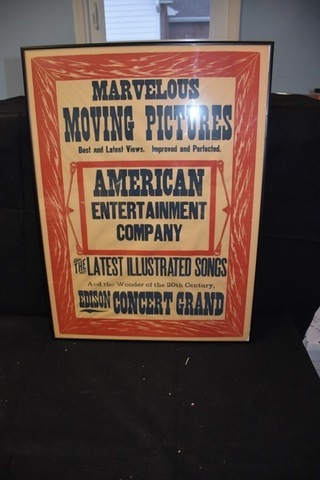 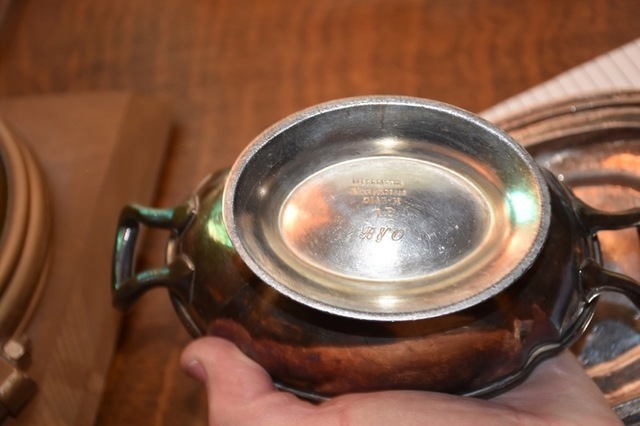 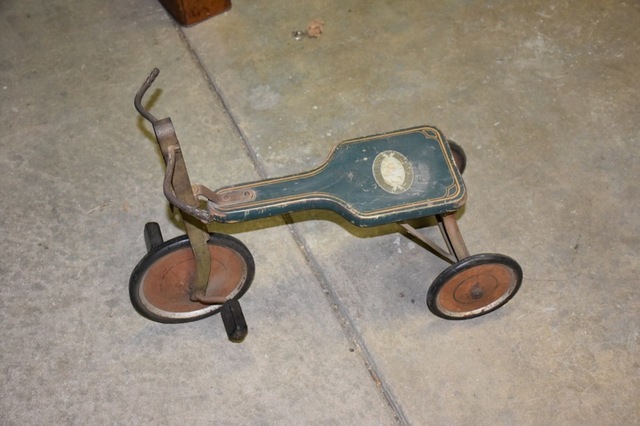 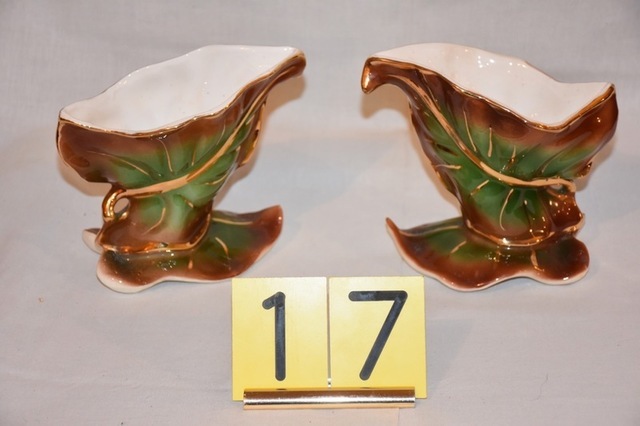 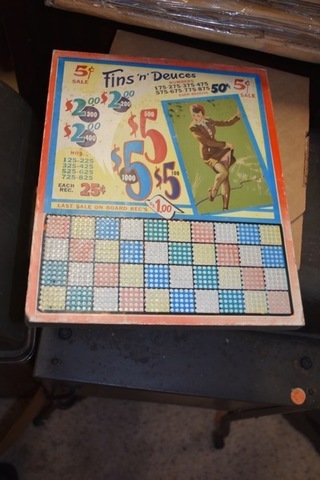 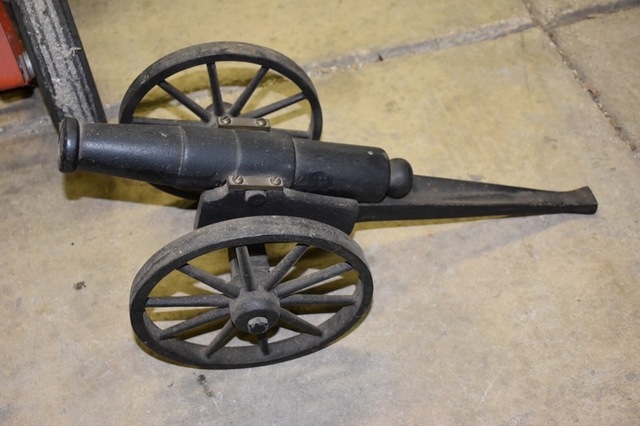 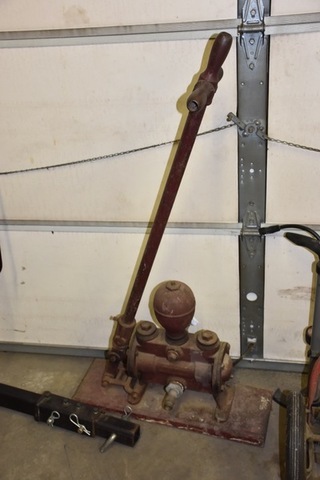 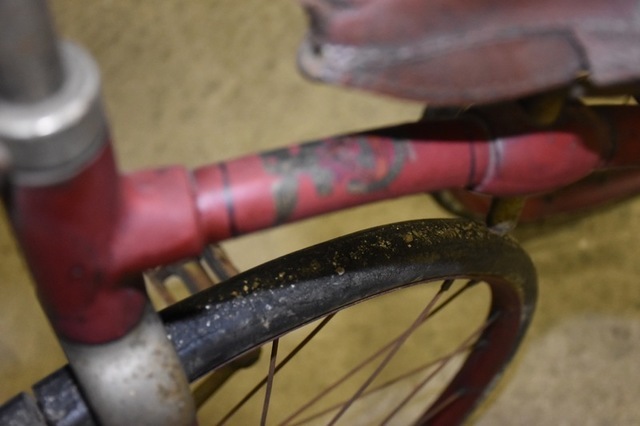 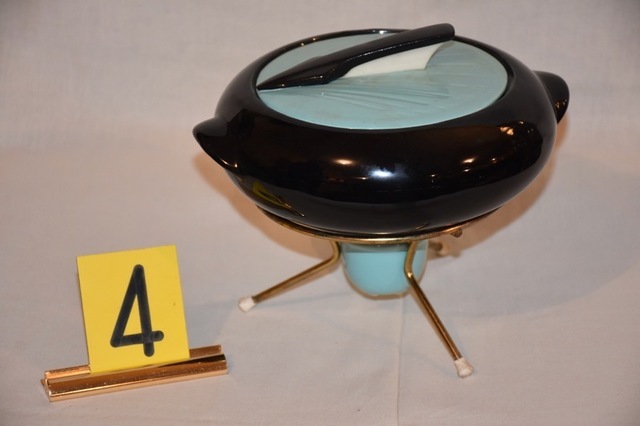 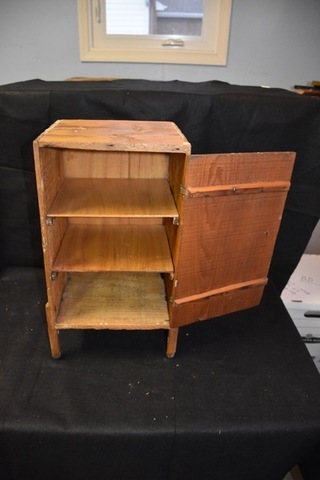 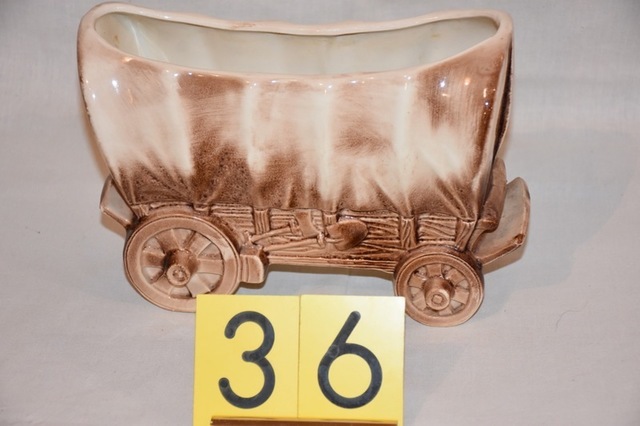 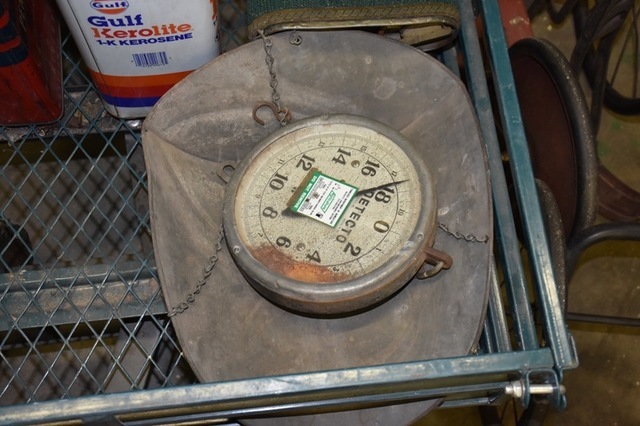 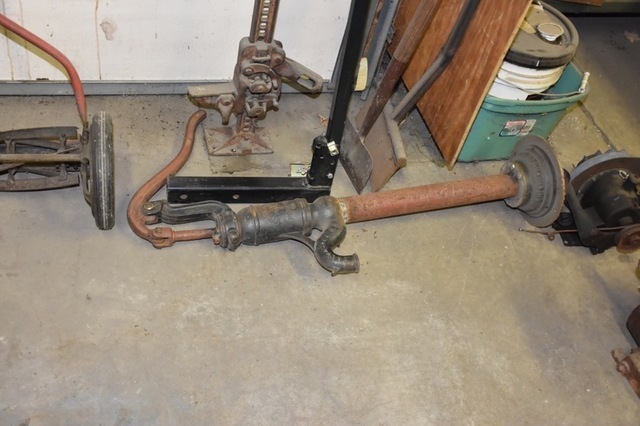 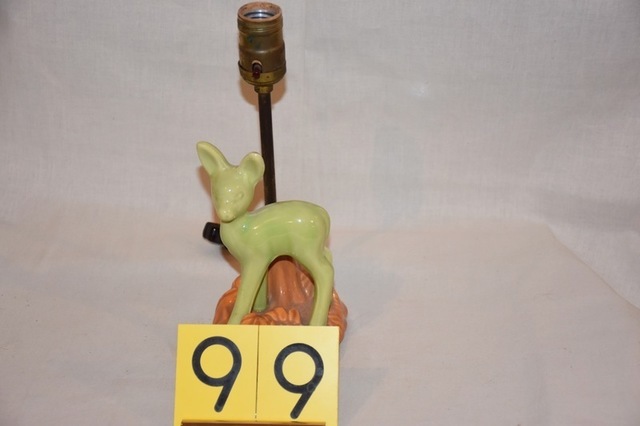 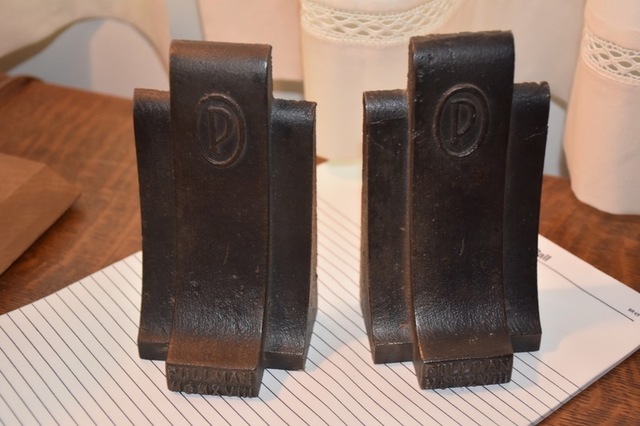 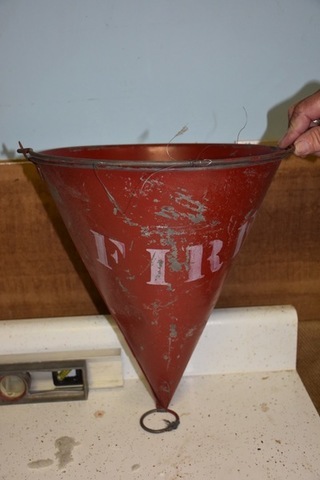 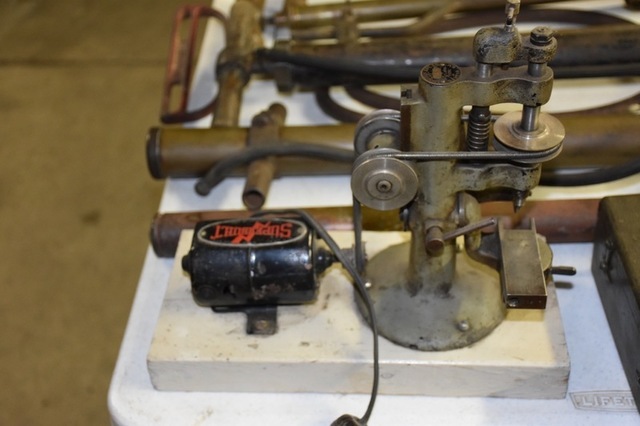 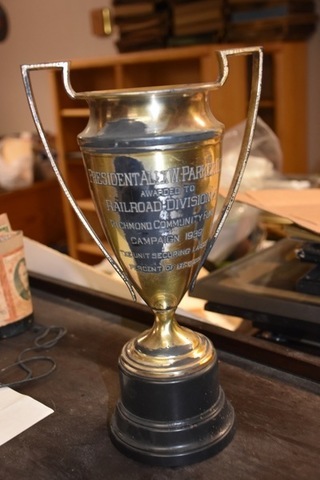 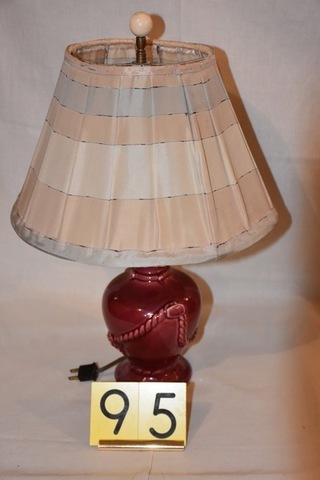 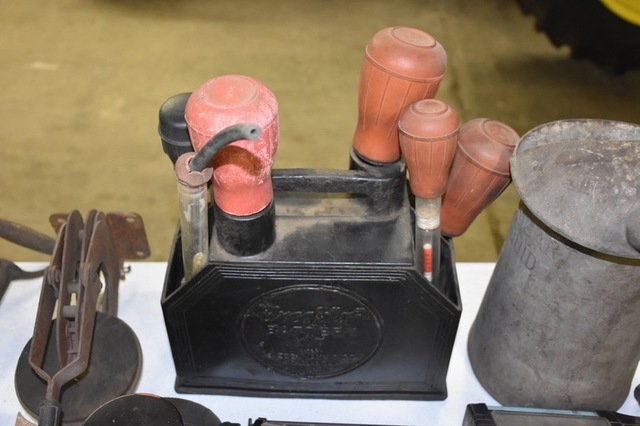 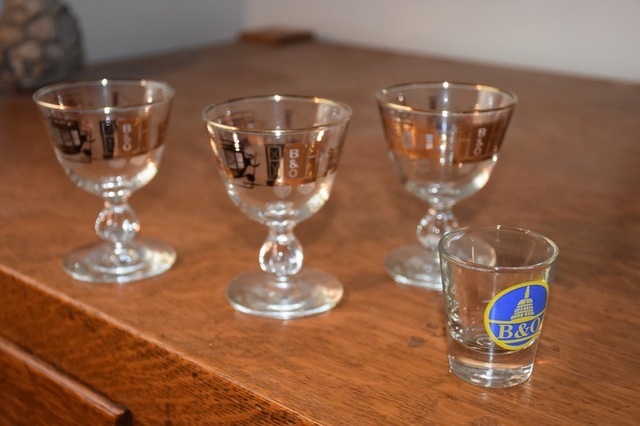 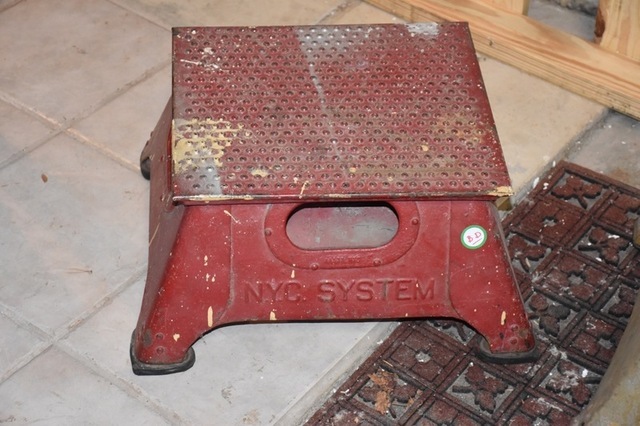 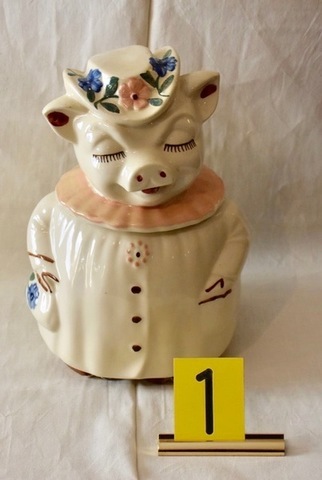 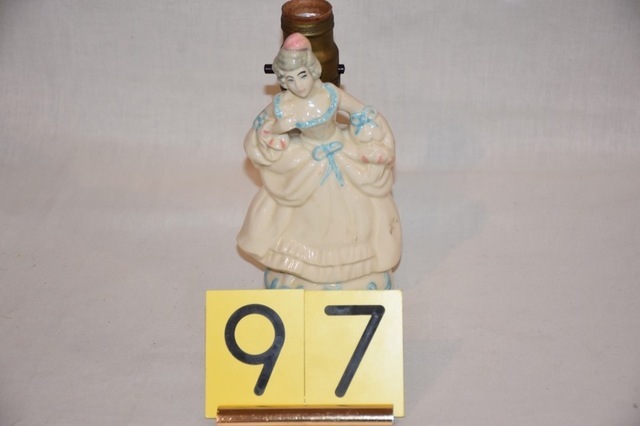 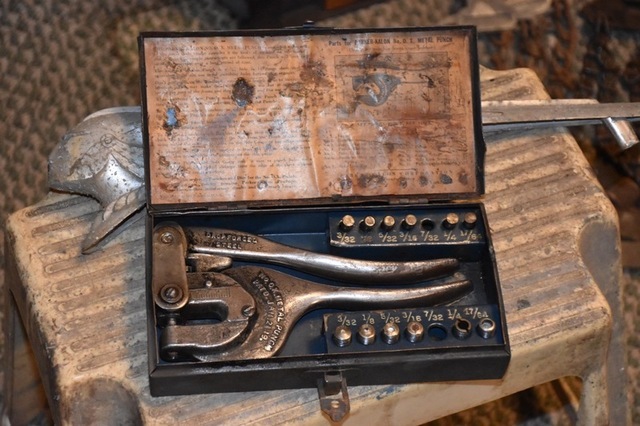 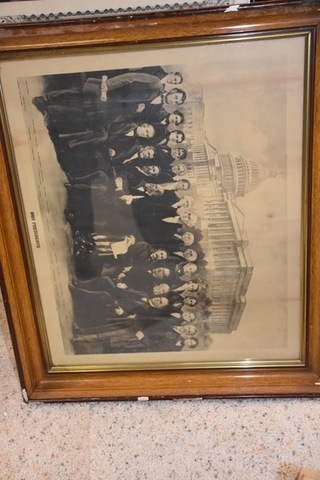 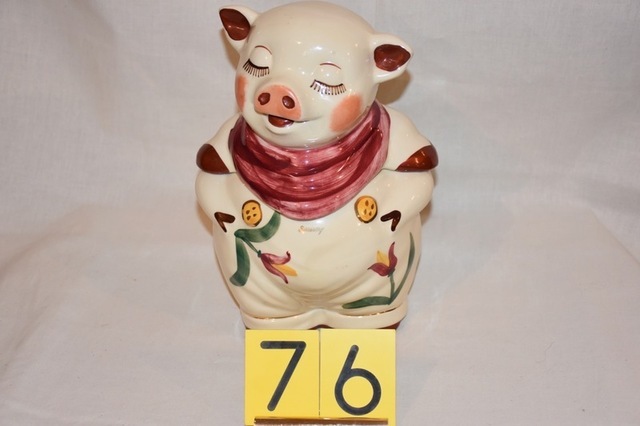 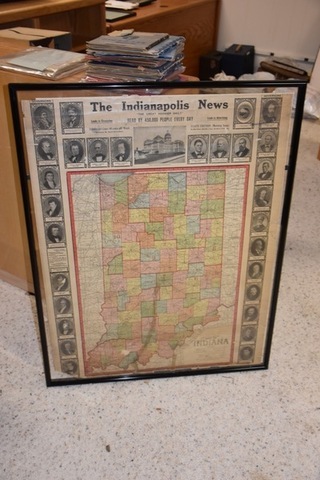 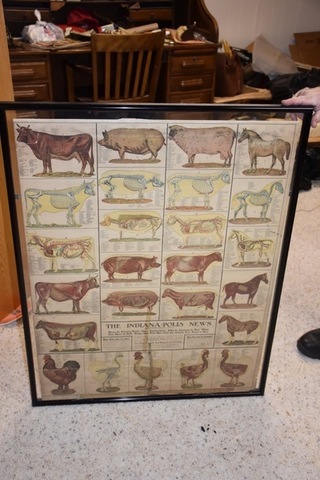 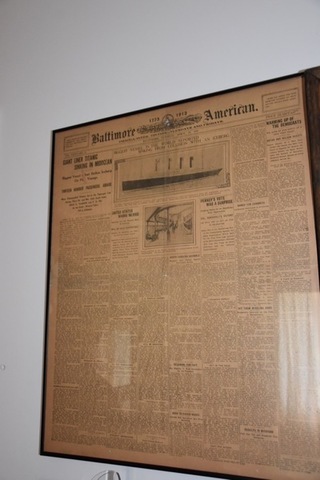 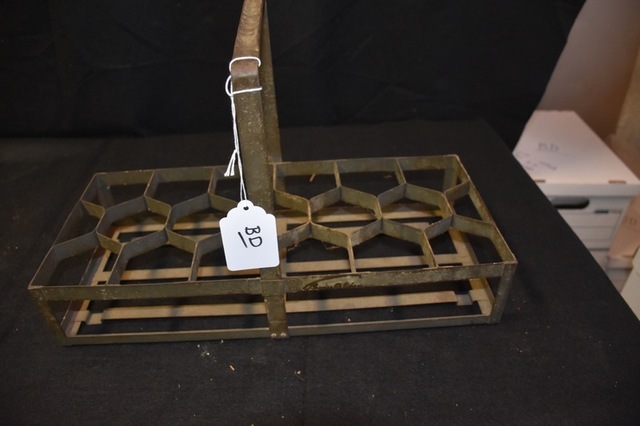 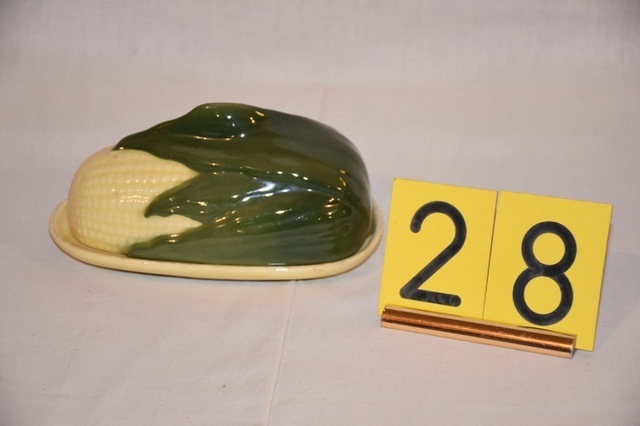 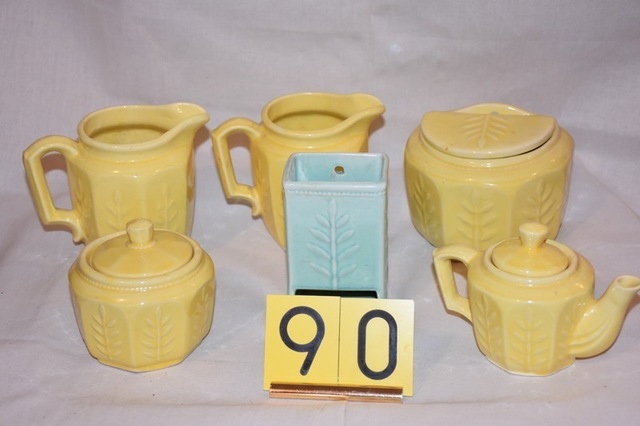 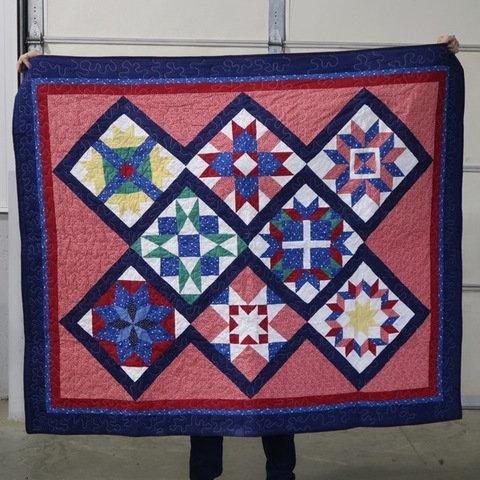 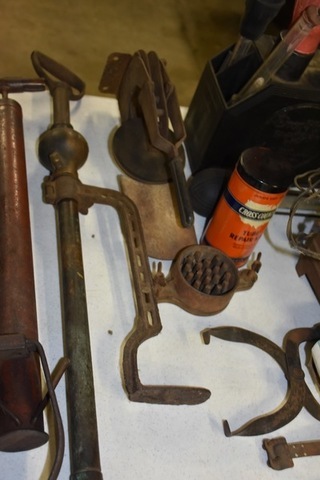 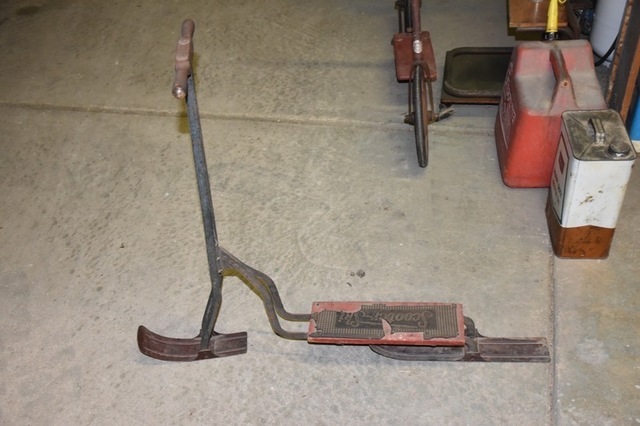 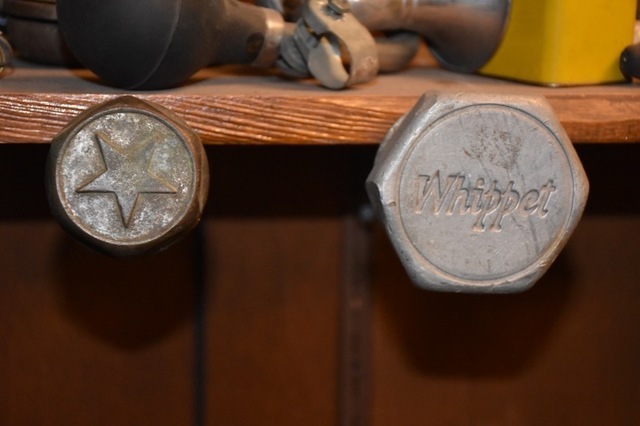 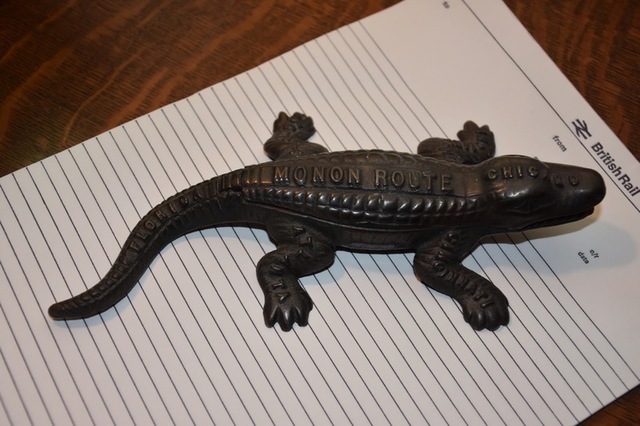 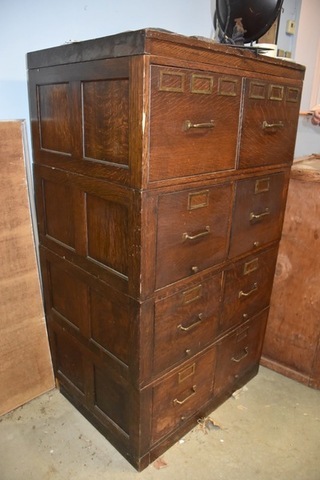 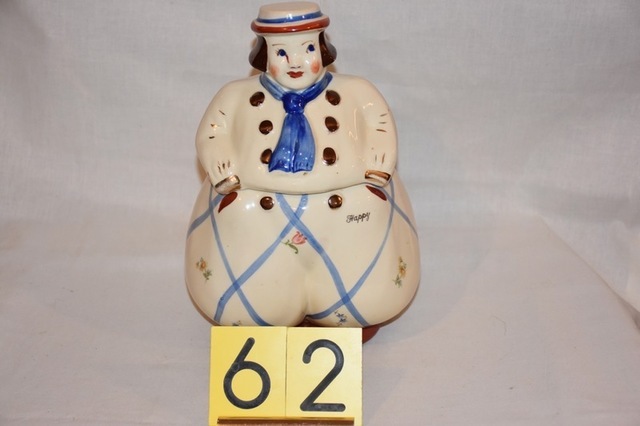 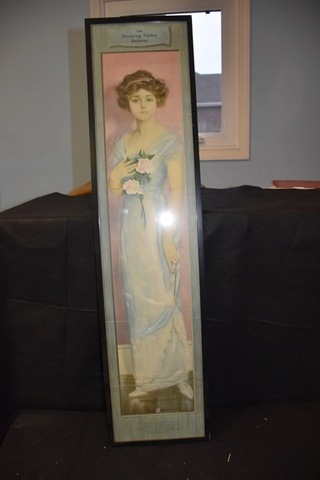 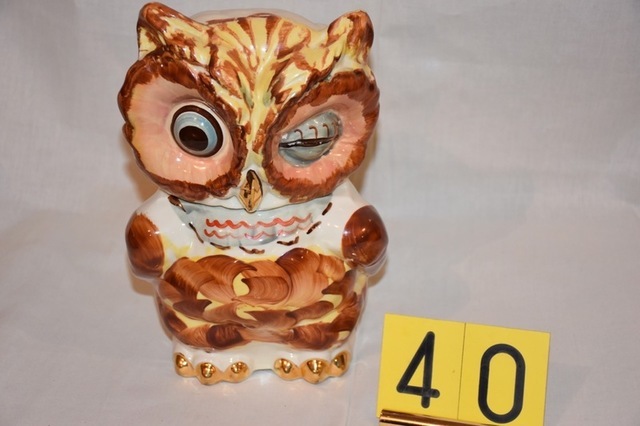 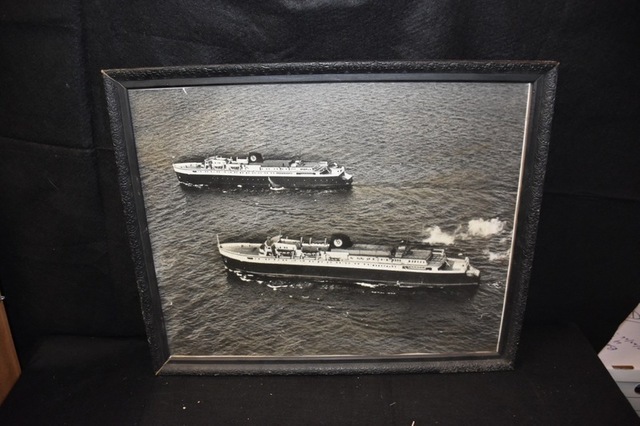 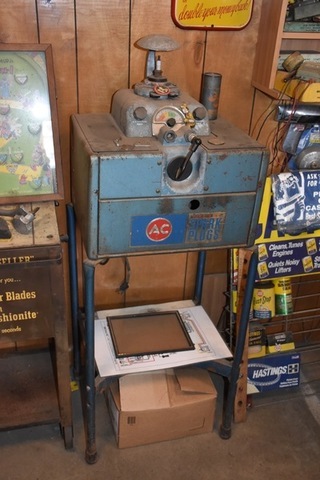 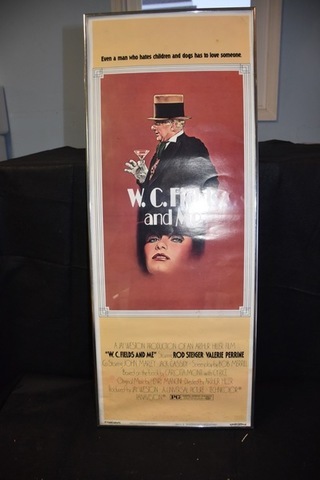 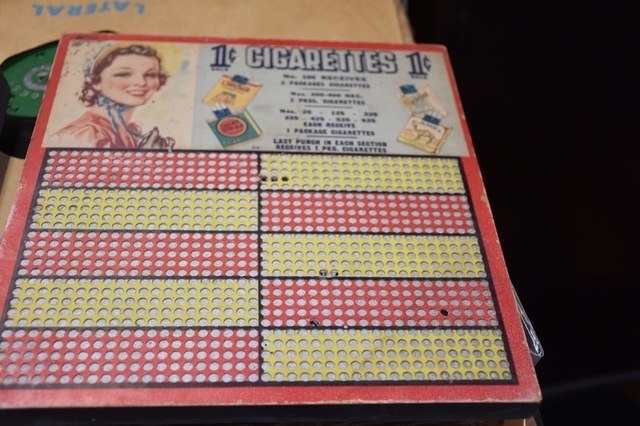 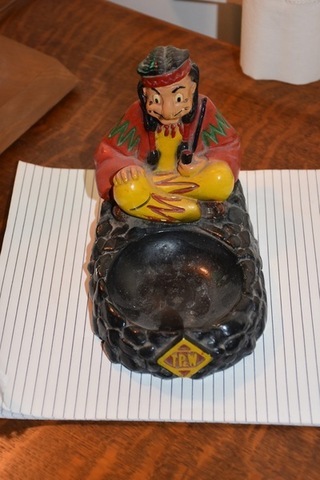 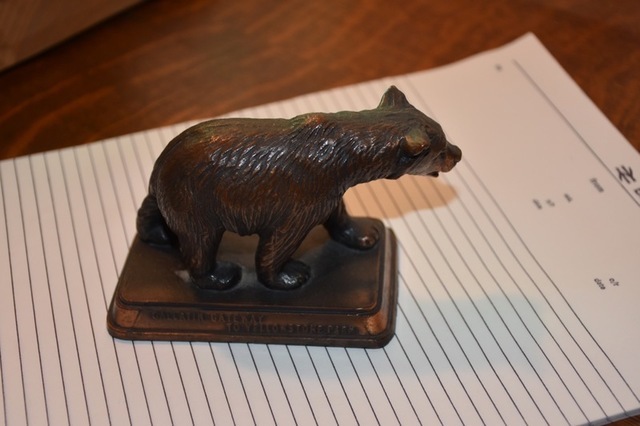 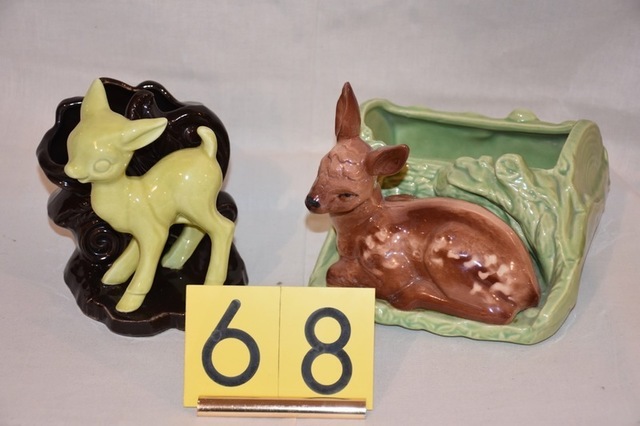 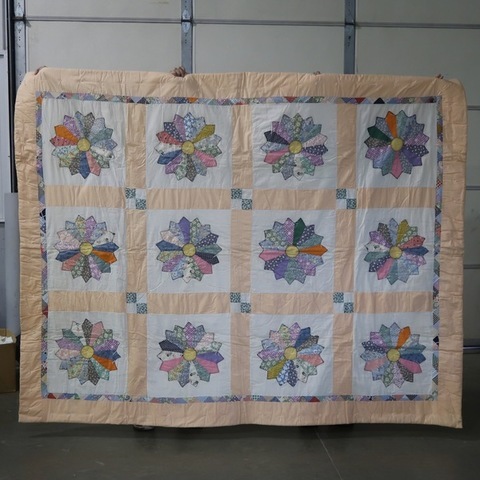 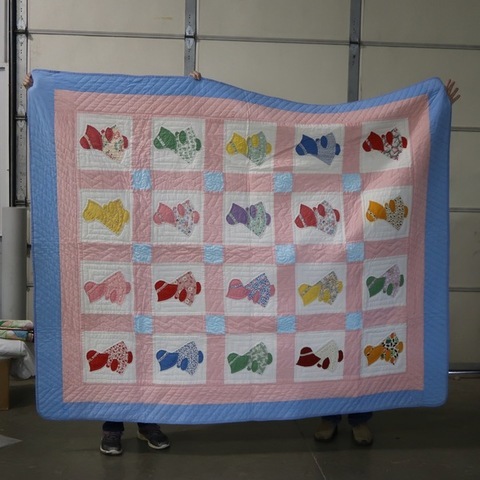 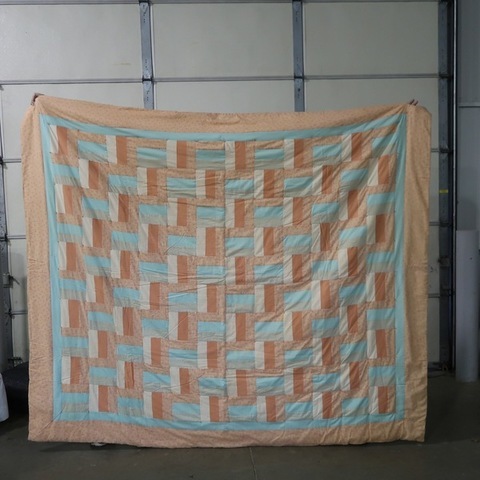 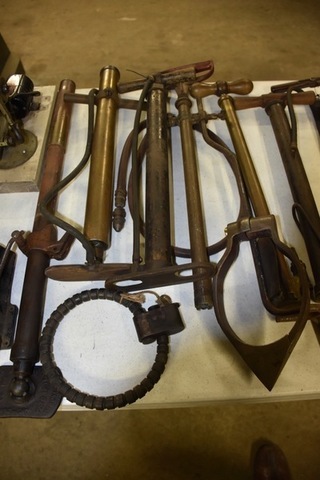 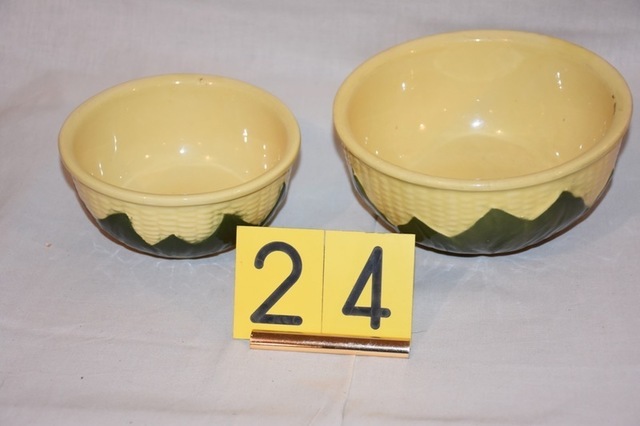 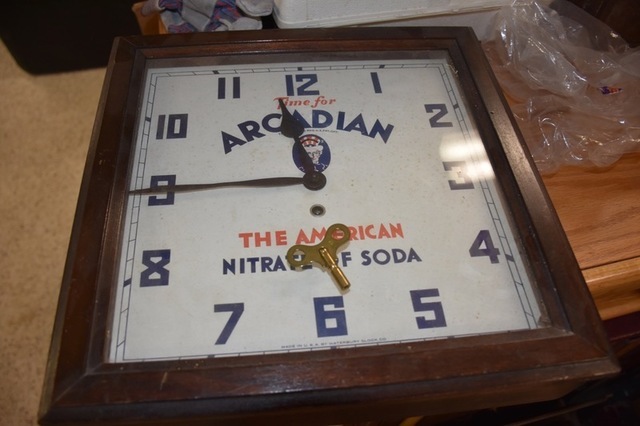 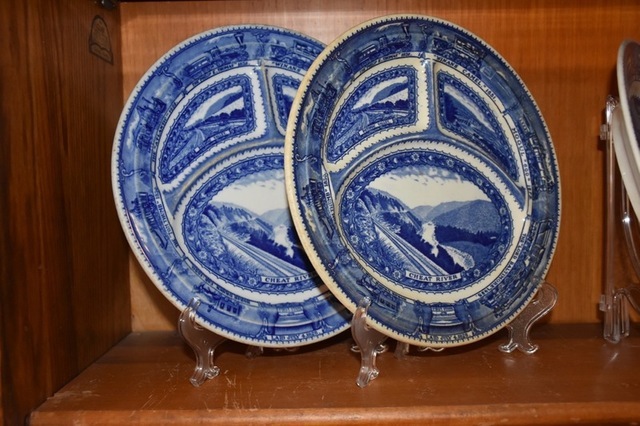 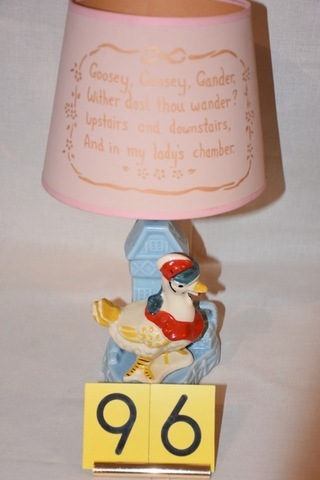 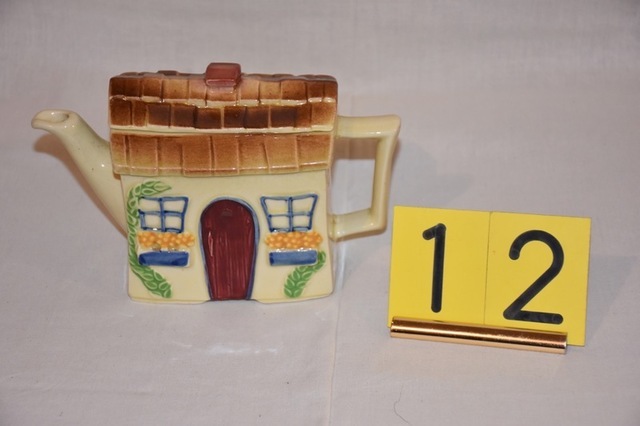 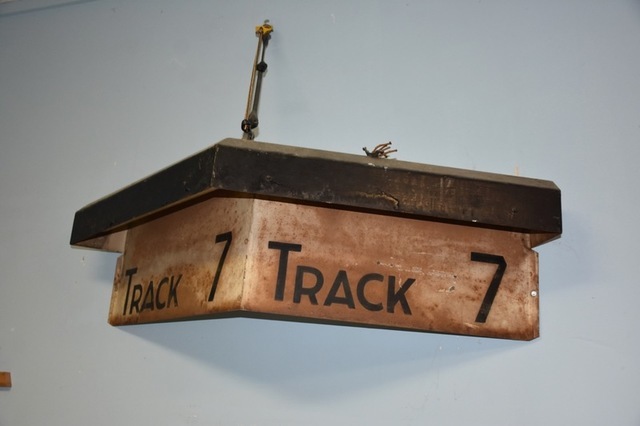 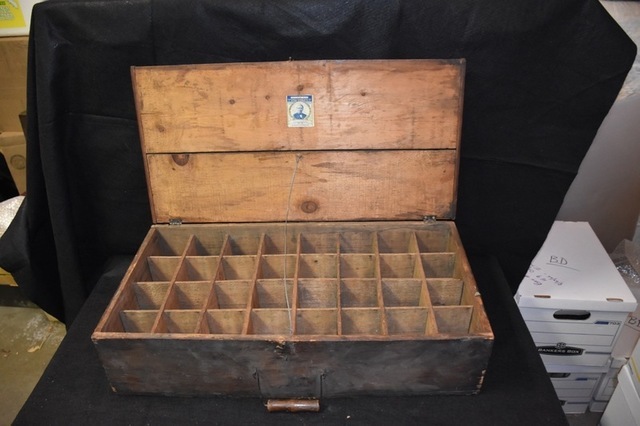 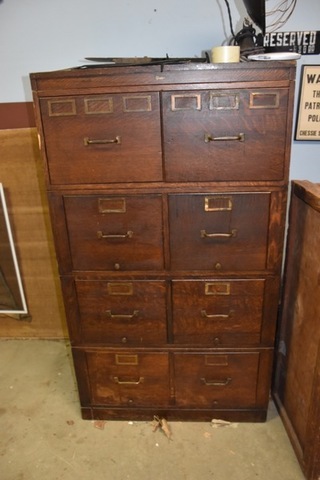 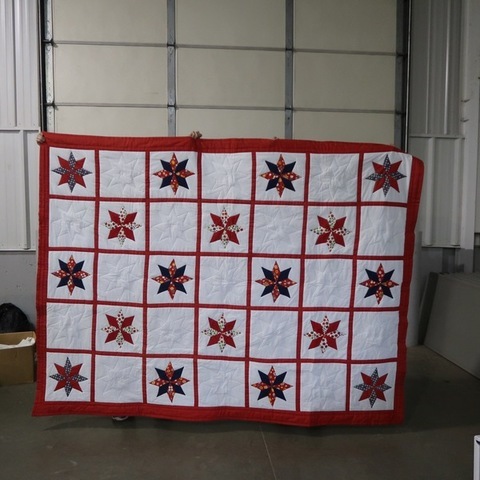 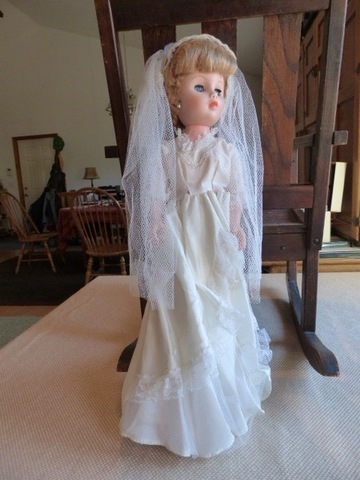 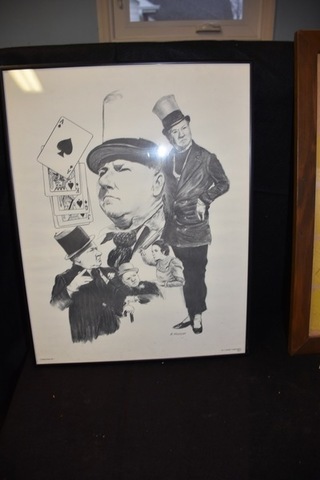 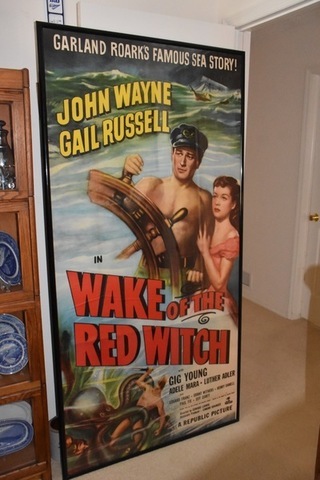 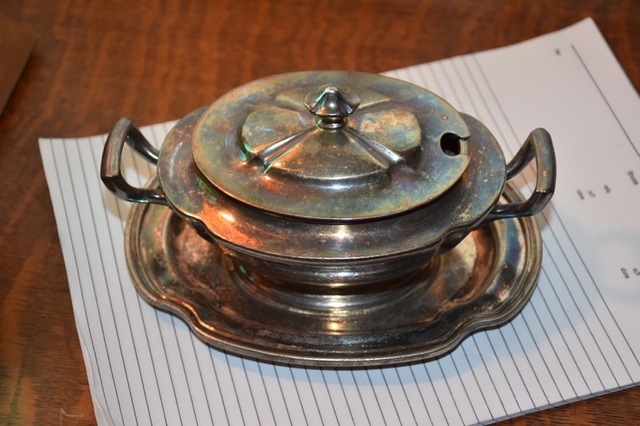 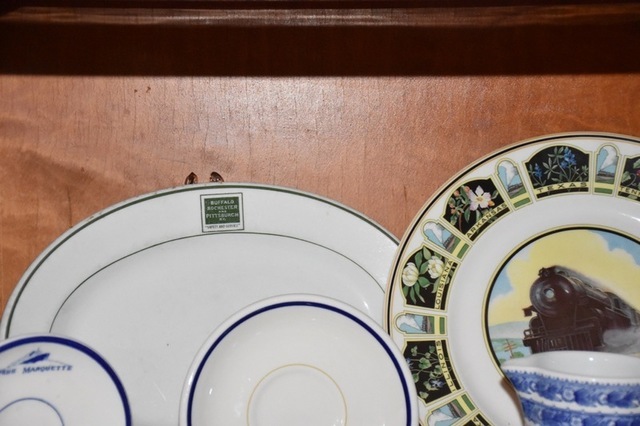 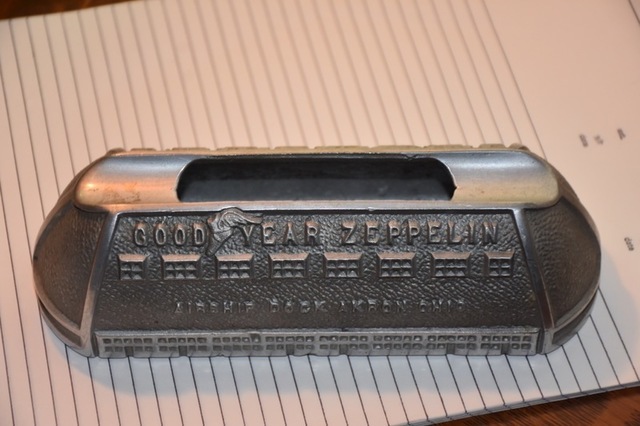 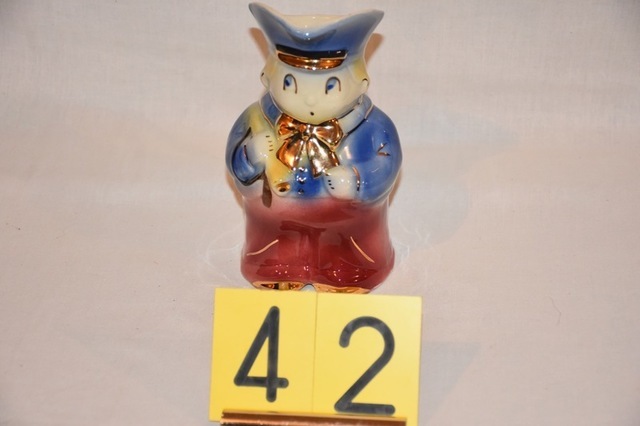 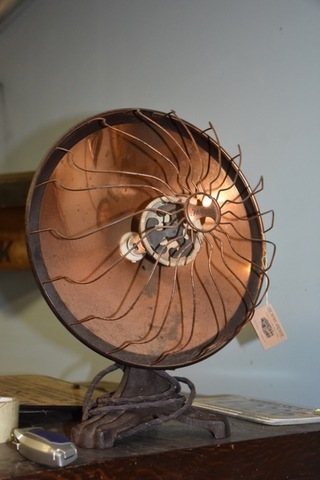 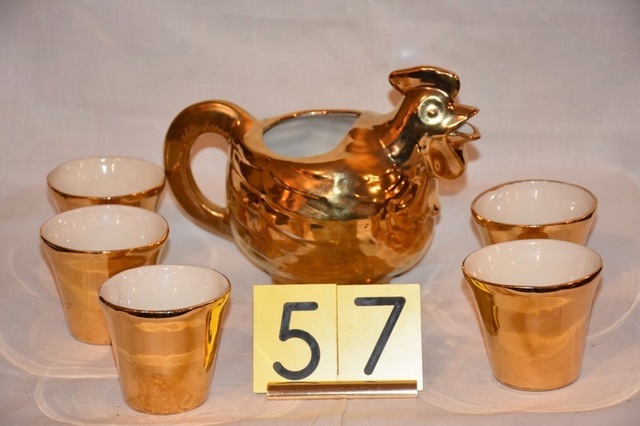 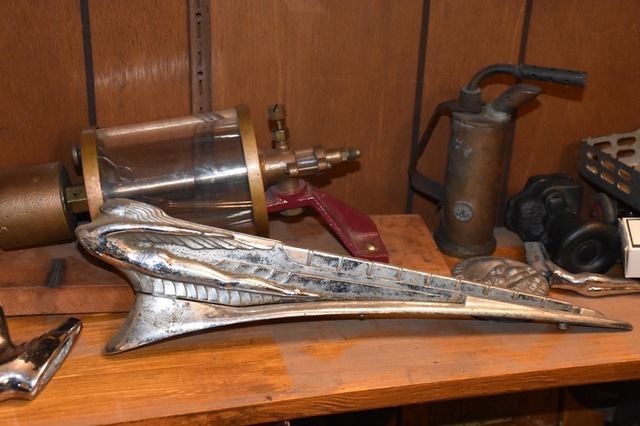 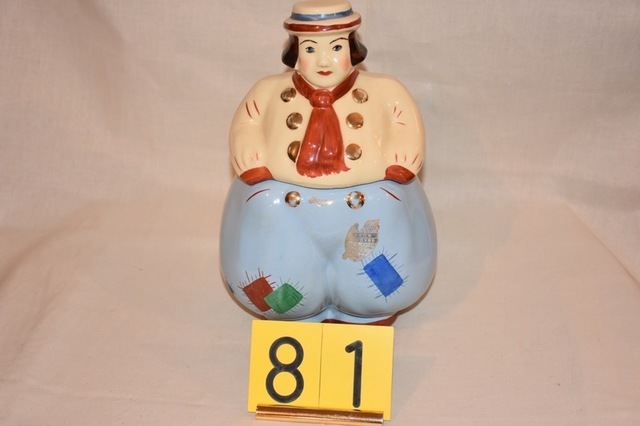 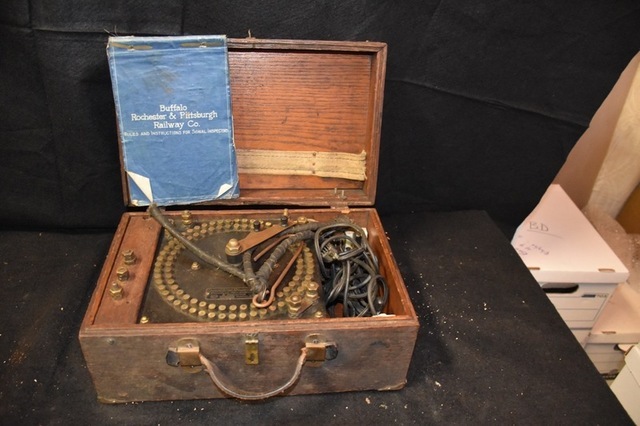 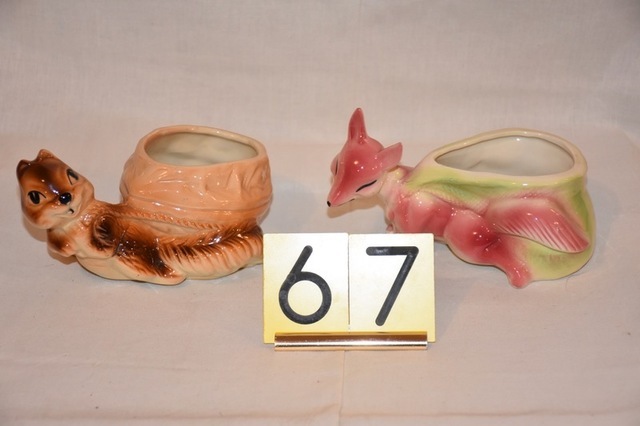 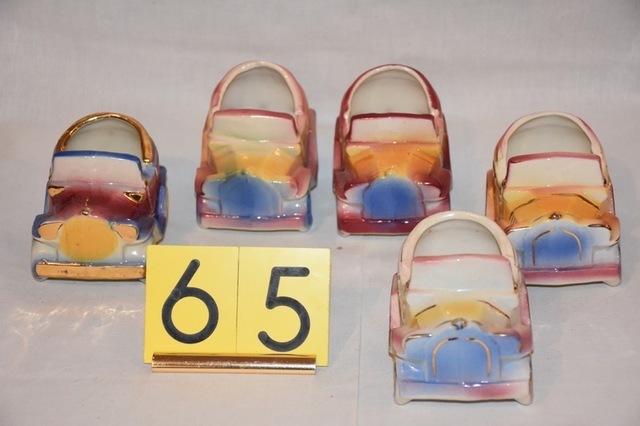 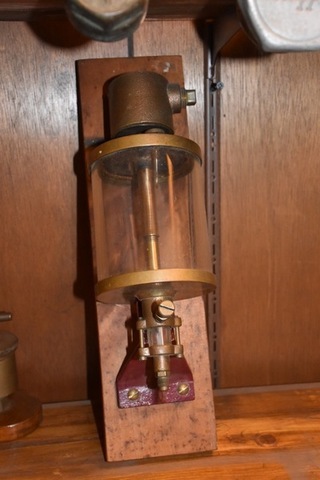 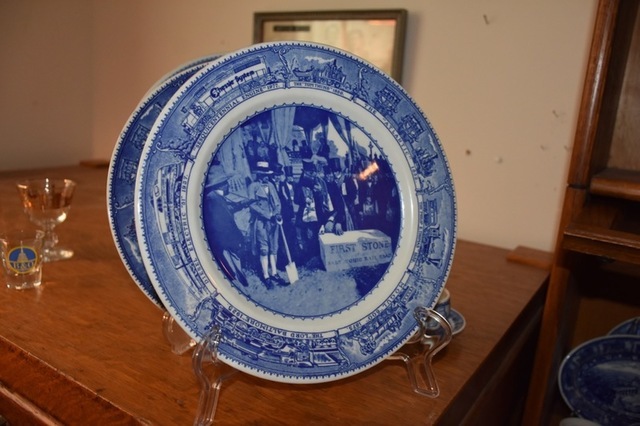 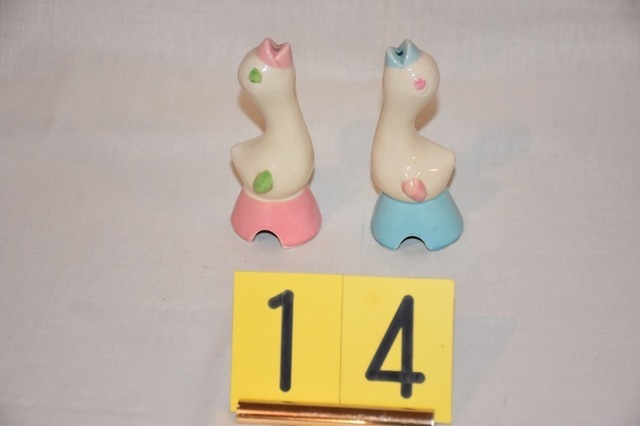 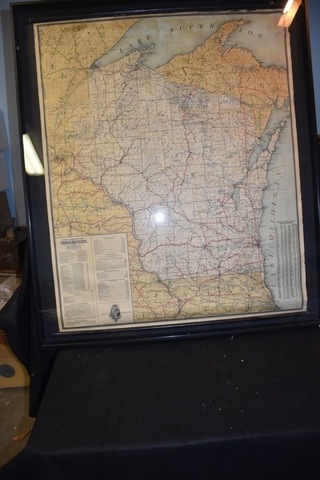 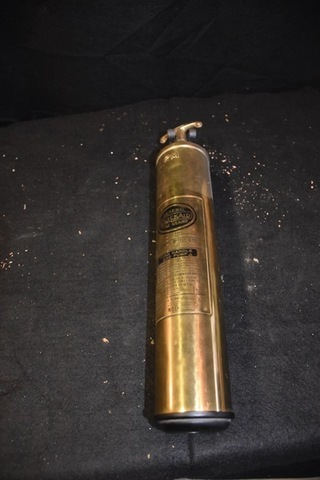 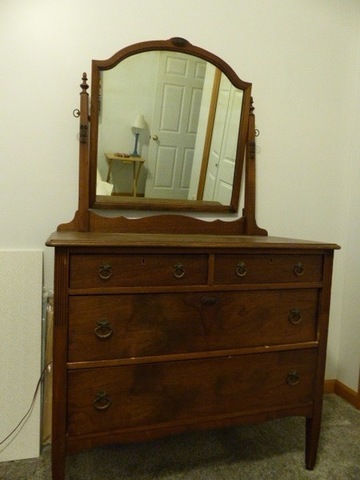 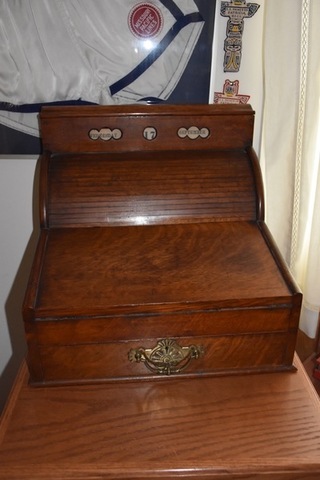 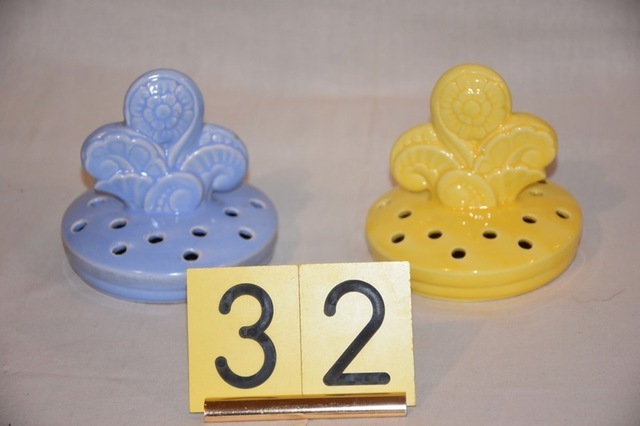 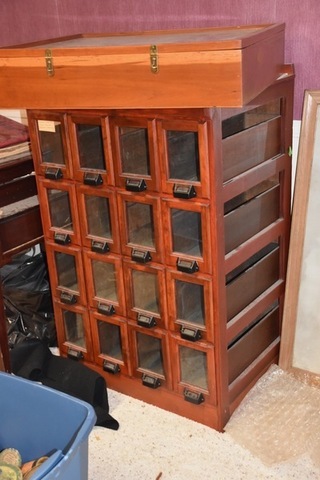 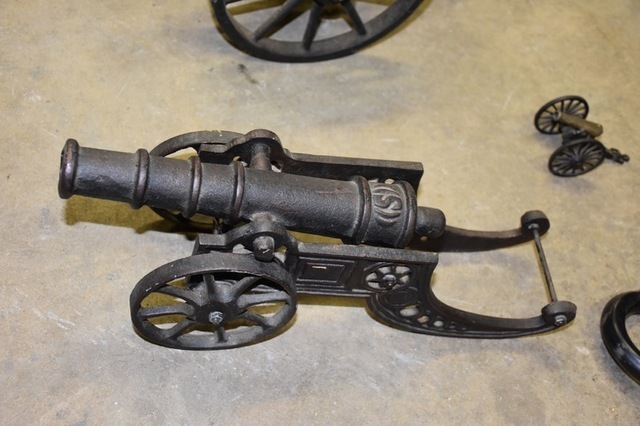 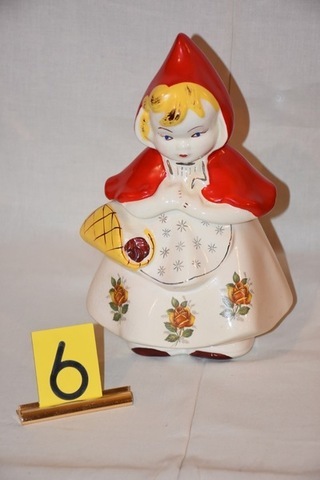 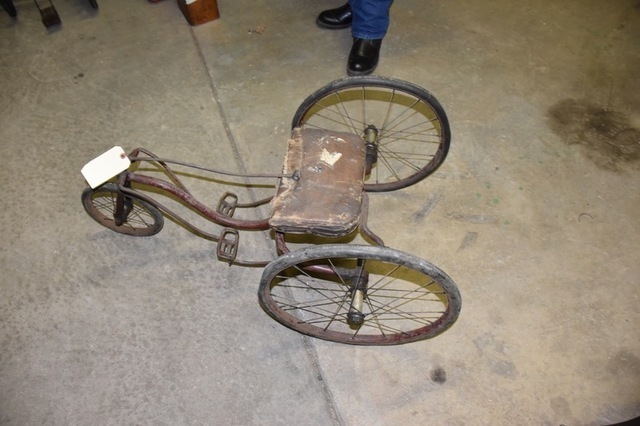 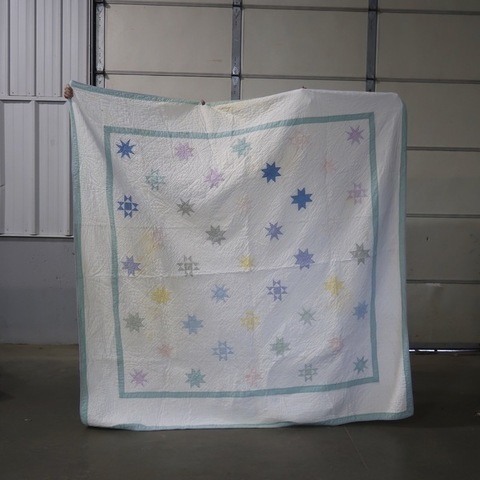 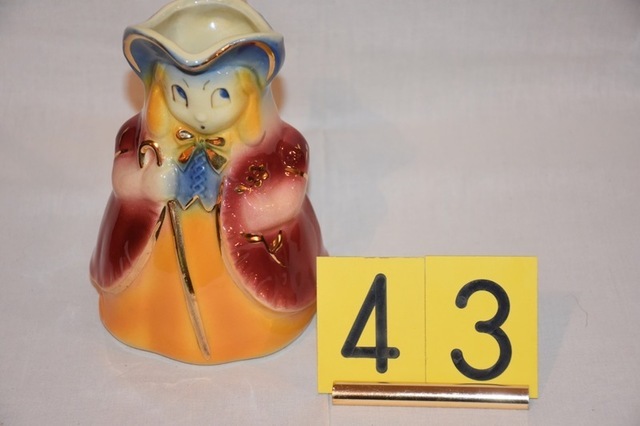 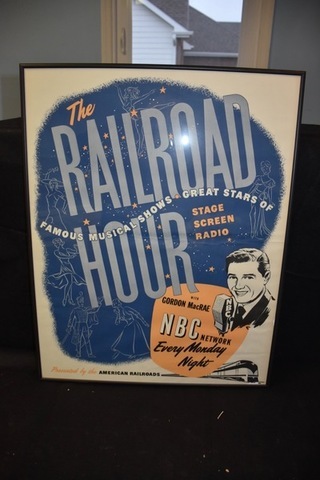 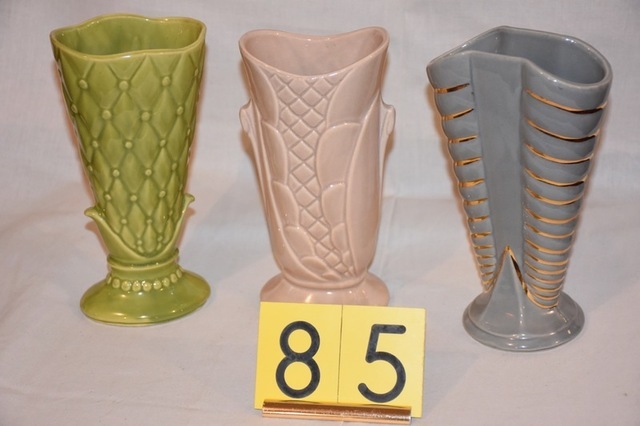 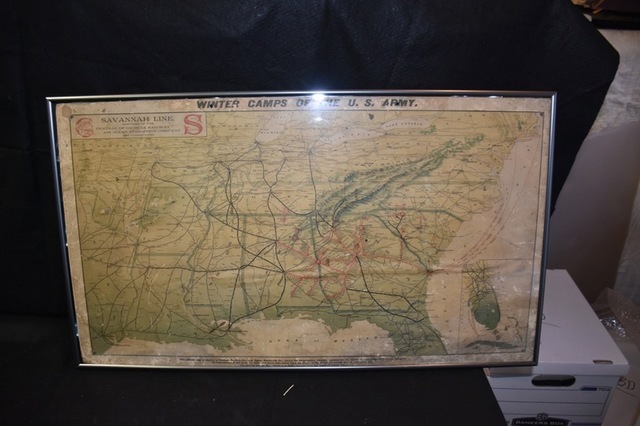 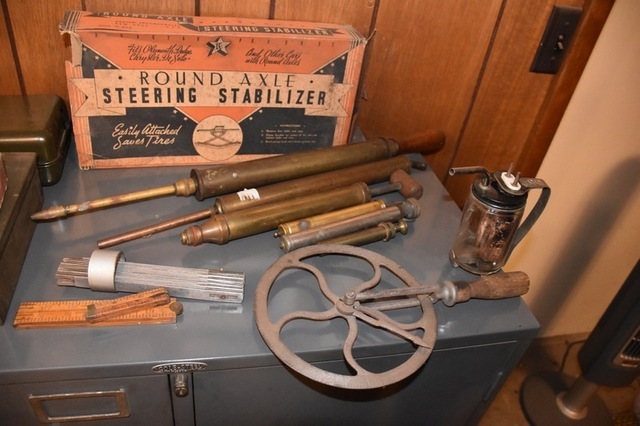 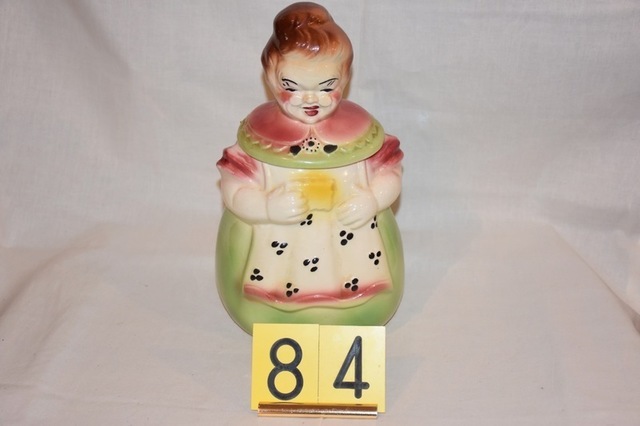 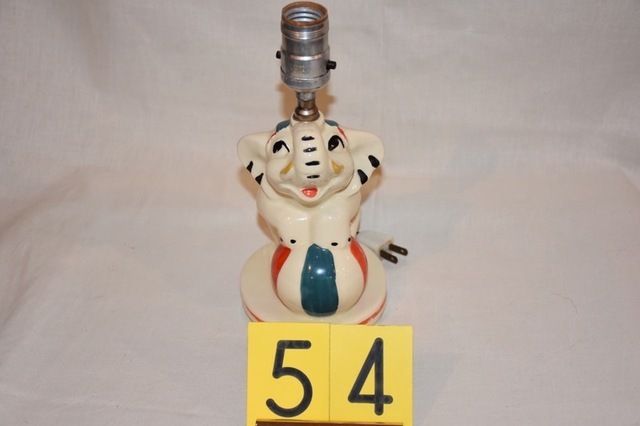 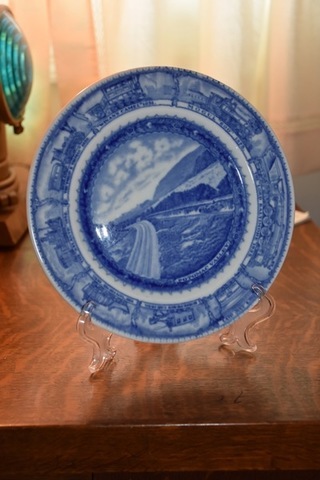 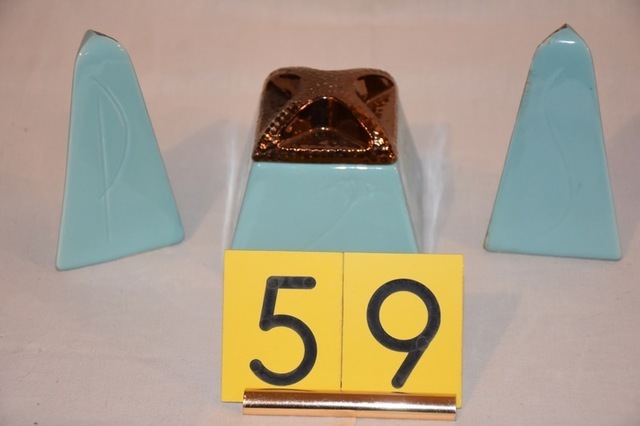 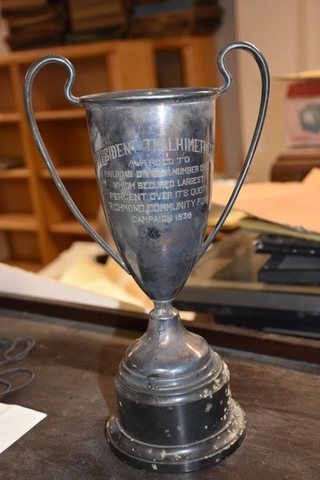 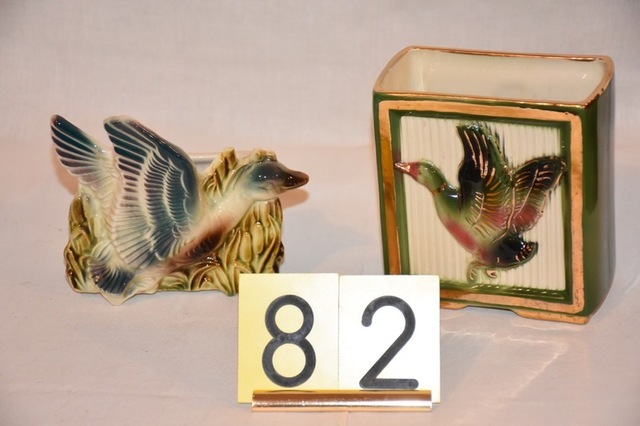 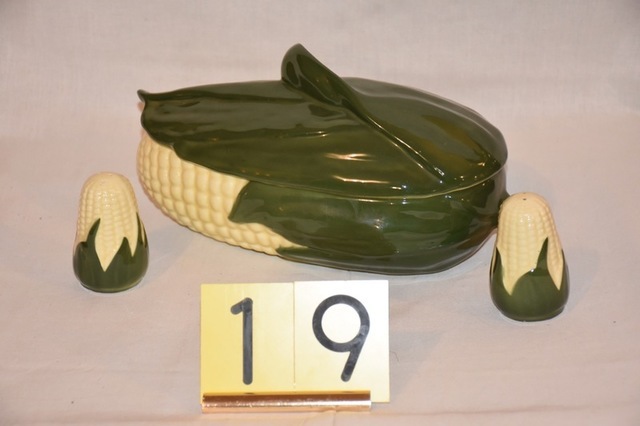 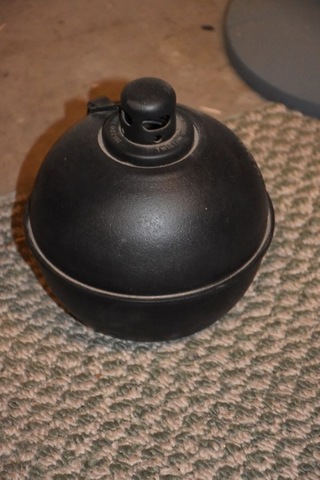 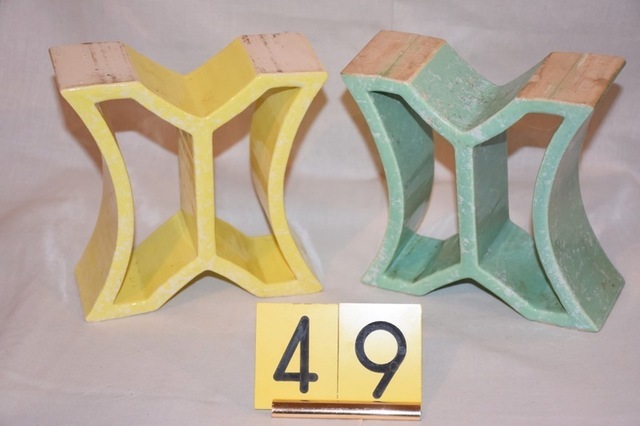 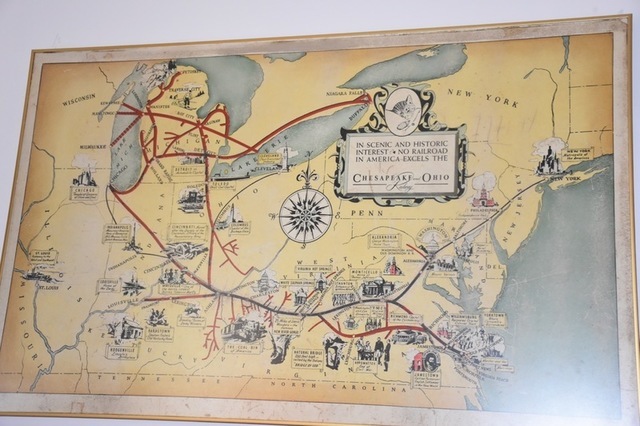 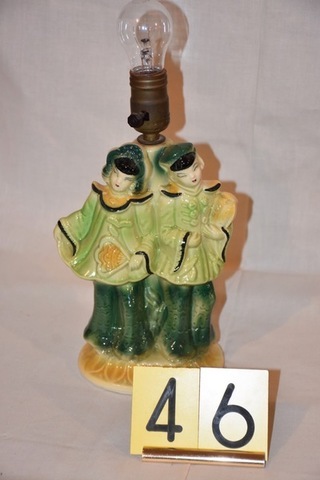 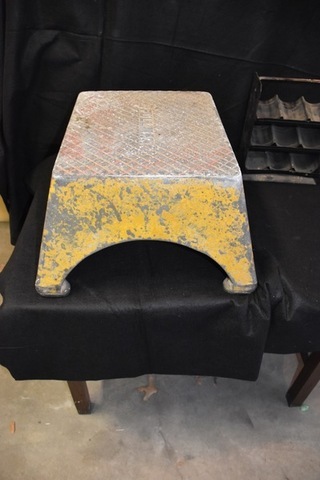 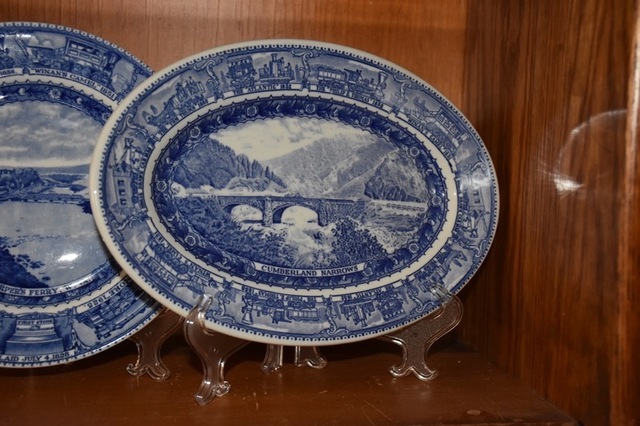 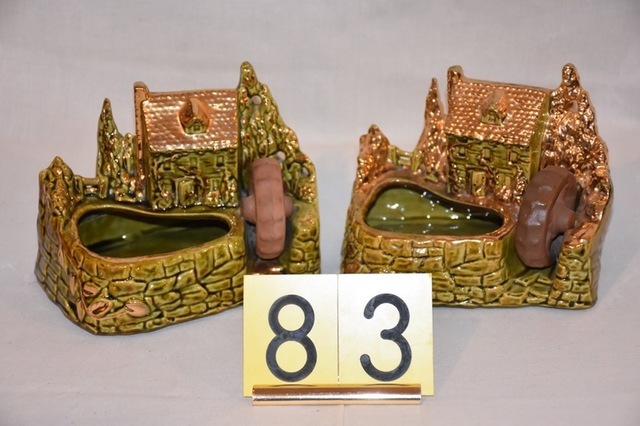 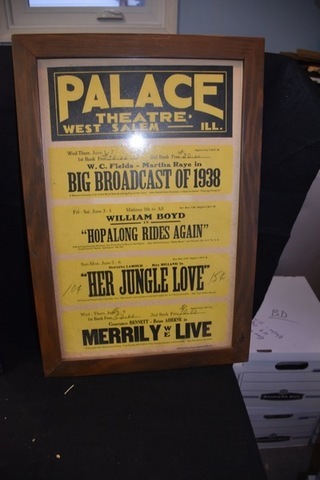 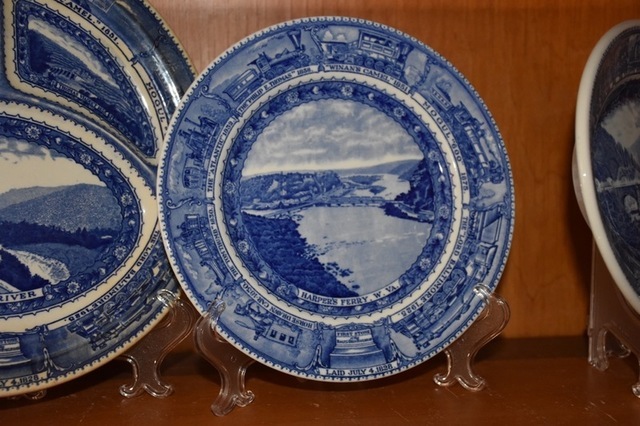 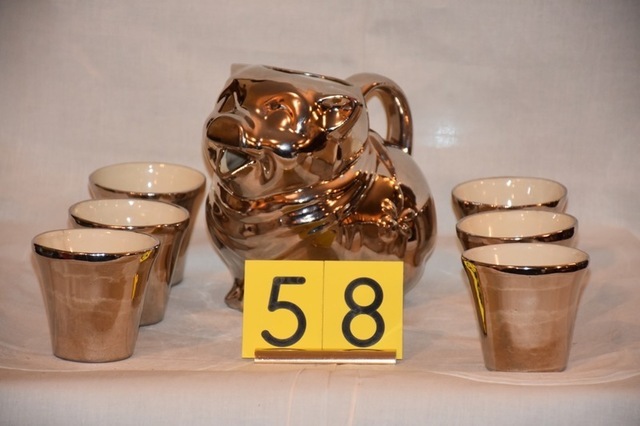 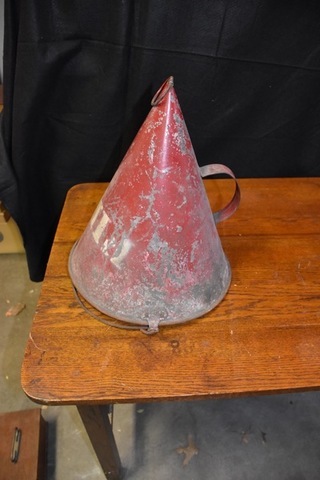 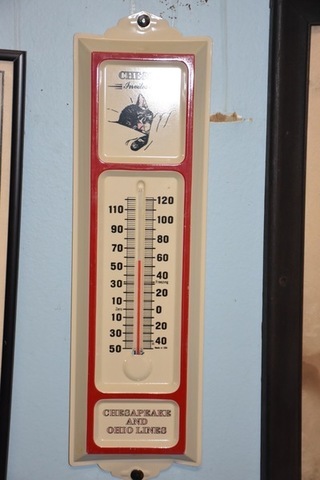 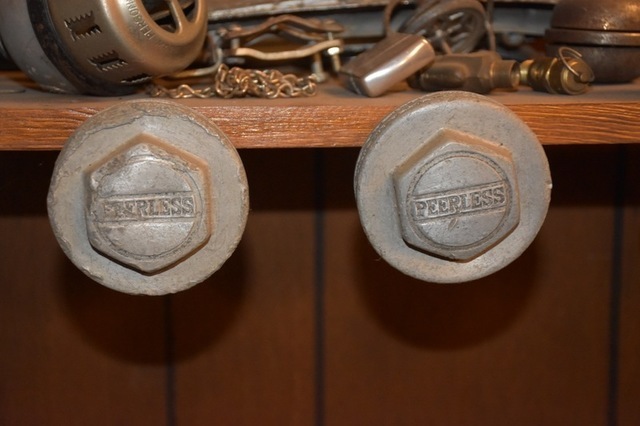 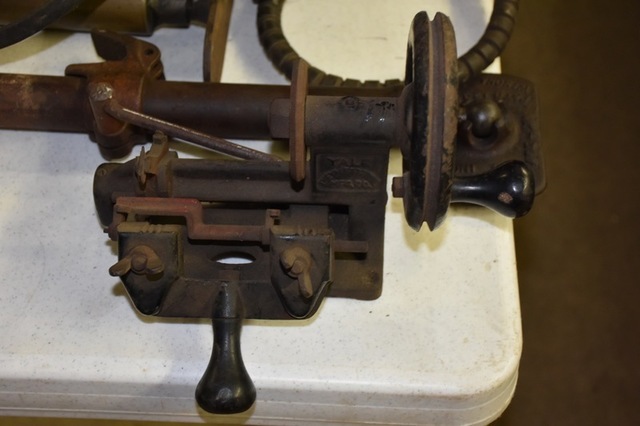 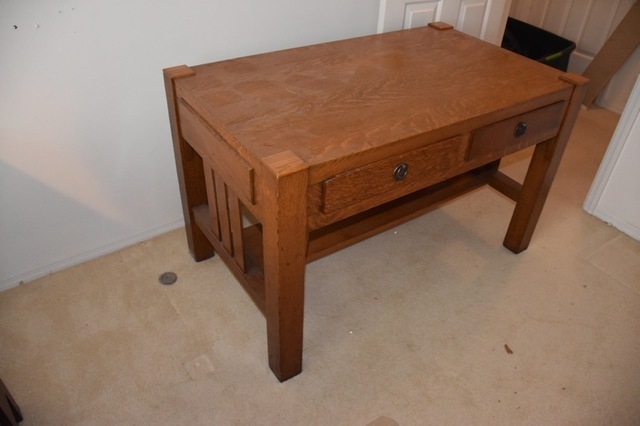 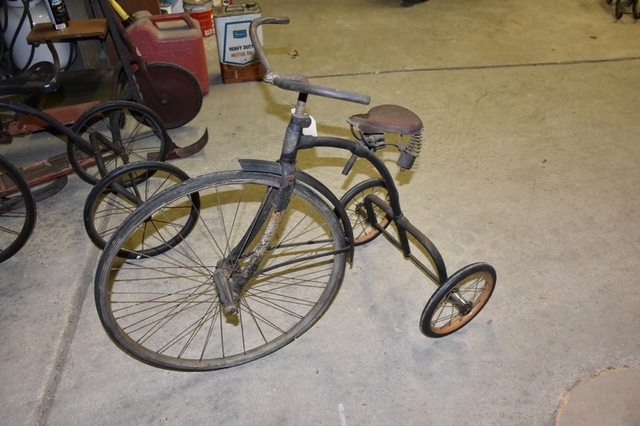 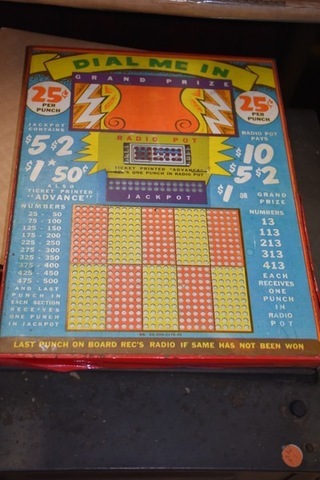 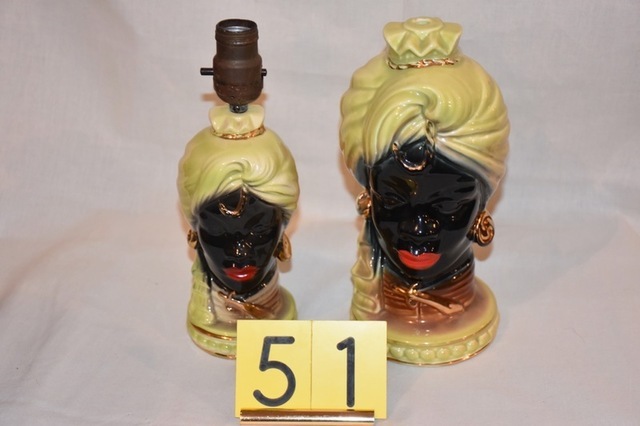 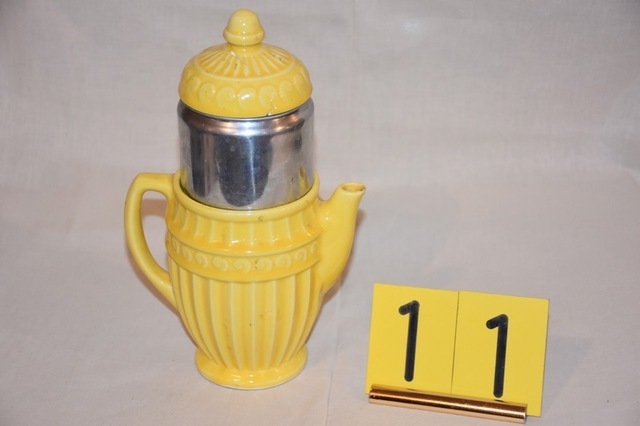 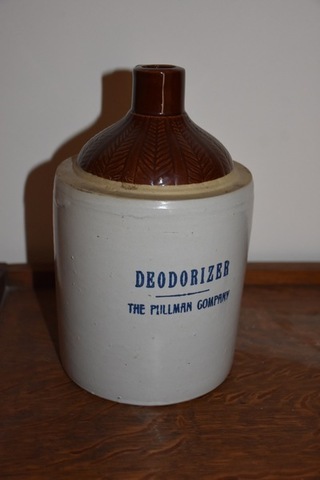 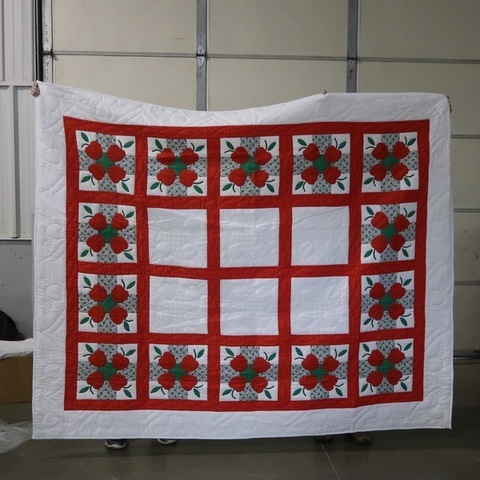 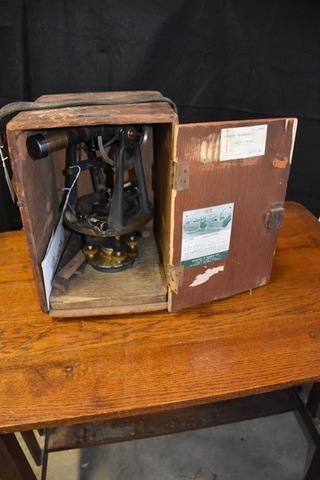 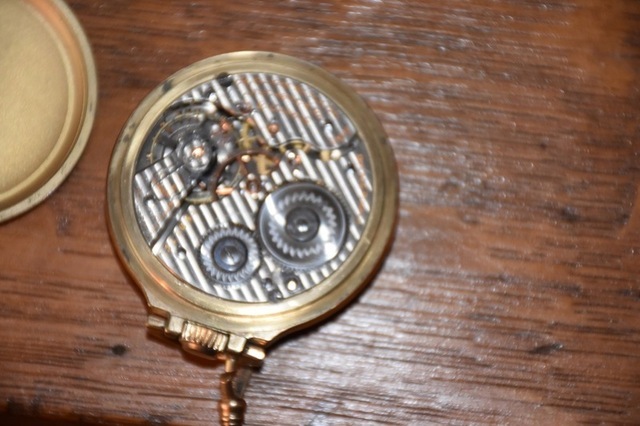 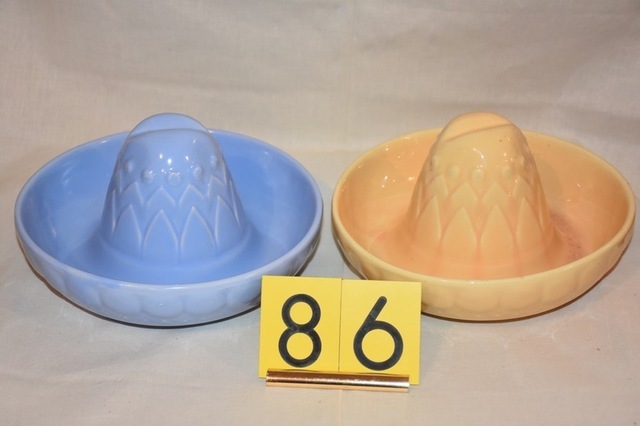 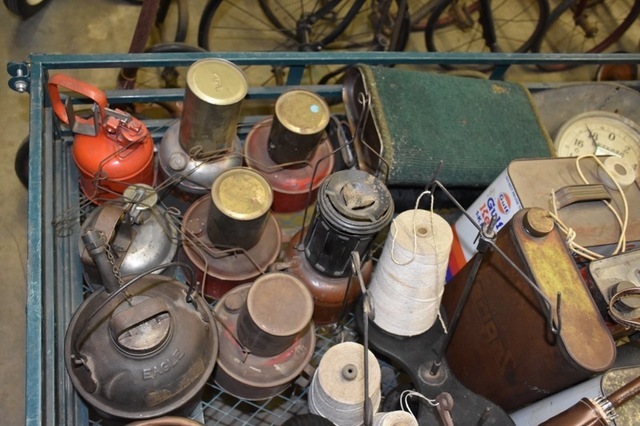 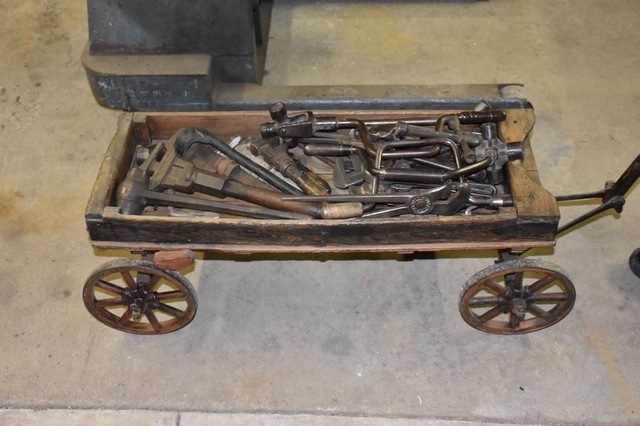 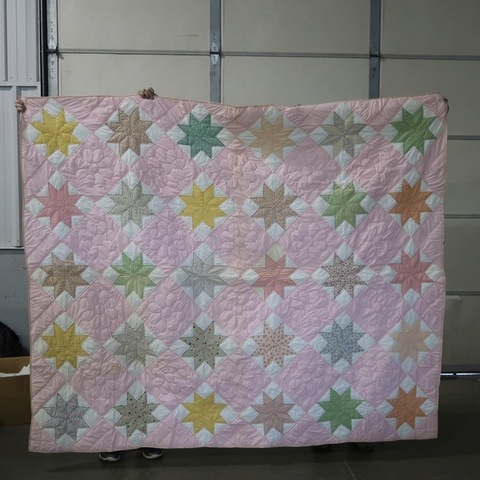 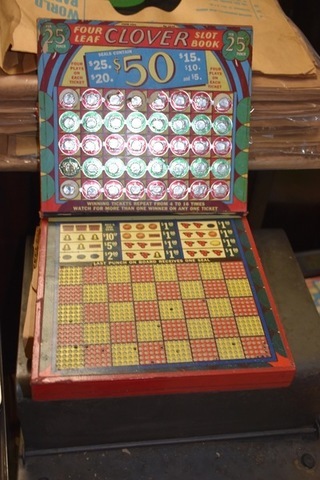 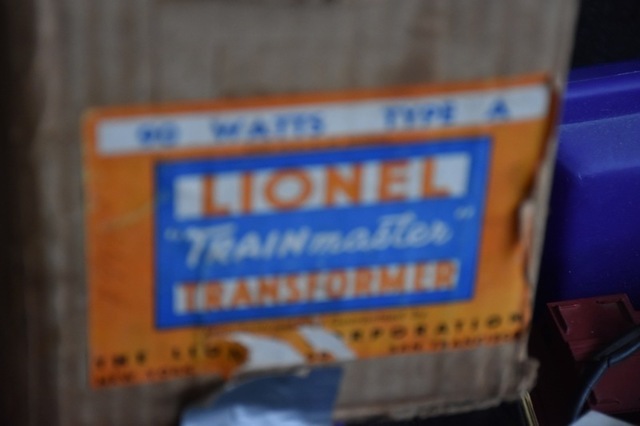 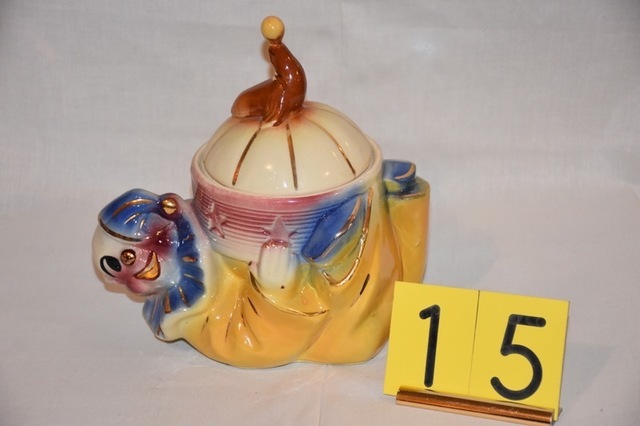 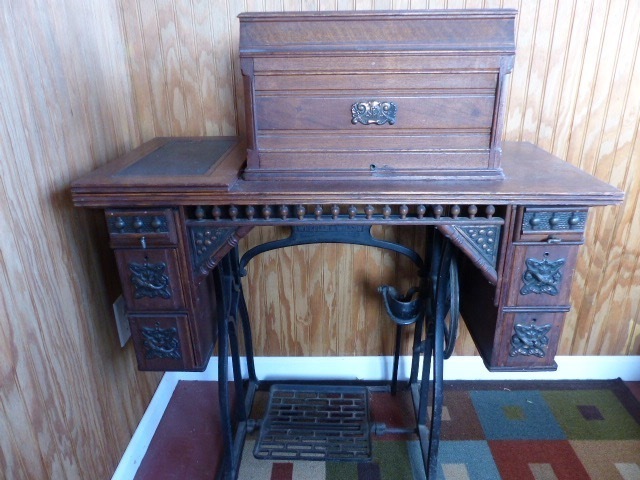 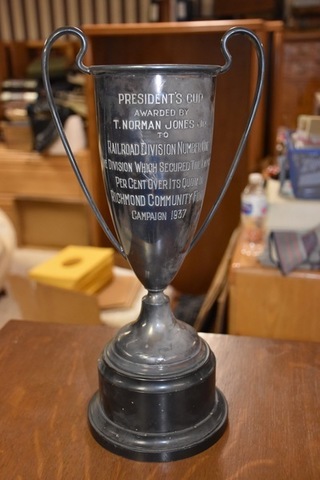 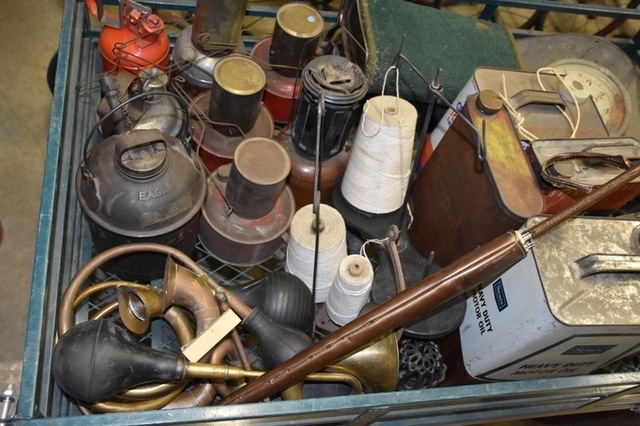 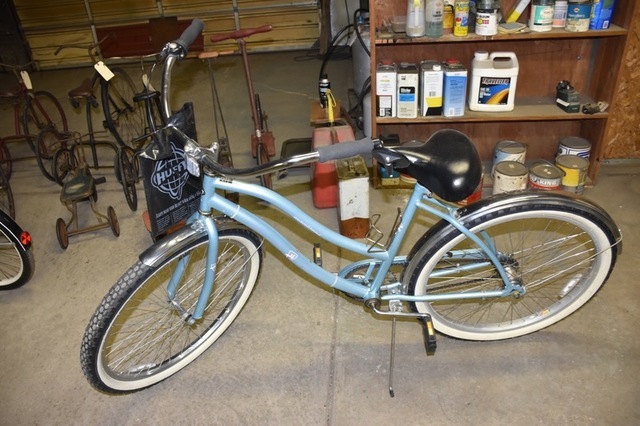 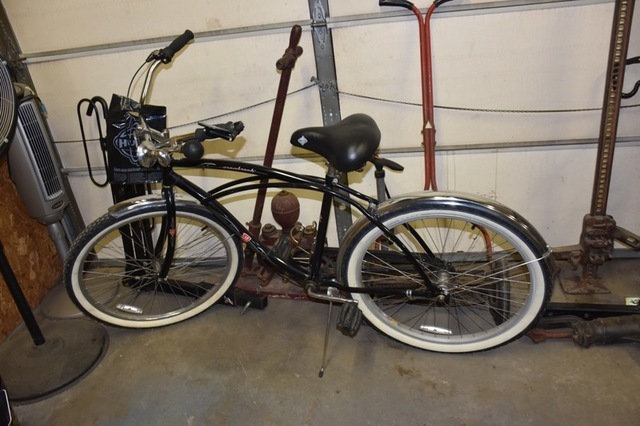 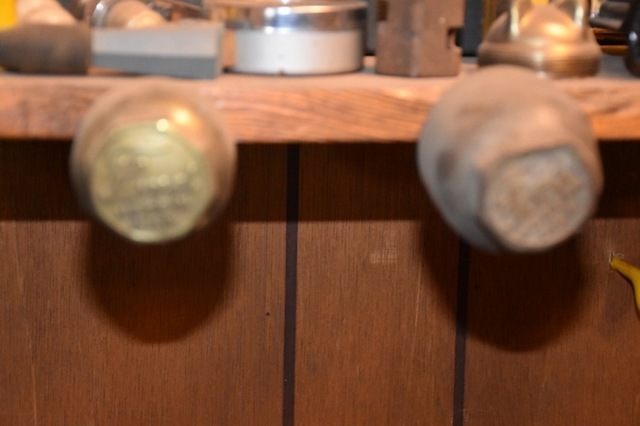 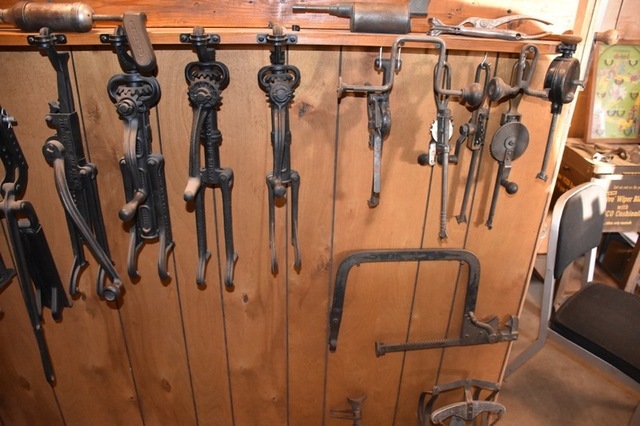 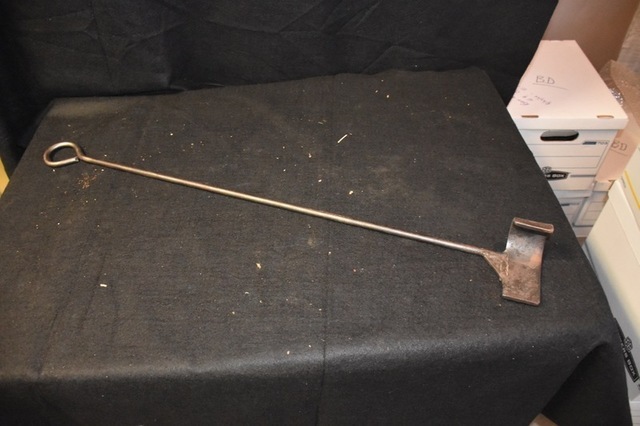 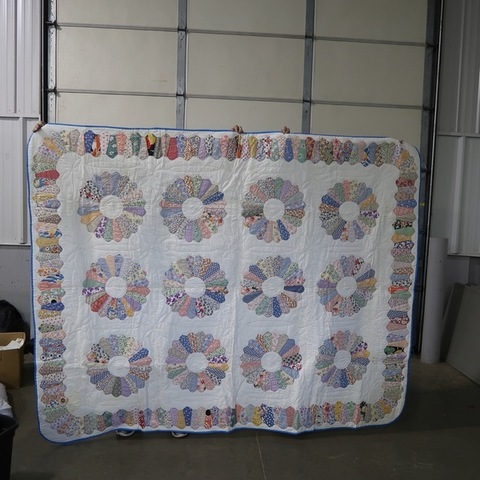 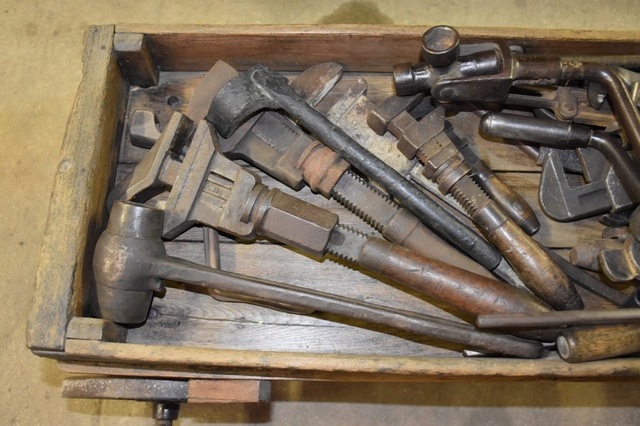 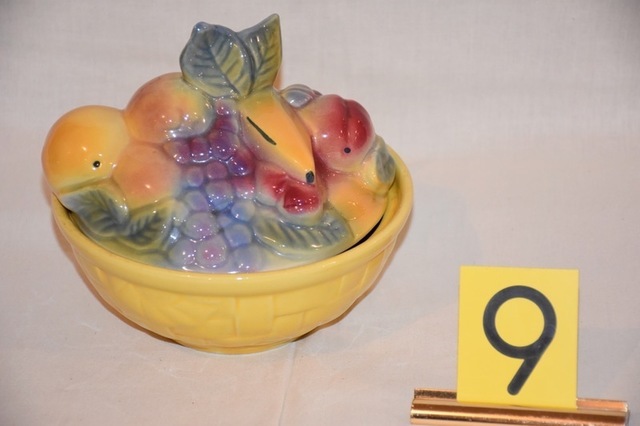 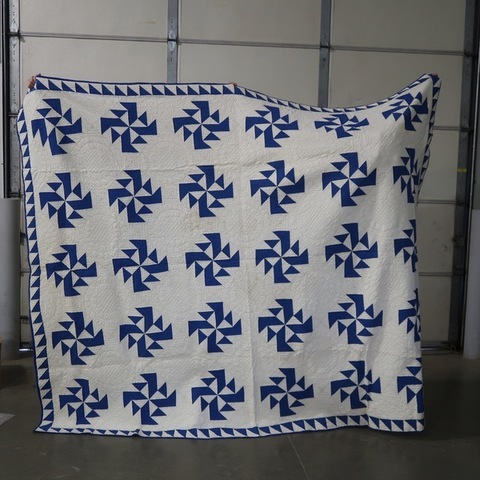 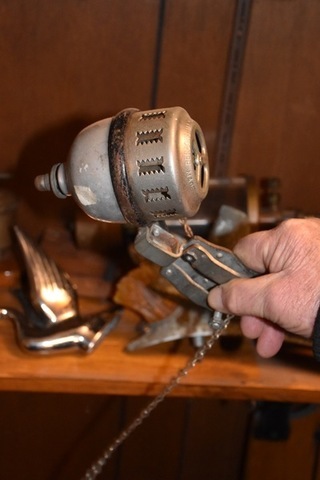 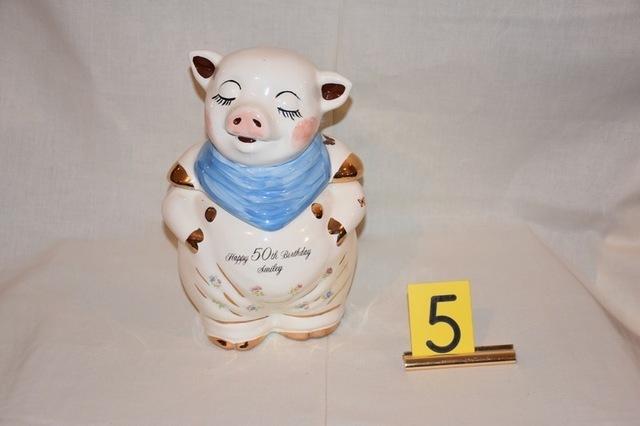 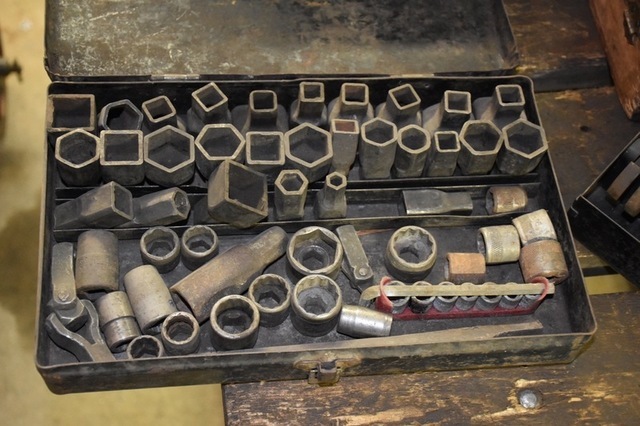 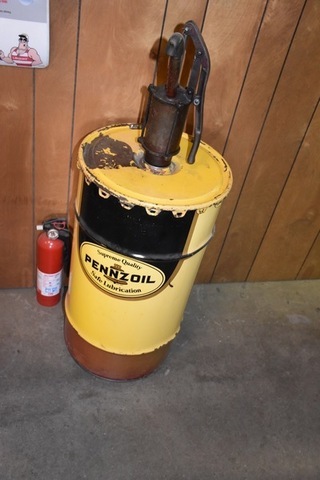 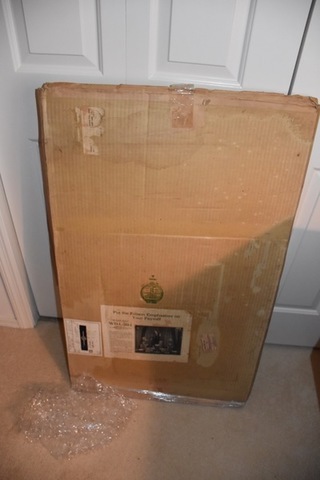 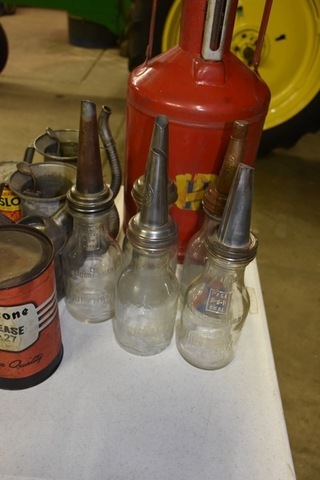 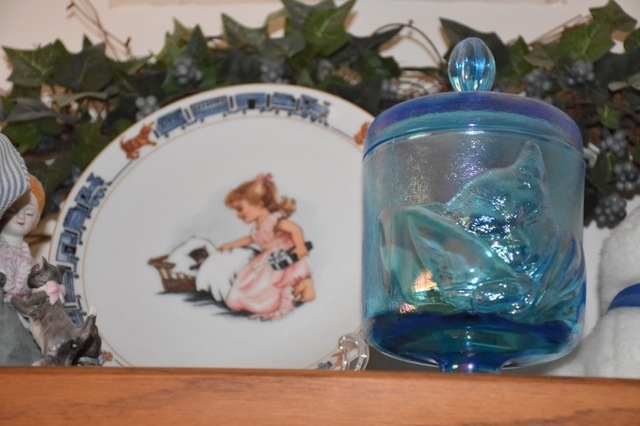 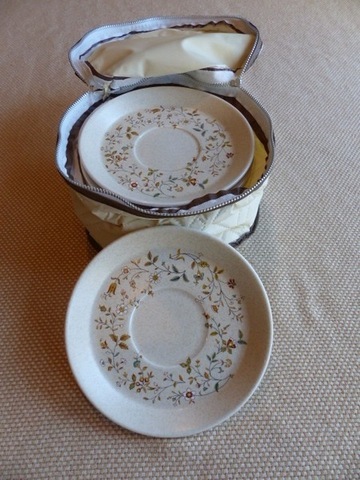 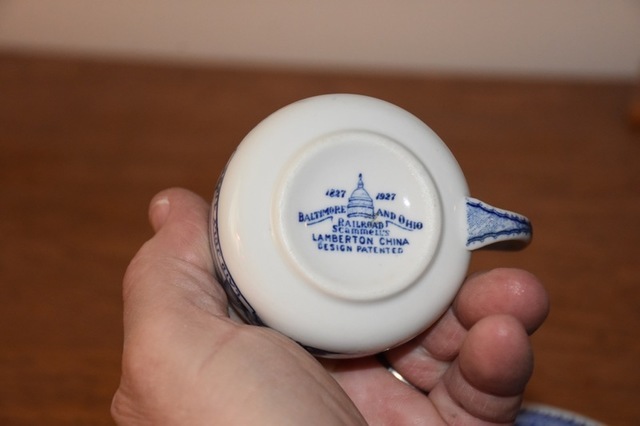 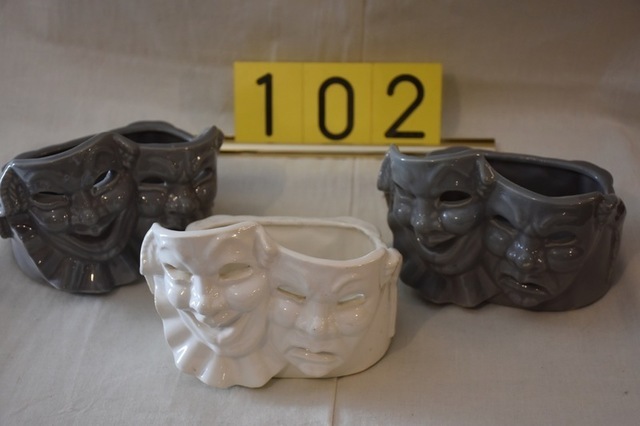 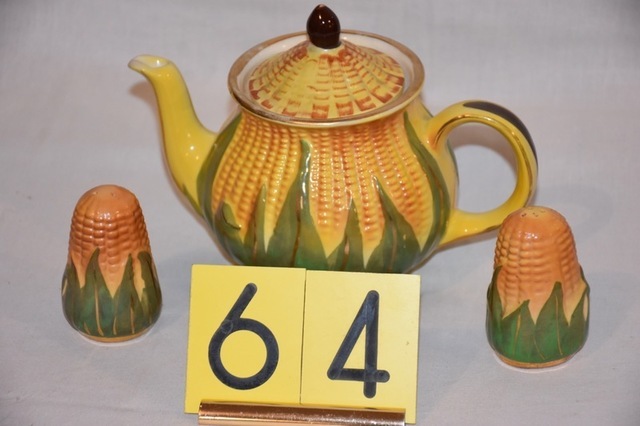 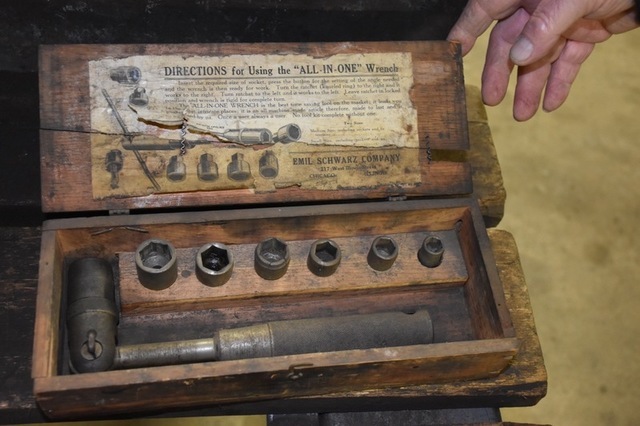 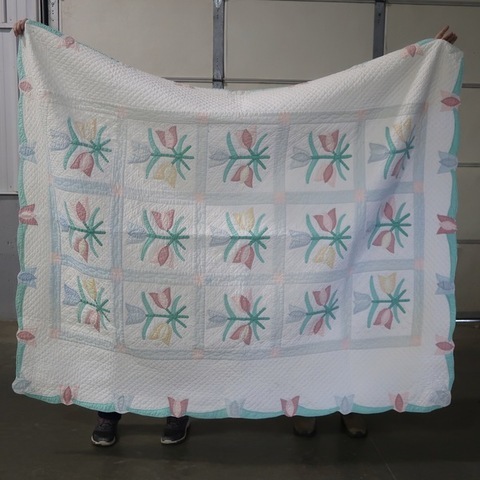 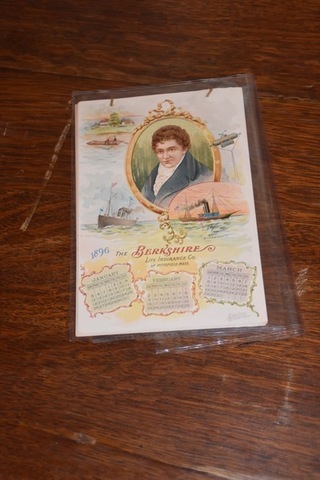 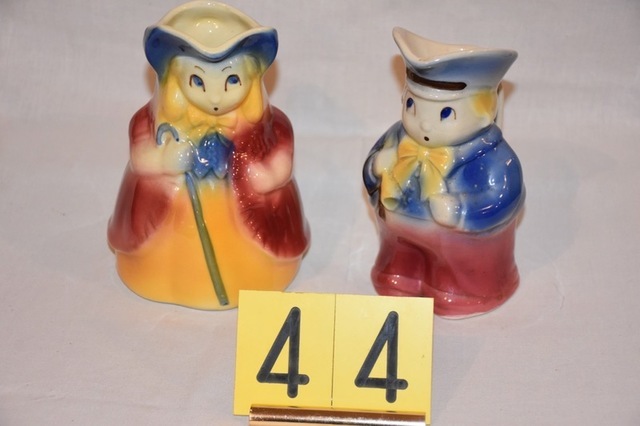 Friday Morning, May 10th, 2019 – 9:30 A.M.
‹ A great Antique Event – Thursday Morning, May 16th @ 9:30 A.M.